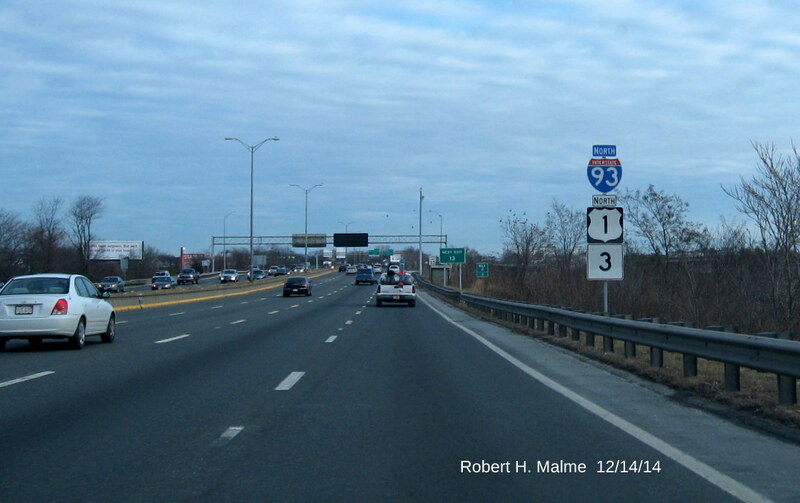 Other than the one last overhead sign, it appears most of the remaining I-93/US 1 guide (paddle) signage that remained to be changed in December has now been replaced. 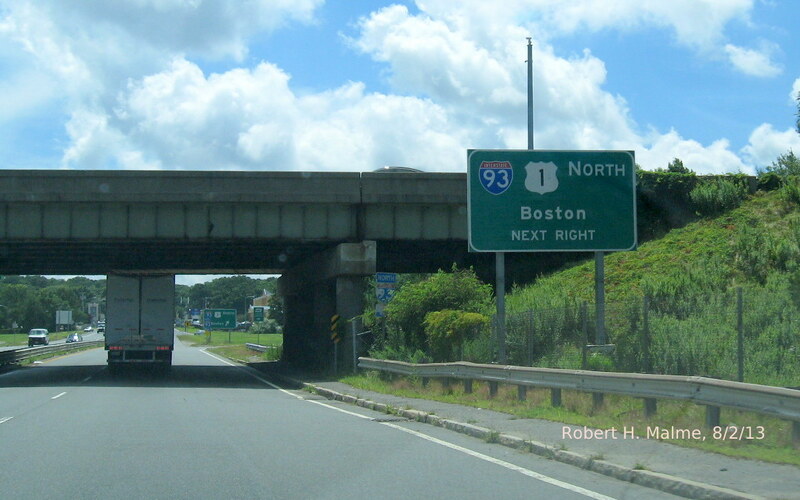 A subsequent trip up I-93 will hopefully get photo confirmation. 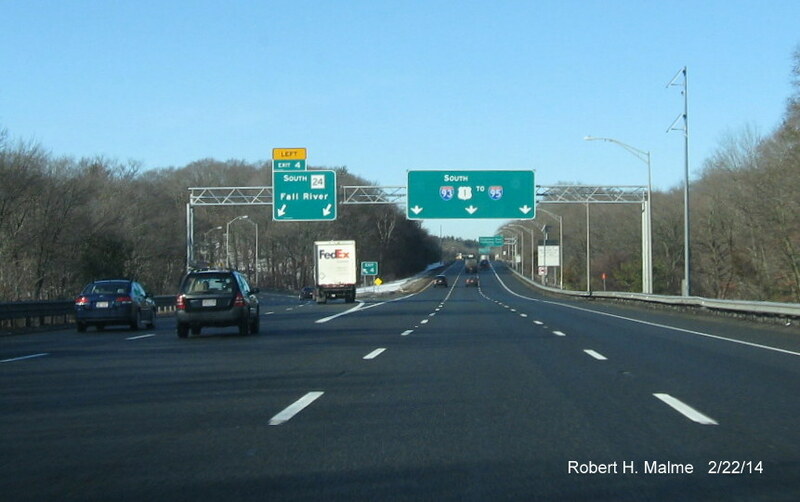 Once the final sign is up, this will complete the sign update projects along the entire stretch of I-93 in Massachusetts. 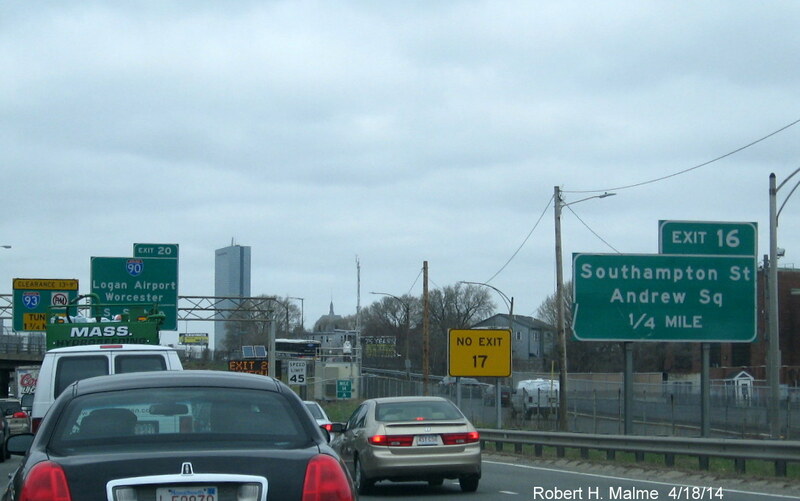 Up next, revising the exit numbers to mile-post numbers, as part of MassDOT's plan to conform to national signing standards. 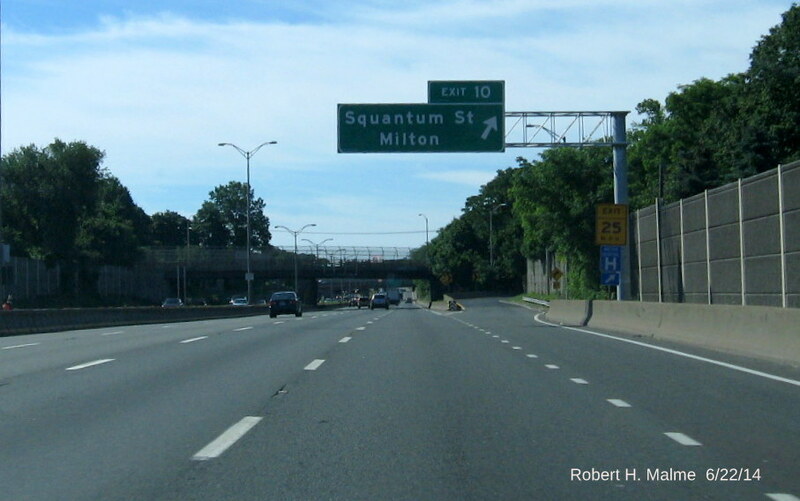 This is scheduled to happen sometime between 2016 and 2020. 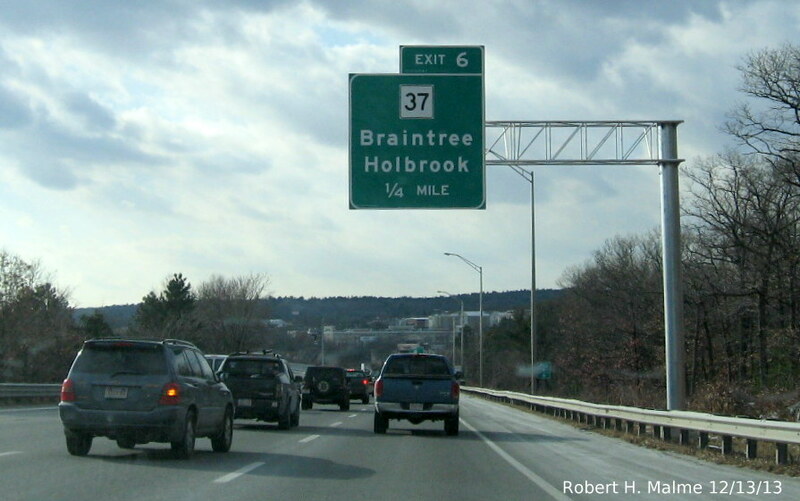 For a list of probable new exit numbers, go to my I-93 Exit List. 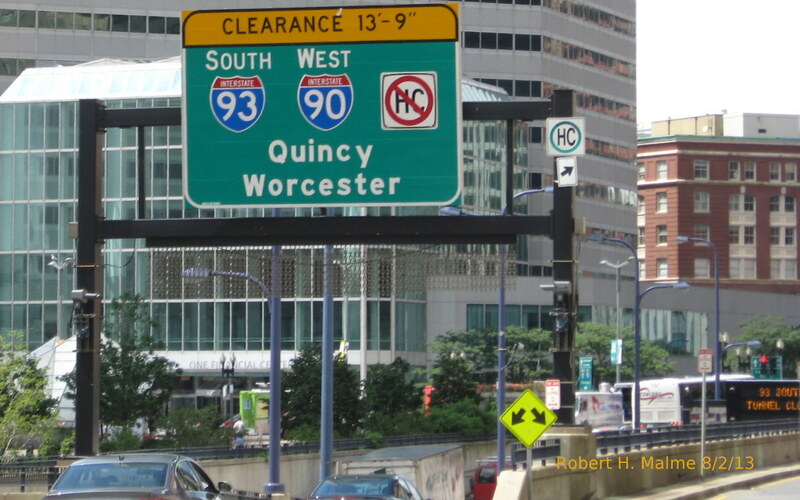 That's it for the new overheads, the only remaining sign due to be placed, based on the project plans, is the last one northbound for the Mass Ave. exit ramp combining the current sign to the left about tunnel HazMat restrictions and replacing it with an I-93 Tunnel 1 1/2 Miles Ahead Advisory sign. 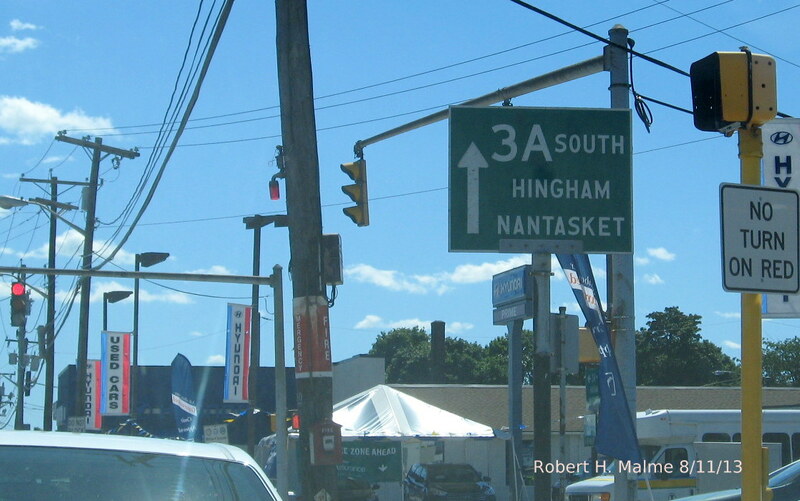 Don't know how long this sign will last at this busy intersection. 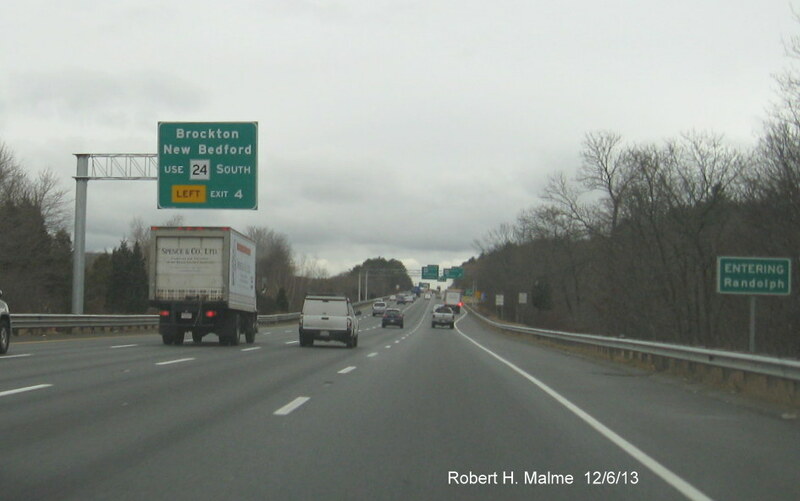 I did not check to see if there was also a MA 3 South one going the other way. 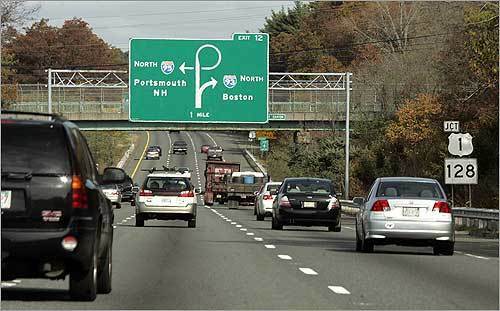 The project, according to MassDOT, is now 94% complete and may wrap up before the New Year. 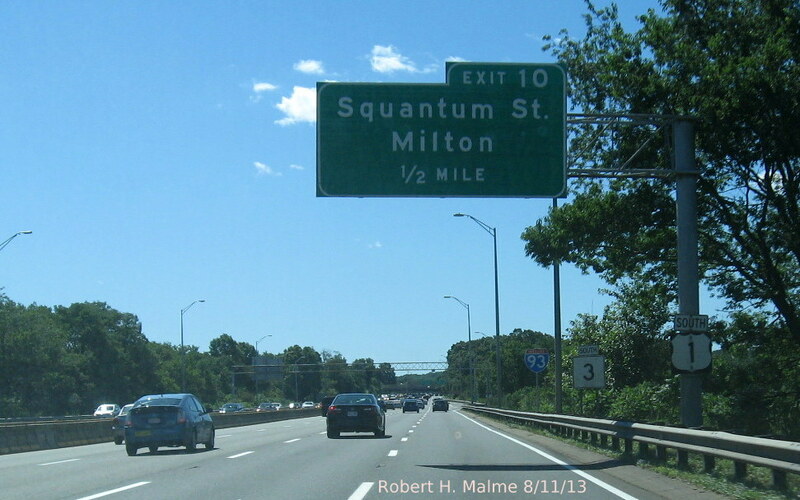 I'll post any remaining new signs when the project is officially complete. 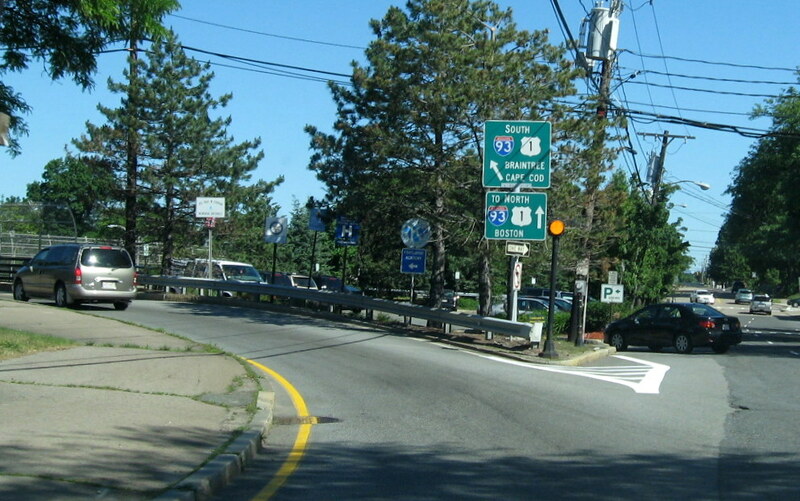 The shields are posted at the end of the on-ramp and before the next set of overheads. 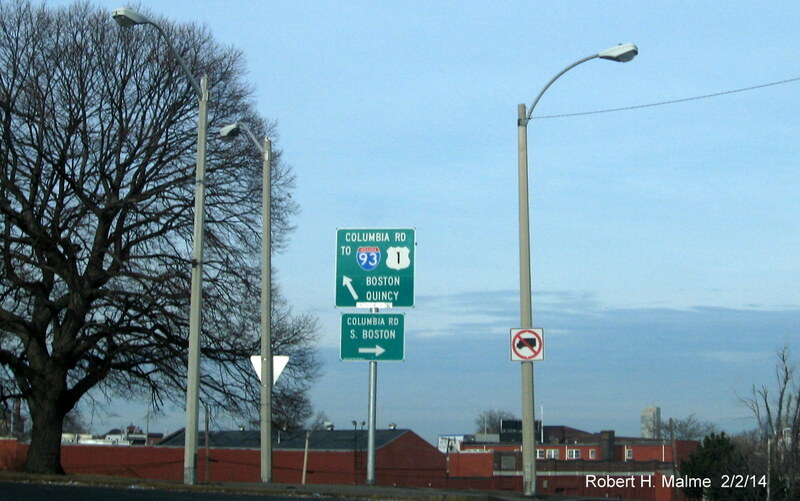 There is an additional northbound set beyond Columbia Road, no photo. 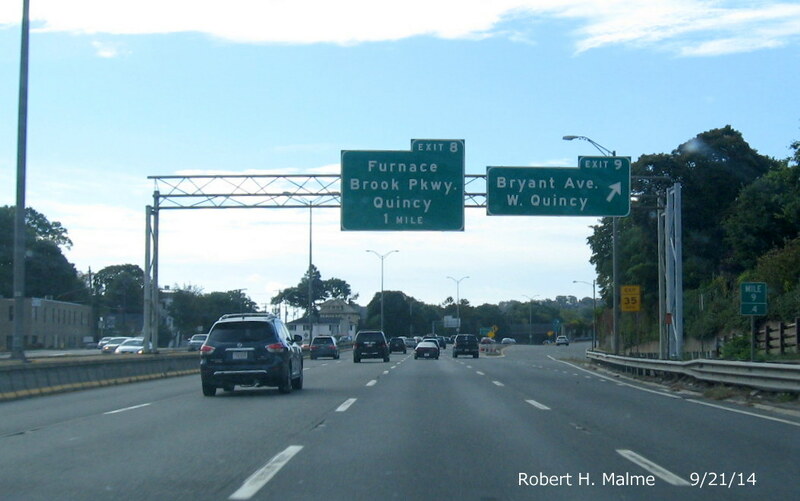 According to the latest contractor report, made earlier this week, the sign replacement contract is 90% complete. 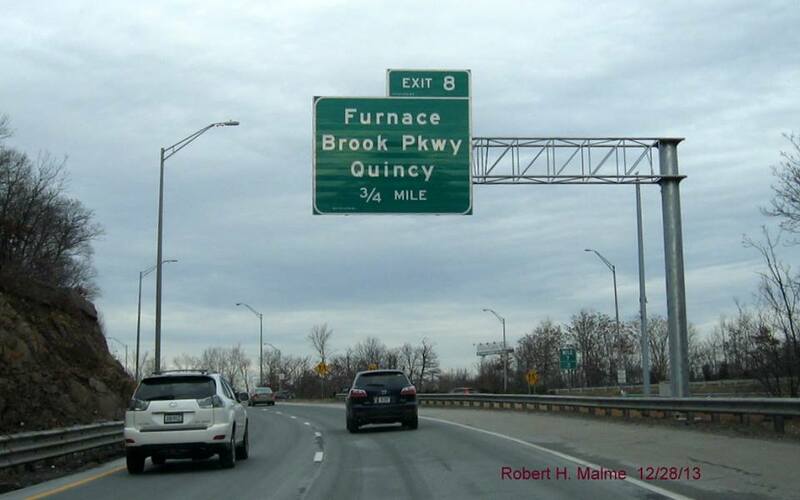 The remaining work includes placing at least 2 more overhead signs and at least 1 reassurance marker placement after the Furnace Brook Parkway on-ramp in Quincy, and any missing punch list items. 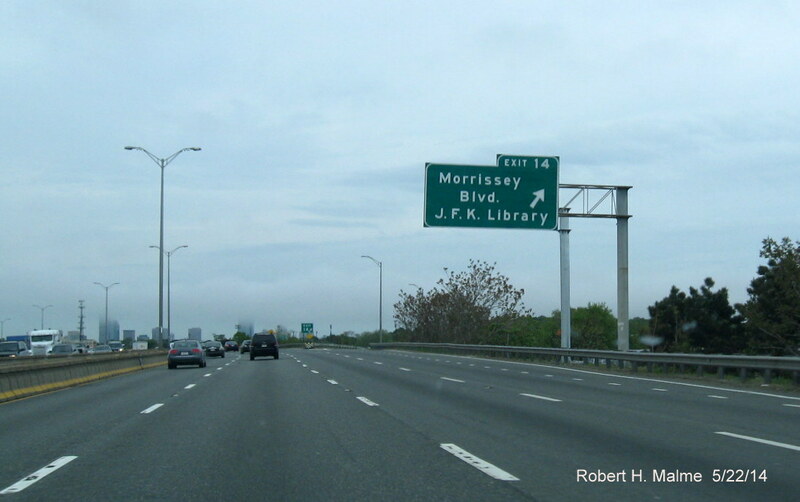 The End is Near. 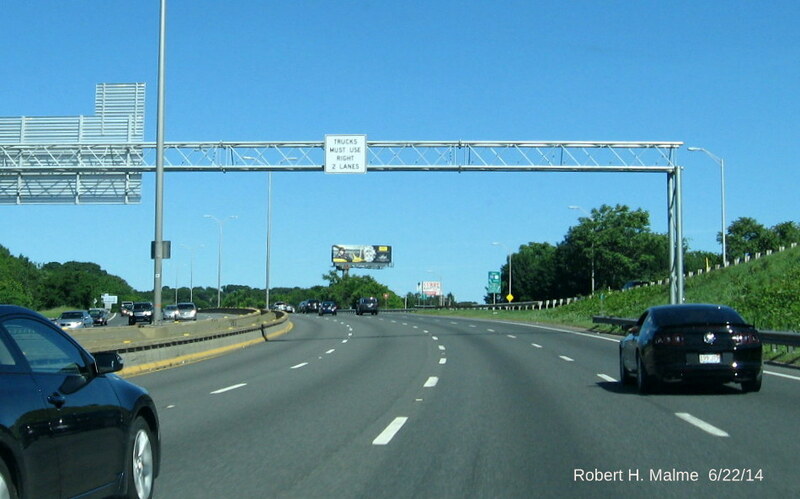 I do have a question about why the reassurance shield stack has only 2 directional banners? 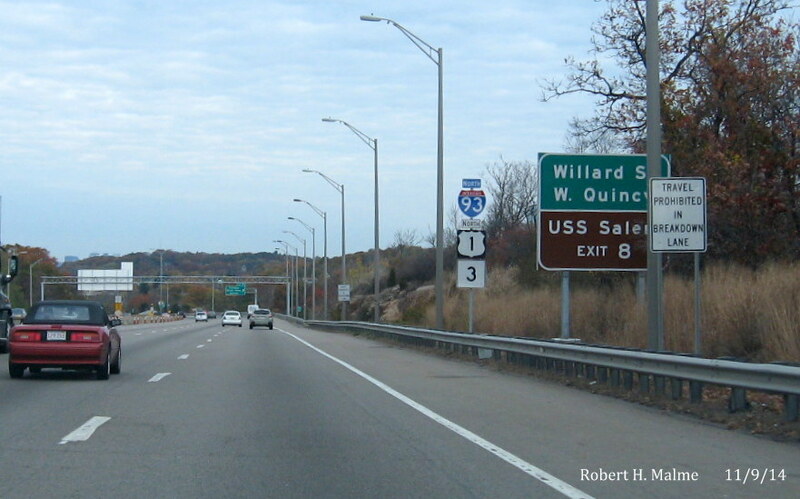 Is this simply a way to save money, but then why the banner over the US 1 shield? 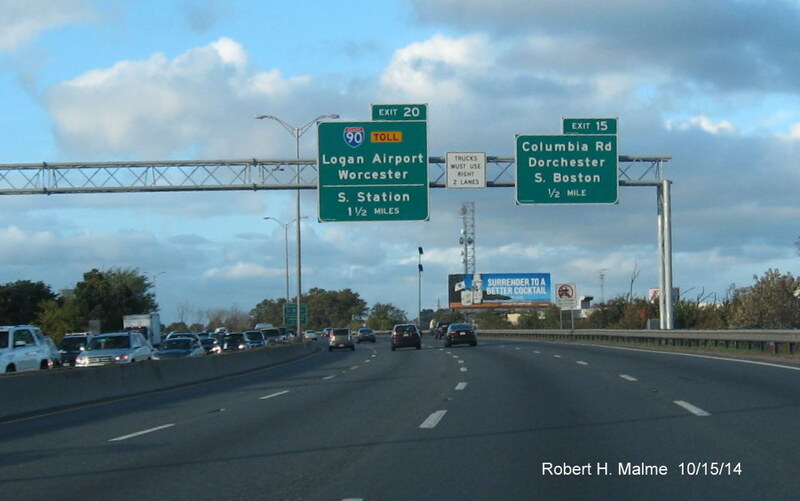 The reassurance markers put up along I-95/128 between US 3 and I-93 only have the one blue directional banner. 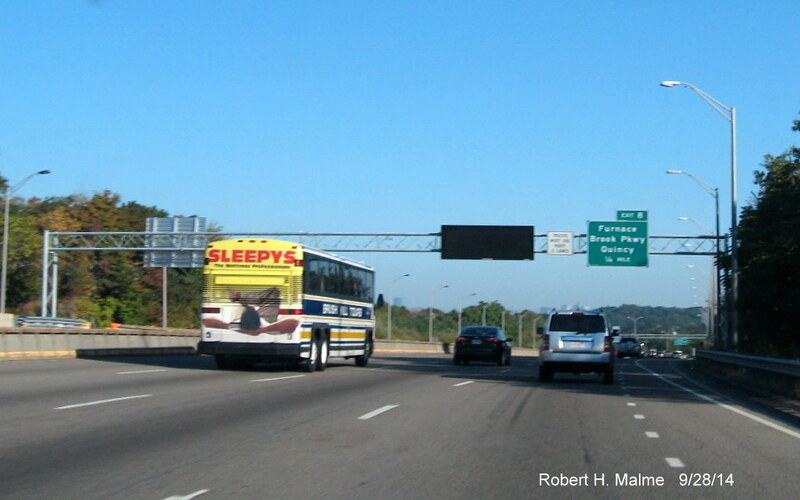 The other possibility is to make it easier to remove the MA 3 shield sometime in the future if the route is decommissioned. 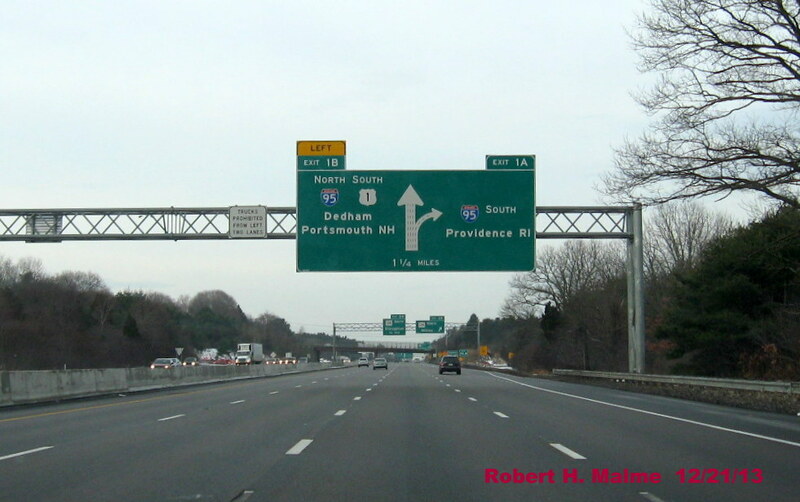 Since there are no MA 3 shields on the overhead signs (except for Exit 7, which could be replaced by another shield, interstate perhaps? 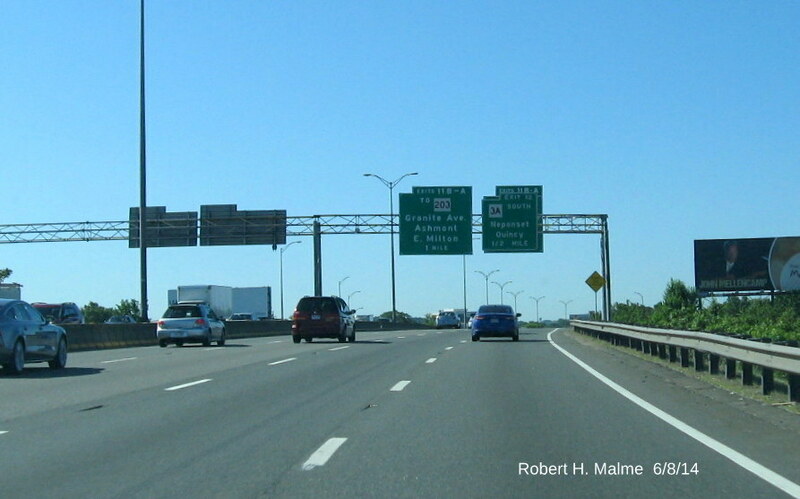 ), or new MA green (paddle) guide signs, all you would need to remove the route is take the shields off of the reassurance posts and take down the auxiliary trailblazers at some of the on-ramps. 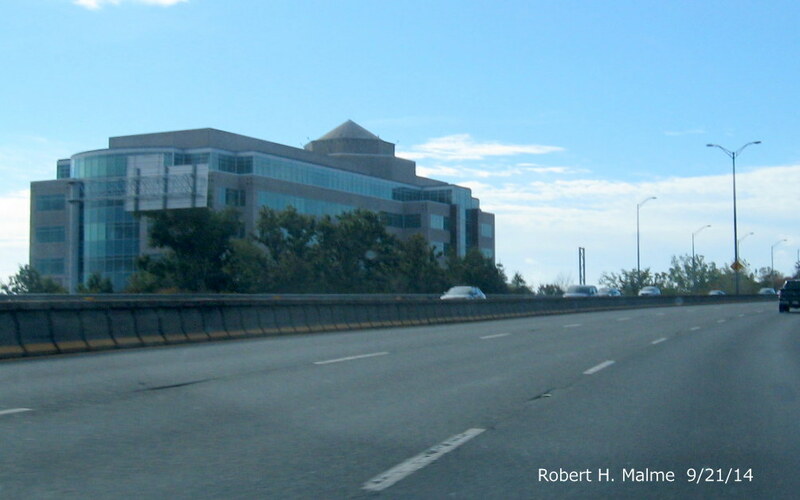 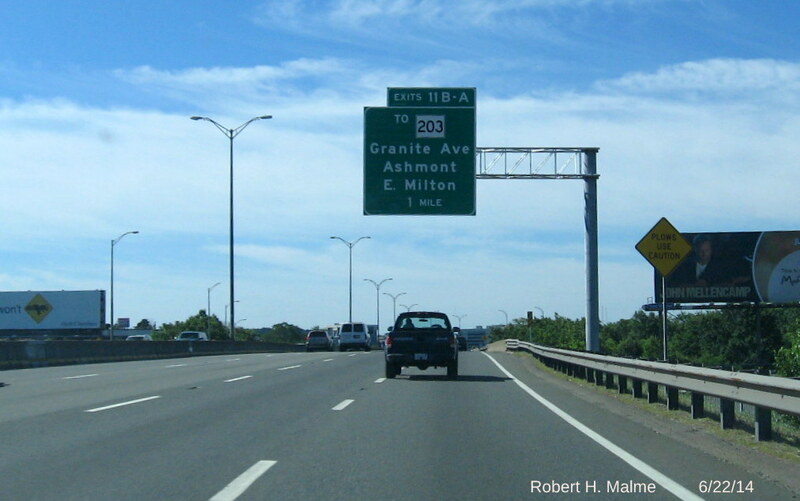 Does MassDOT have a plan to decommission MA 3 in the works? 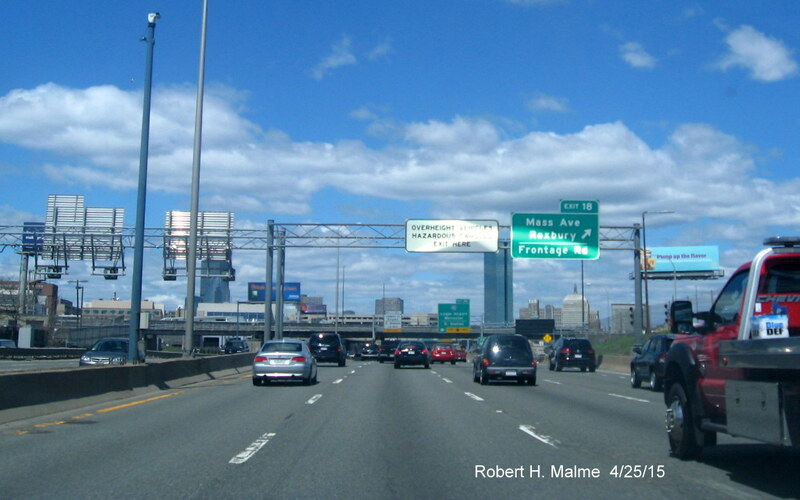 The advance sign for I-90 is also for the Mass Avenue Exit, 18, but only the 20 number is used. 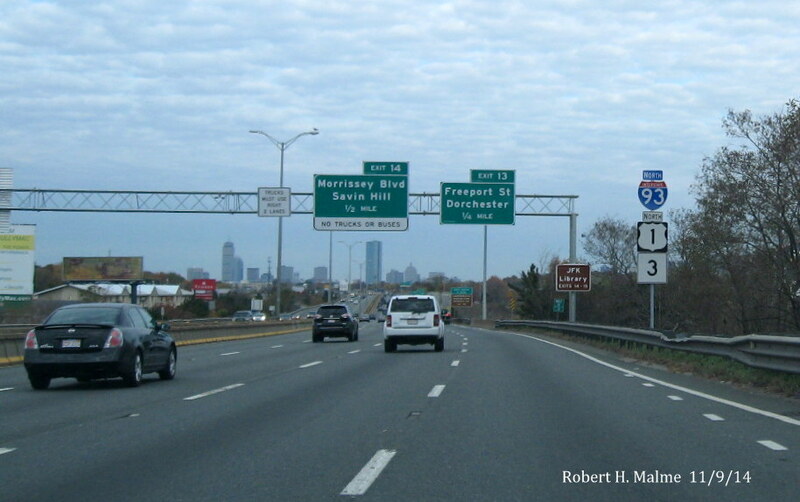 Also the original plans had no yellow Toll banner next to the I-90 shield, and does not have a Mass Pike logo shield like similar signs on I-95. 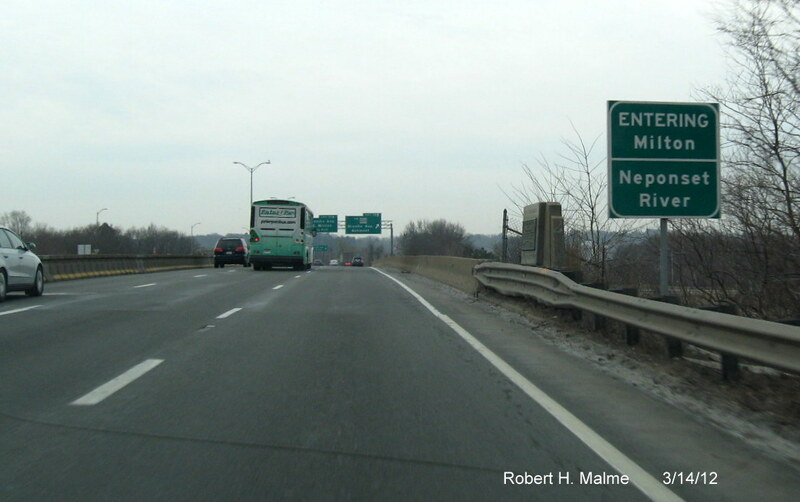 The ramp sign for Exit 15 is actually about 1/4 mile ahead of the exit ramp, despite that the overhead advance for Exit 16 still reads 3/4 Mile as the former overhead that was at the ramp itself. 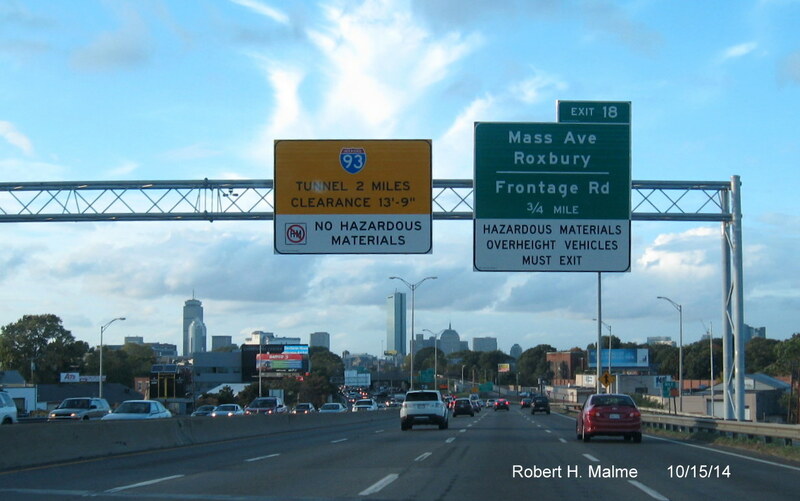 Is of similar design except with the HOV lane notice replacing the I-93 Tunnel advisory sign, that will be paired with the final new Mass Ave. ramp sign which has not been put up yet. 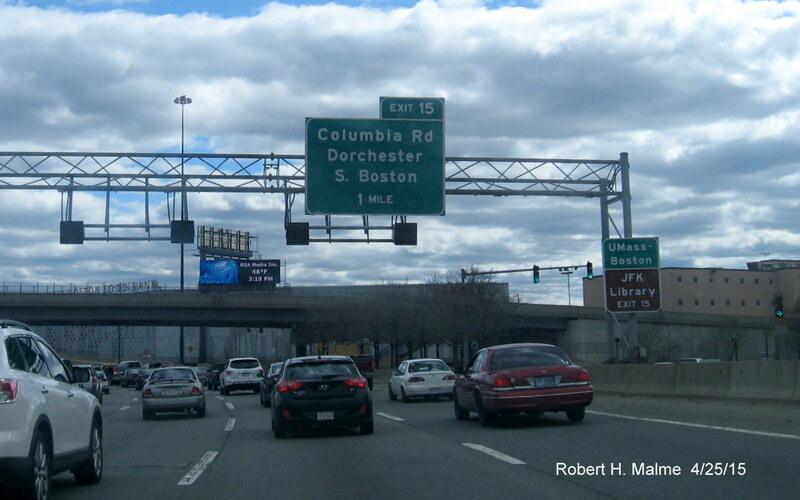 That and an advisory sign for the southbound HOV/Zipper Lane on one of the Columbia Road sign gantries appear to be the only overheads remaining to be placed. 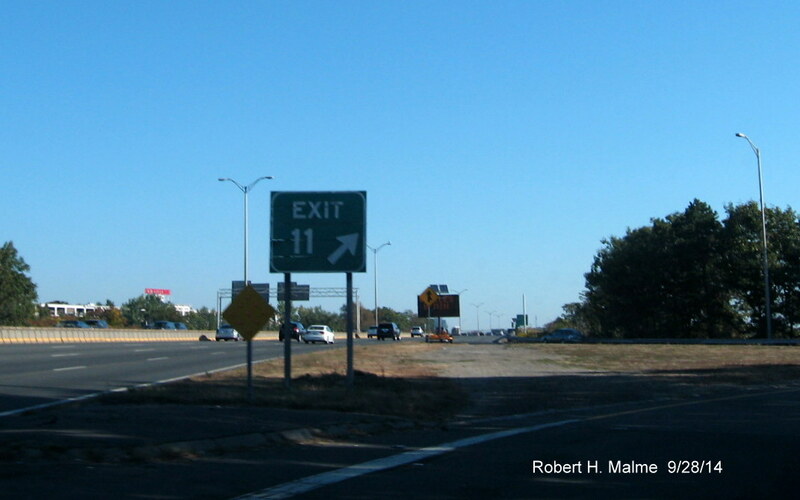 You may have also spotted to the right the old button-copy Exit 16 gore sign which also needs to be replaced. 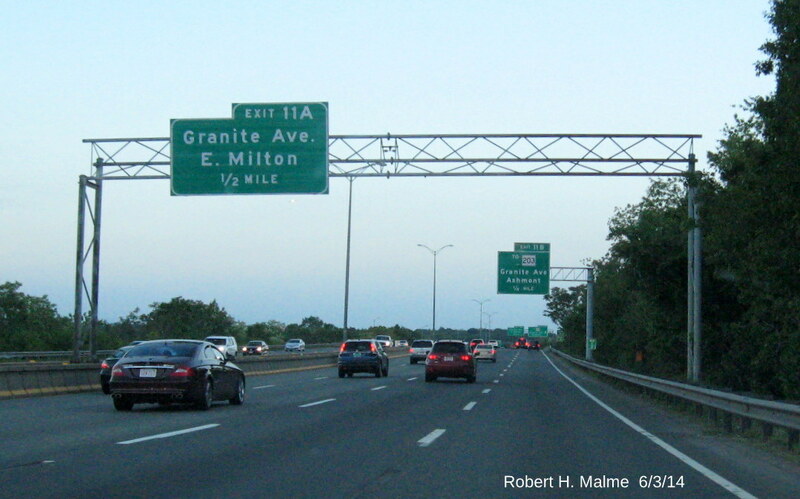 The gantry here holds both a new VMS and the lone remaining needed advance sign for Exit 8. 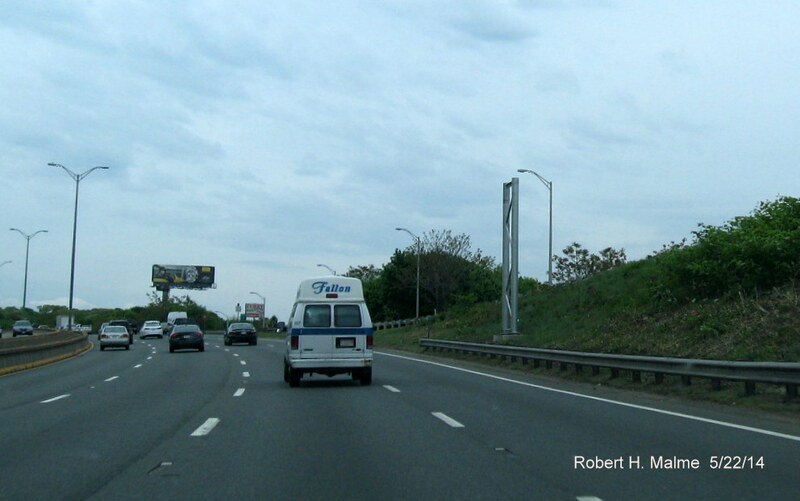 Along with another new permanent VMS. 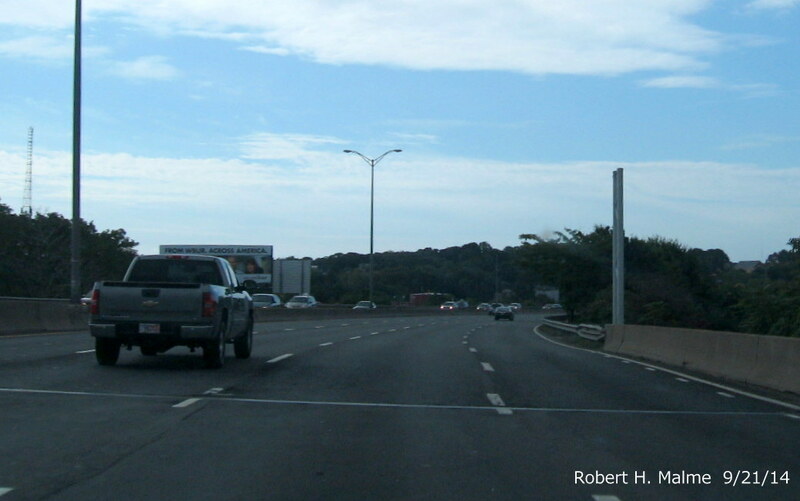 The previous overhead was slightly north of here and a cantilever of a 1/2 mile advance for Exit 8. 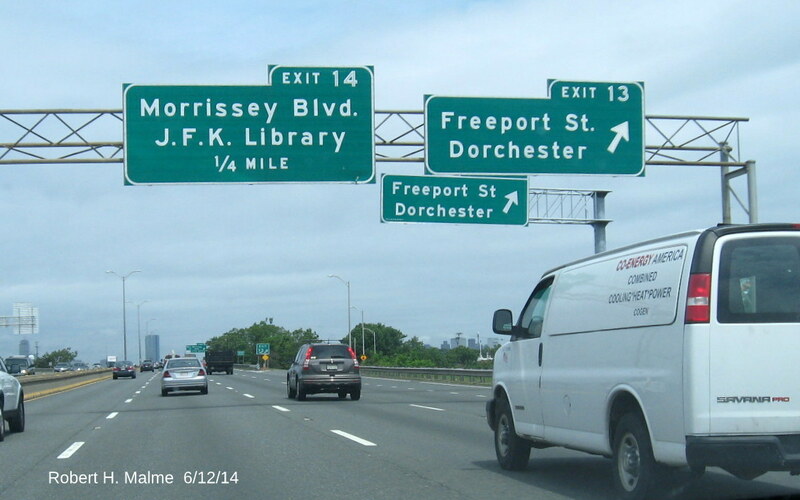 There are still a couple needing replacing along Morrissey Blvd and at the Freeport Street on-ramp to the Expressway southbound. 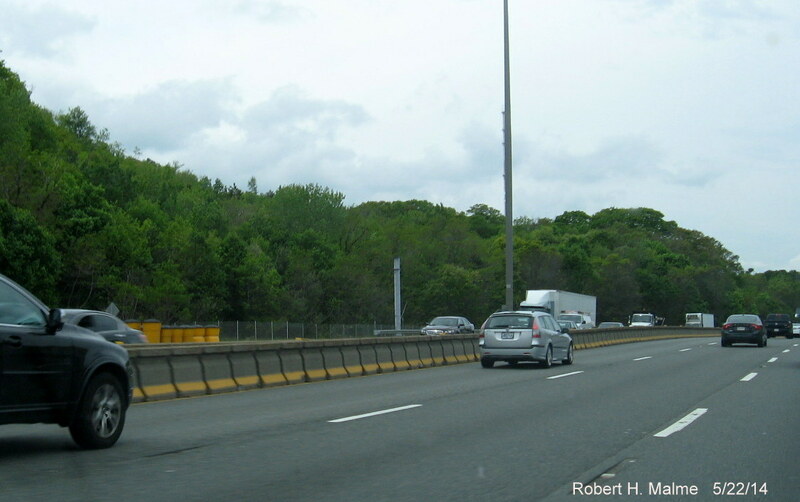 Also, there has been no further placement of reassurance markers along the Expressway, except after Exit 9 northbound. 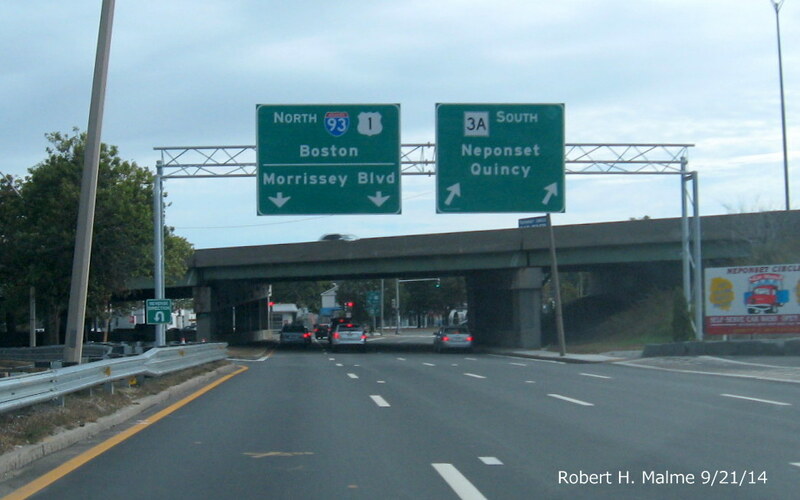 Plans call for new signage after every on-ramp northbound with the exception of Exit 11, and southbound, except for after the on-ramp from Morrissey prior to Exit 12. 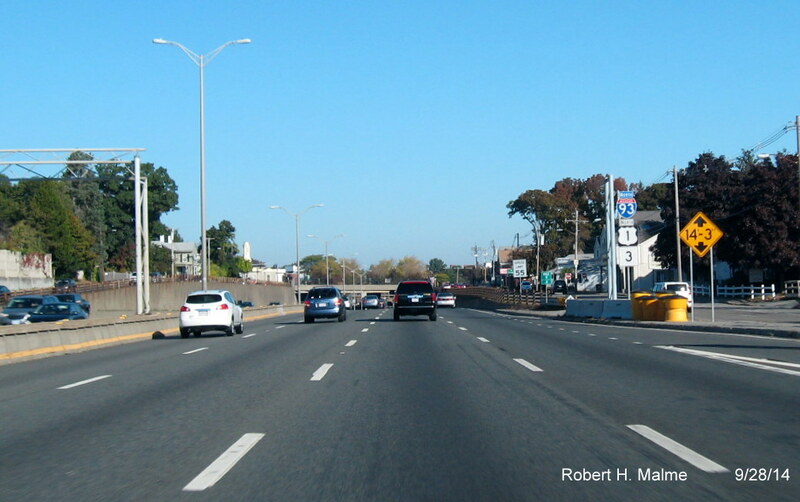 The contractor reports they were 83% complete as of October 10. 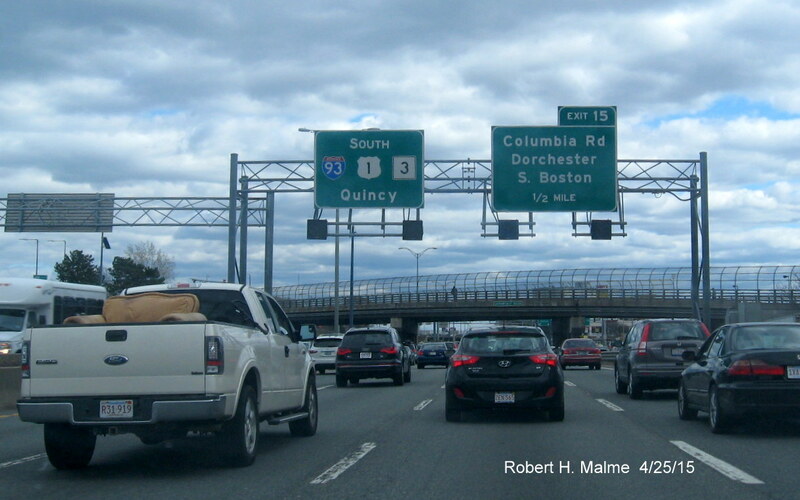 Of the remaining needed signs northbound for Exits 15, 16, 18 and 20, not shown here, at least one is up for the Mass Ave exit, seen on a traffic camera, and there may be more around Columbia Road. 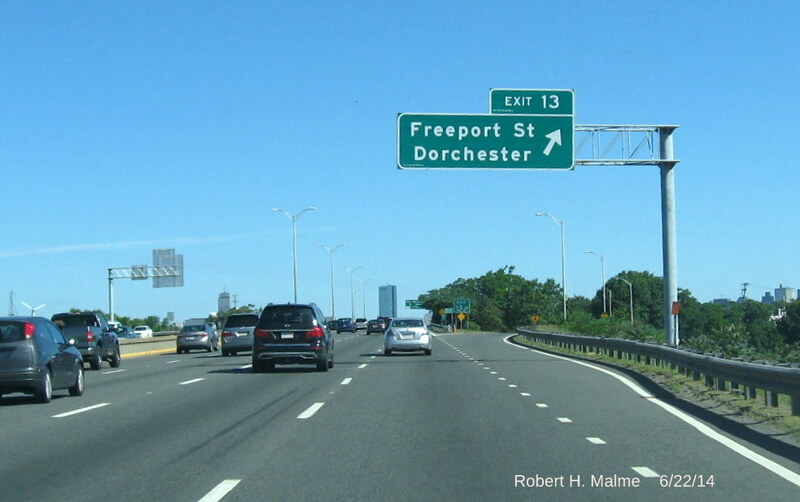 I have not traveled north of Freeport Street in the past month, but hope to soon to witness the completion of this project. 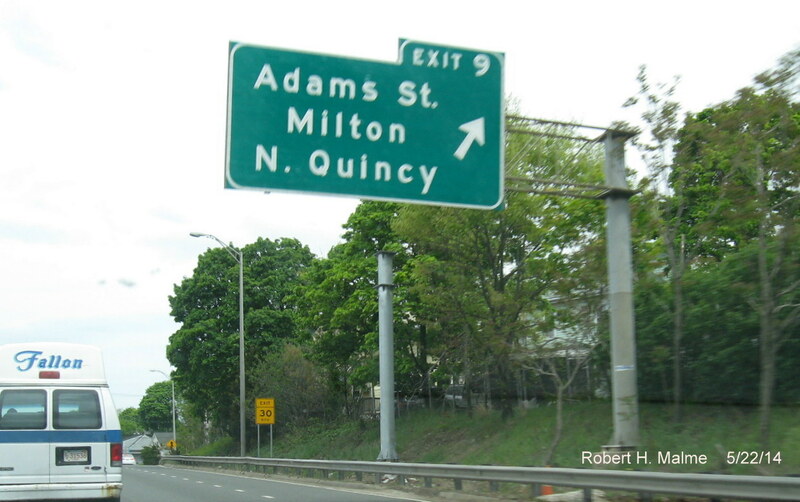 The old sign seen above was installed in the early 1980s when the Quincy Adams T Station has opened. 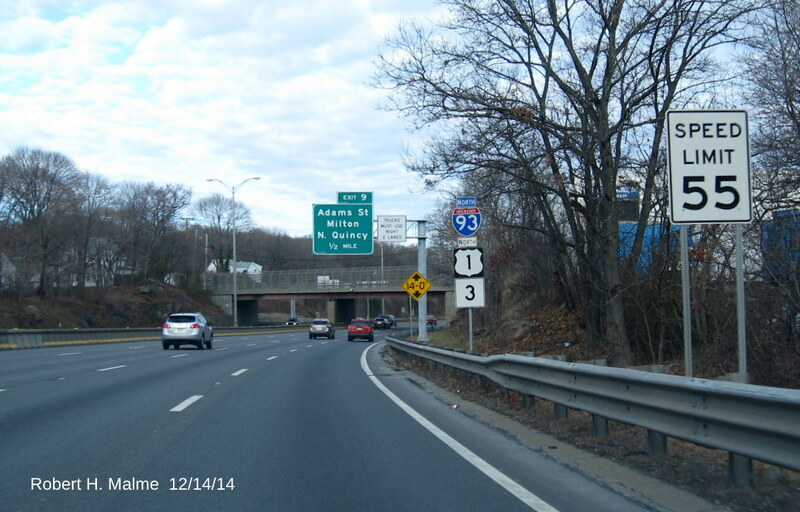 The sign project is now basically complete between Exits 5 and 7 northbound and Exits 6 to 4 southbound. 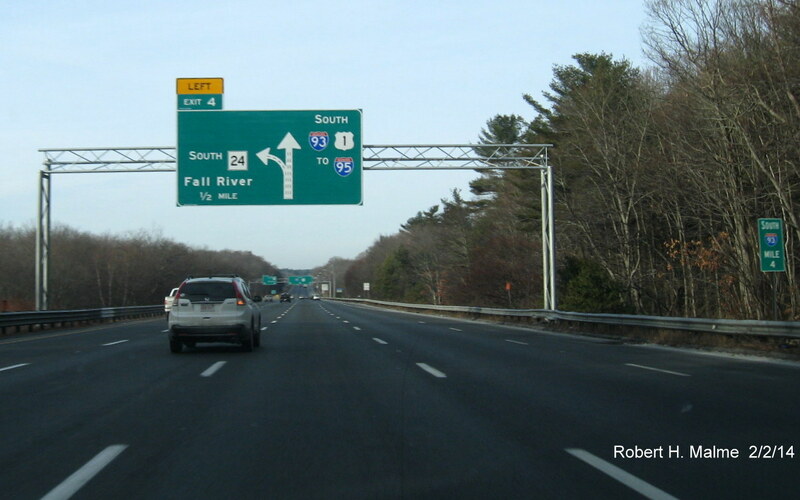 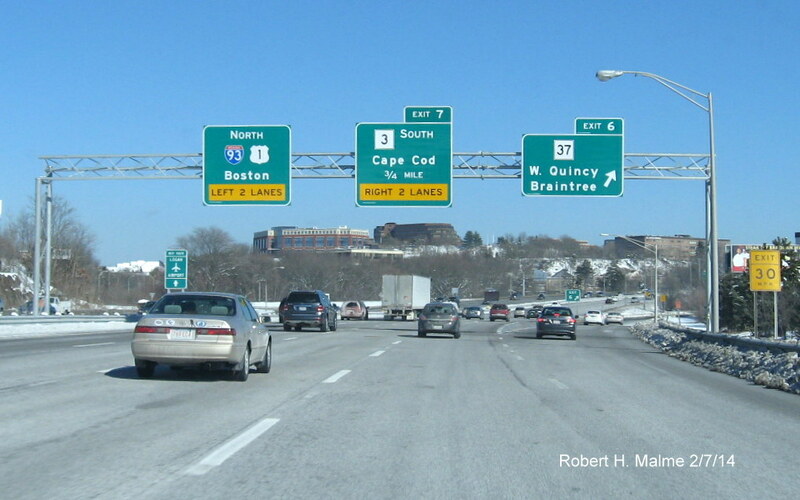 The above signs were placed prior to the routing of US 1 on this part of I-93. 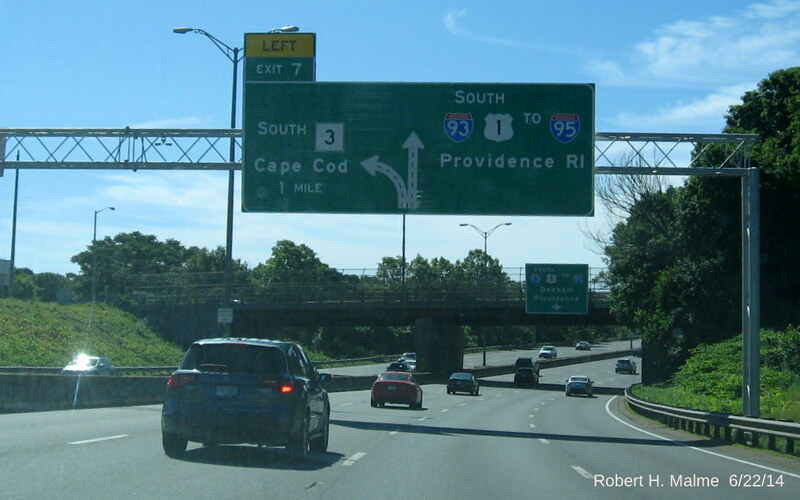 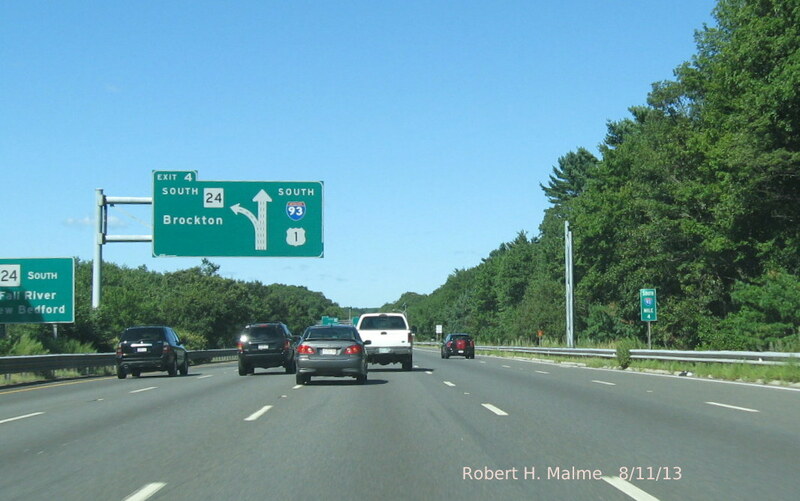 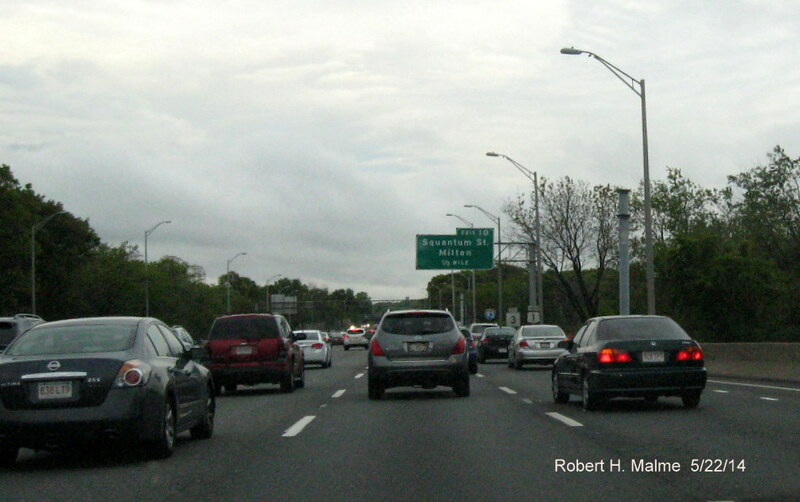 The US 1 sign replaced a MA 128 sign, also it appears the original I-93 and I-95 shields have been replaced in recent years. 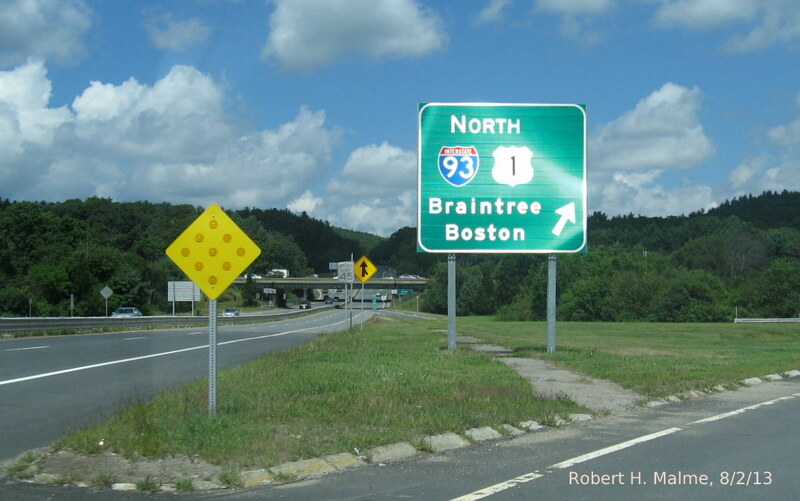 Here there is only one support. 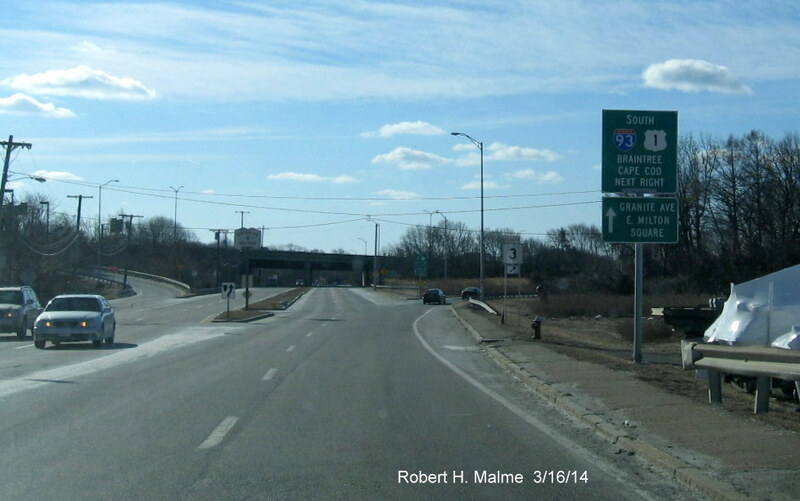 Still needed for all the Neponset Circle overheads are complementary MA 3 trailblazer signs. 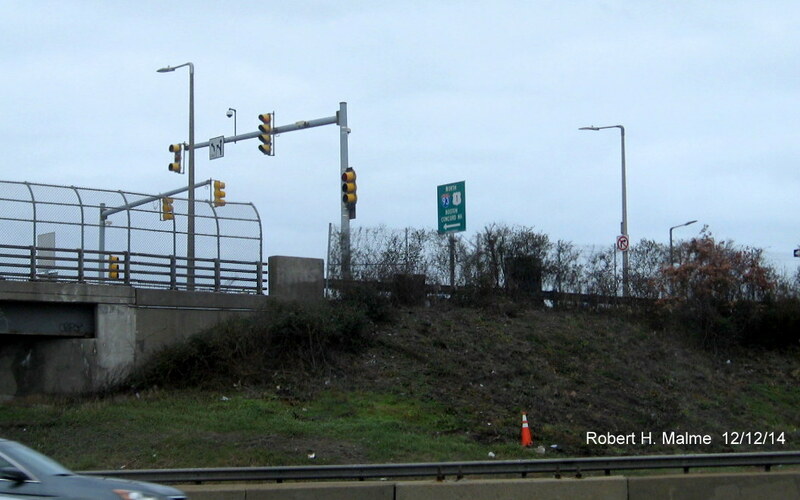 The project is now 71% complete according to MassDOT, and with most of the support posts placed, most of the remaining signage may be put up soon. 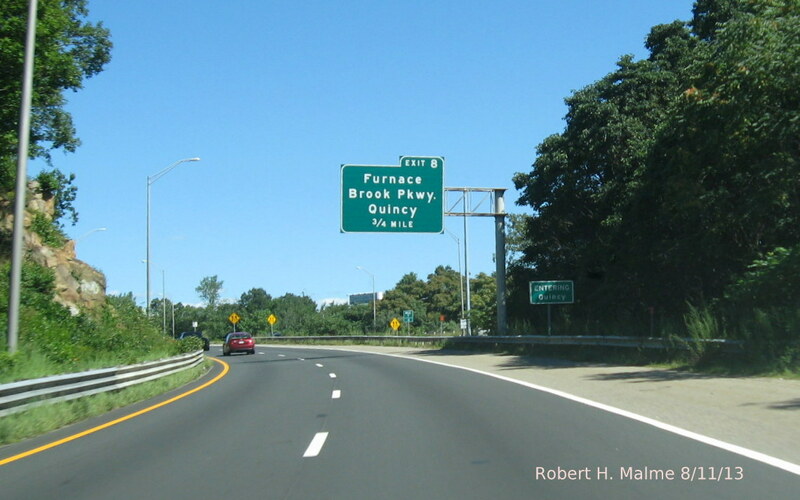 There is at least 1 foundation that has yet to be placed (for the 1/4 advance sign for Exit 8 northbound, Furnace Brook Parkway), however, so it may not be until late fall until the project is completed. 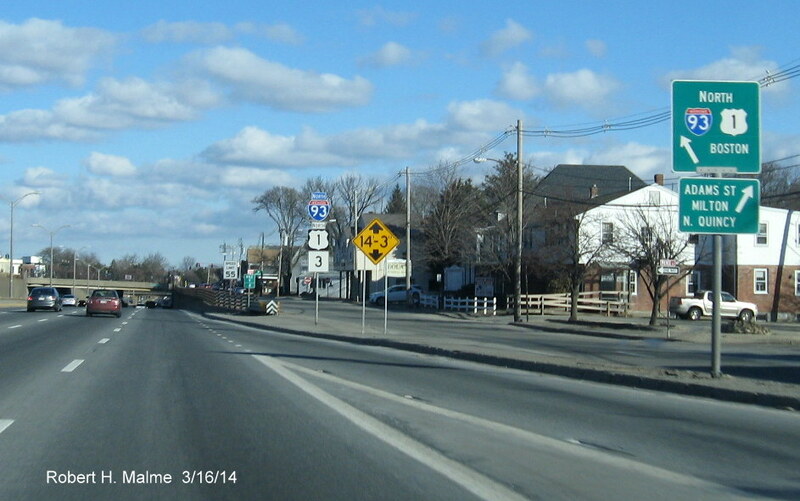 They have recently repaved the road and everything looks new (except for the sidewalks, I guess). 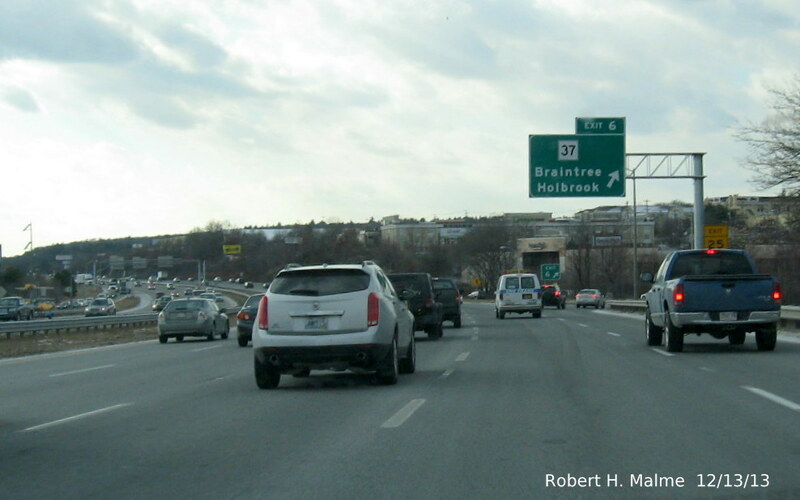 Here's a closeup shot of the South MA 3 trailblazer, perhaps it's a little too big? 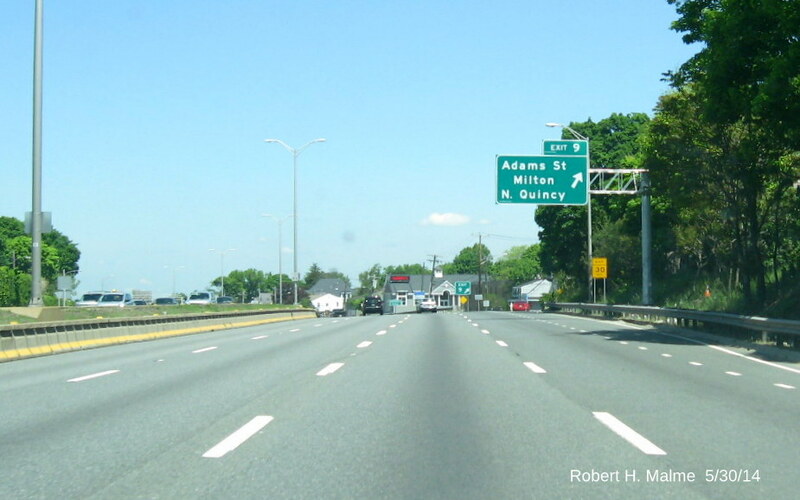 Seems like an odd location, on the extreme right just at the left-lane ramp, but perhaps they figured a left hand sign would decrease visibility. 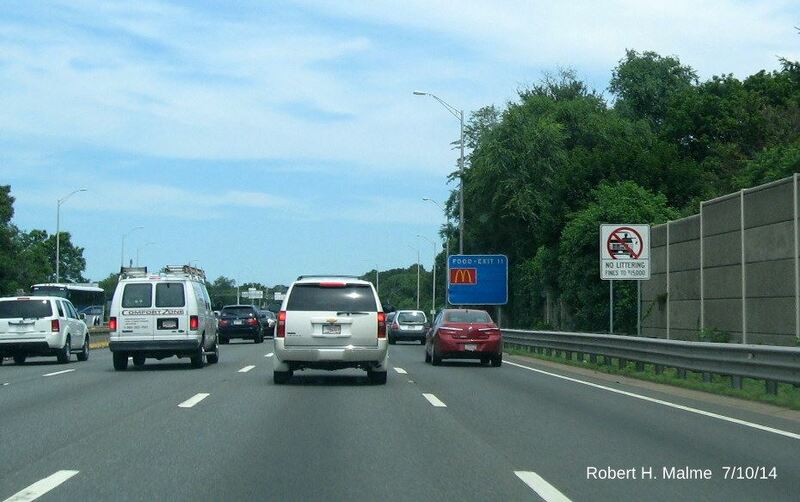 Never heard of anyone getting a $15,000 fine, and observing the litter by the roadside, doesn't seem to indicate too many litterers are worried. 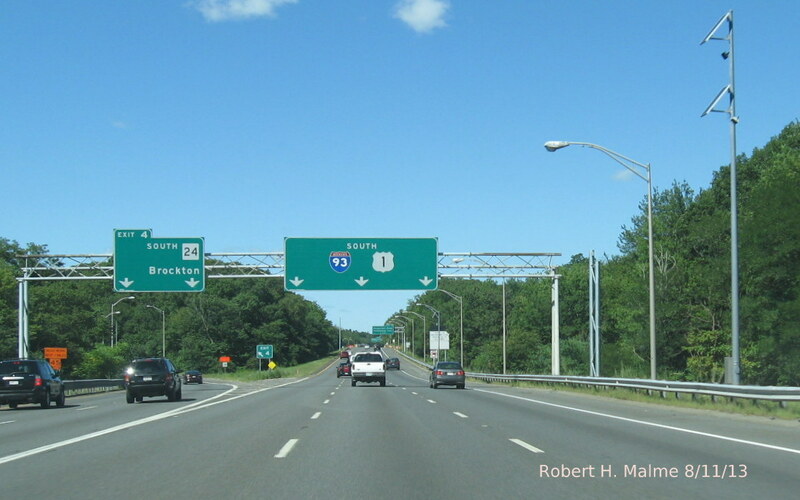 While they took down the older Exit 7 sign, they have left up, for now, the pull-through for South I-93/US 1, allowing one to contrast the new sign with the old. 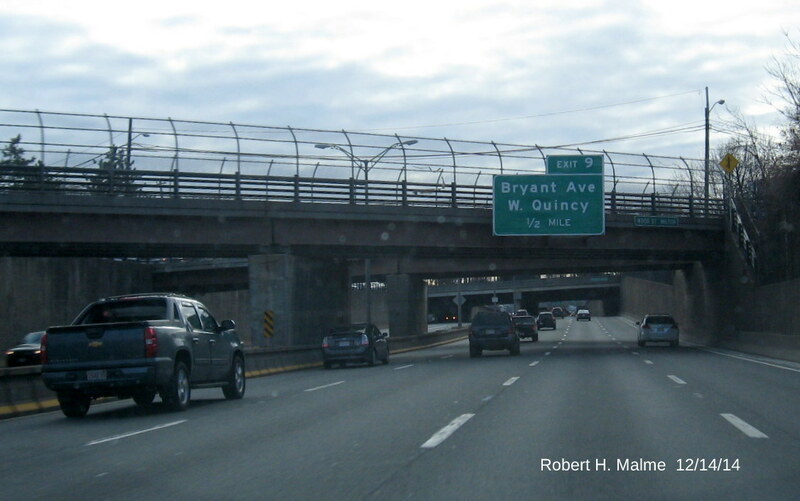 The diagrammatic must have been made, unlike the previously installed sign at the split, after the new ramp configuration near the exit, this shows 2 lanes for each ramp, unlike the later sign which has the old 3-lane configuration for MA 3. 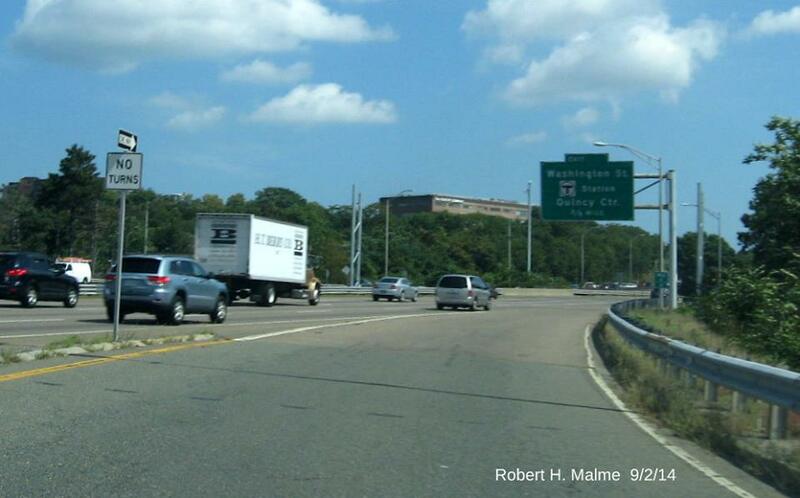 The contractor still is supposed to place additional MA 3 trailblazers at the Exit 9 on-ramp in Milton and the Neponset Circle on-ramp north and southbound in Boston. 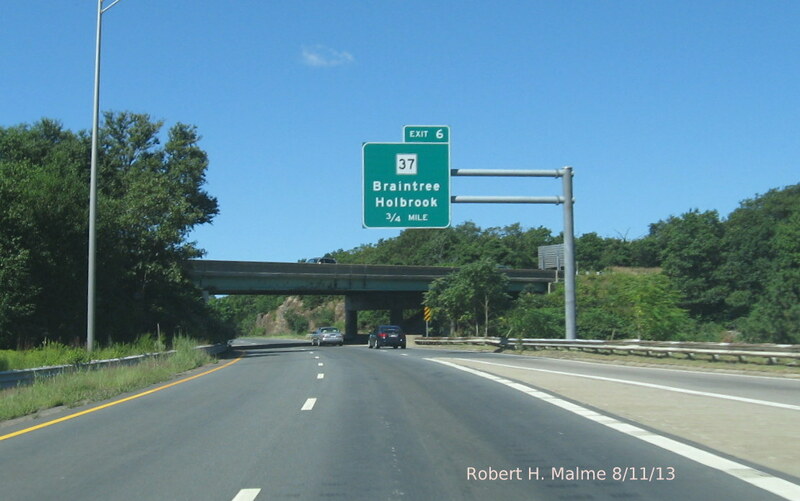 With the exception of the 1-Mile Advance for Exit 11 Northbound and 1/2 Mile for Exit 9 Southbound, which are to be mounted on bridges, the remaining signs to be placed need, in most cases, foundations to be made and then support structures put up. 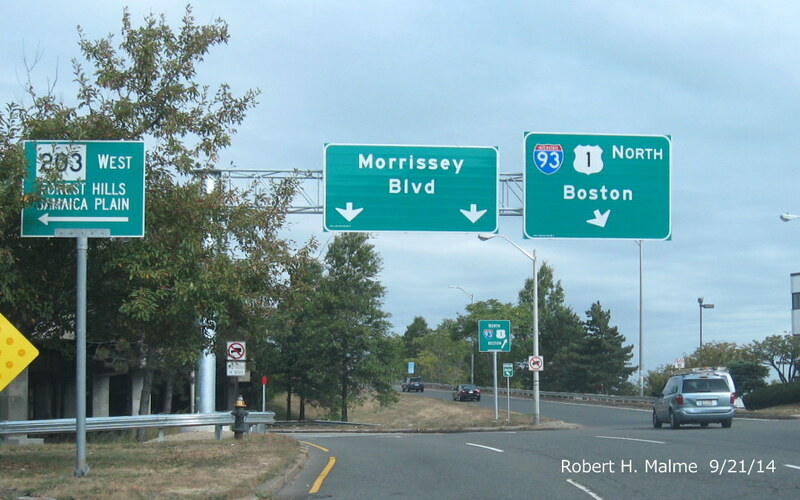 This will probably take at least 2 months. 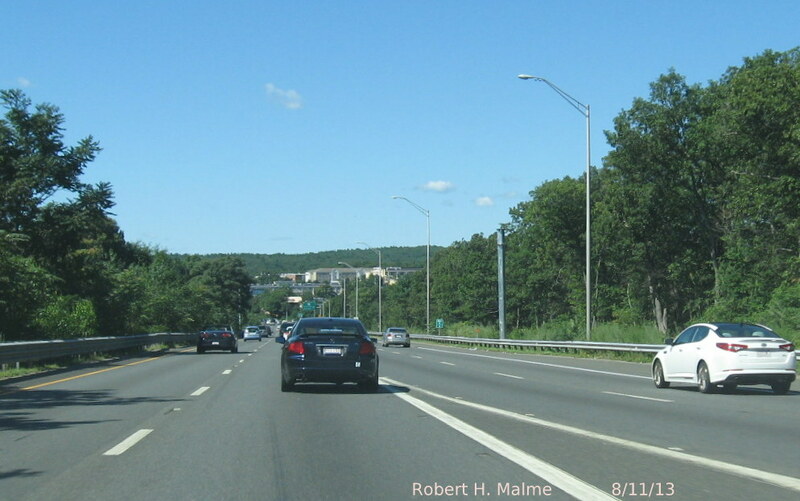 In the meantime, the contractor could place the remaining I-93/US 1/MA 3 re-assurance markers along the Expressway to complement the one put up after Exit 9 Northbound, see below, plus the remaining new exit gore signs not placed so far. 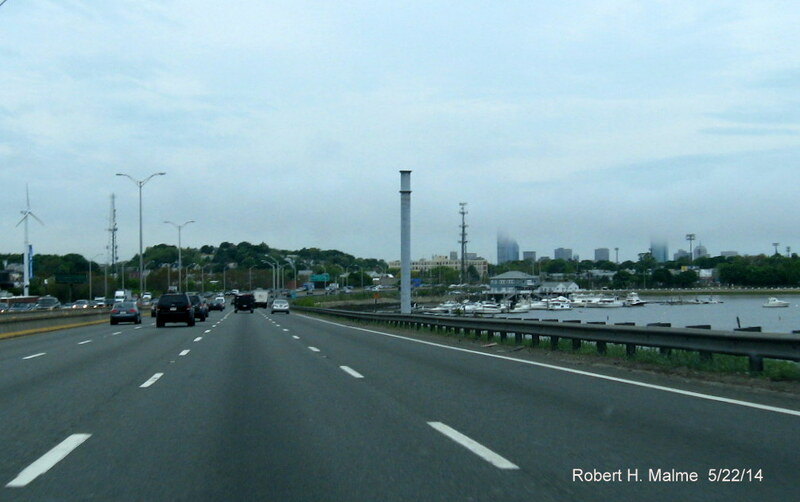 The contractor the past two+ weeks has concentrated on placing signs onto the cantilever support poles placed previously. 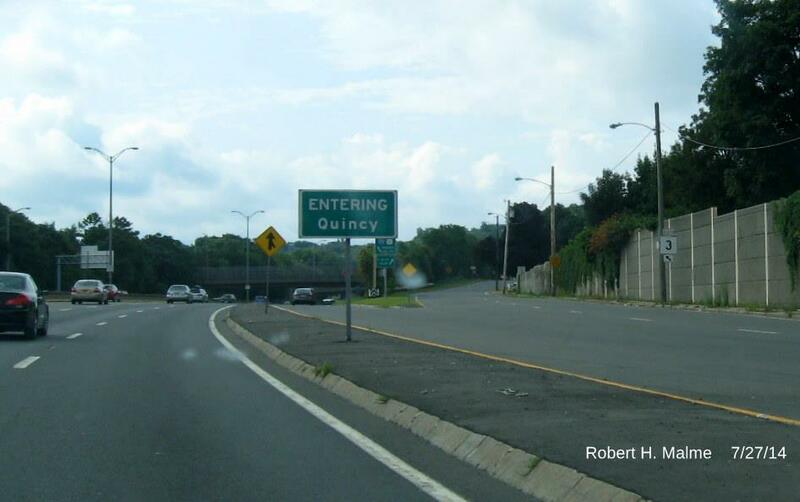 Work started on the southern end of the project area in Quincy and Milton and has moved into the Boston area in the past week. 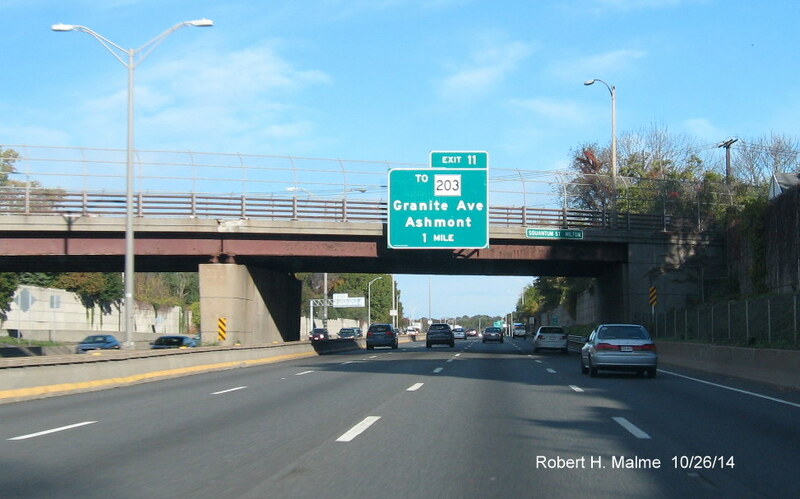 The previous sign was on the overhead support behind the new sign and now has no signage and can be removed. 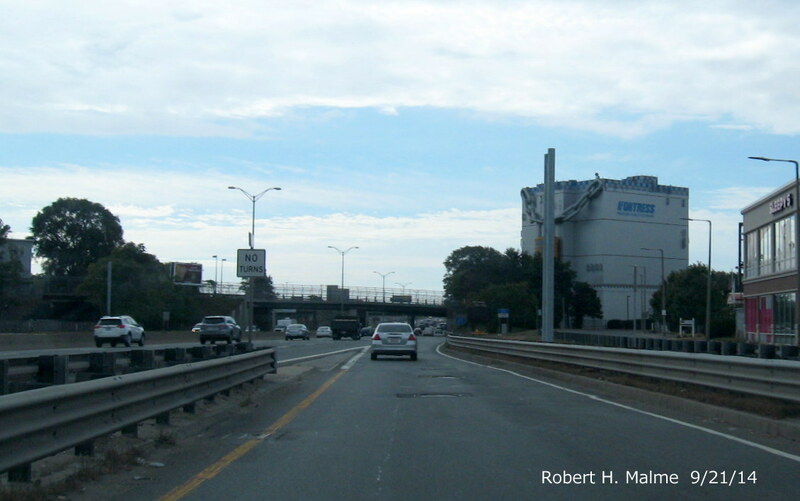 The JFK Library and UMass Boston destinations are now on auxiliary 'Attraction' signs, photo below. 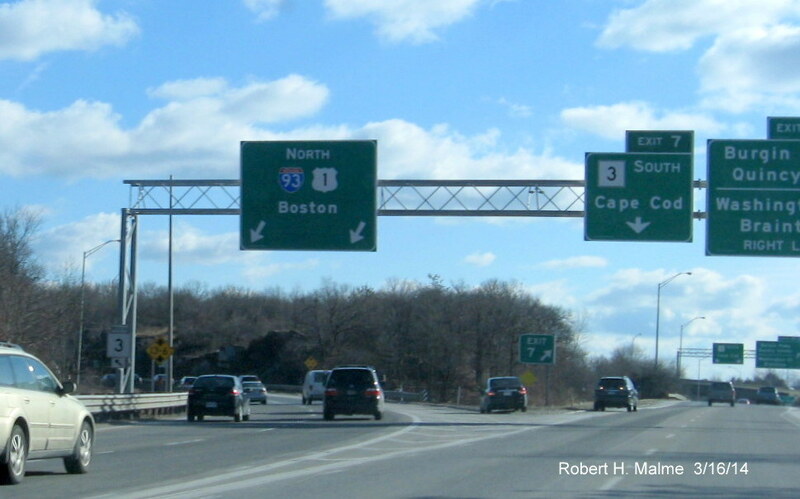 The first two signs for this exit are not being replaced but will have an overlay with the new destinations placed on it, they are not up as of 6/8/14. 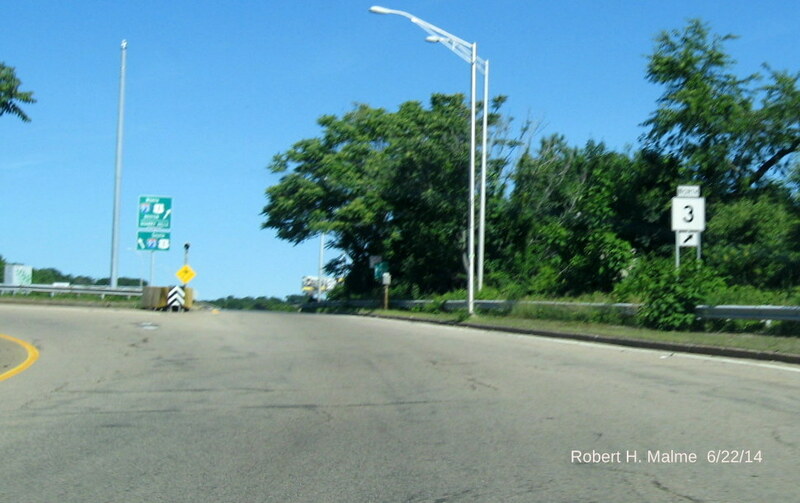 There are several more cantilever support posts without signs north of Neponset Circle, which I assume will get the next batch of new signs. 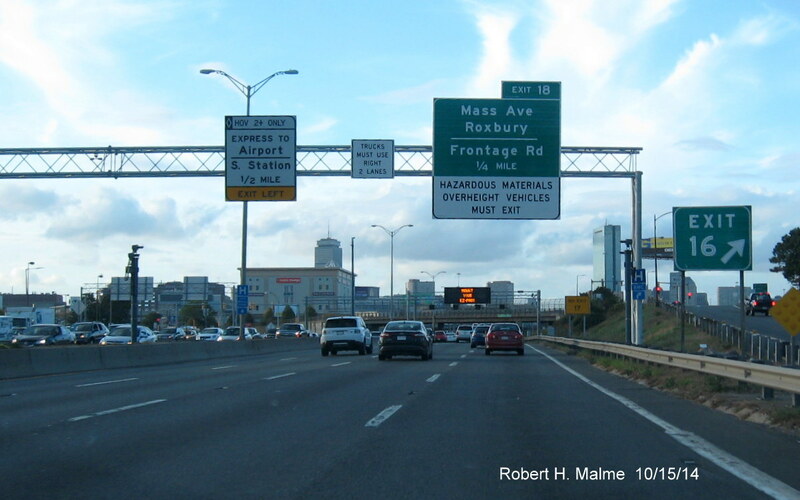 Then the contractor may tackle the overhead signs, or complete the foundations for the remaining needed signs. 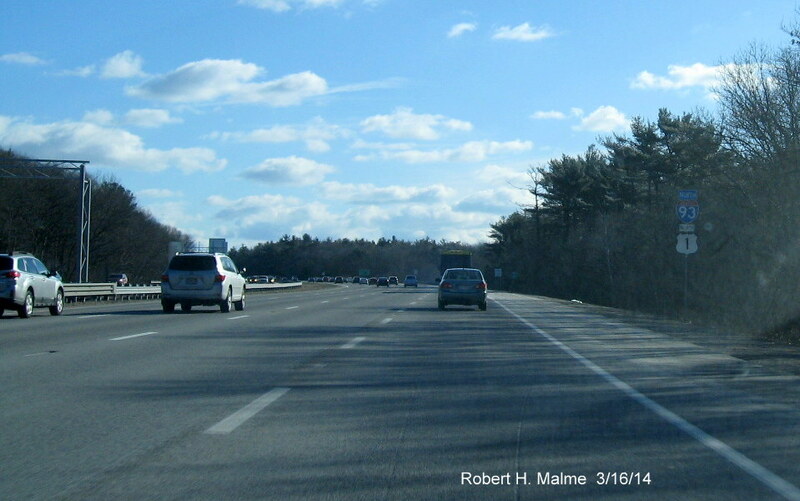 I'll post an update, in either case. 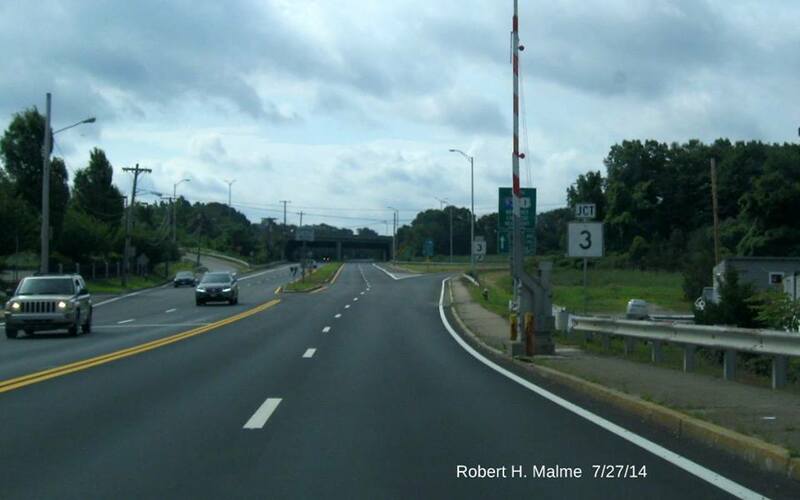 The contractors also placed new I-93/US 1 trailblazers on ramps leading to the off-ramps from Furnace Brook Parkway. 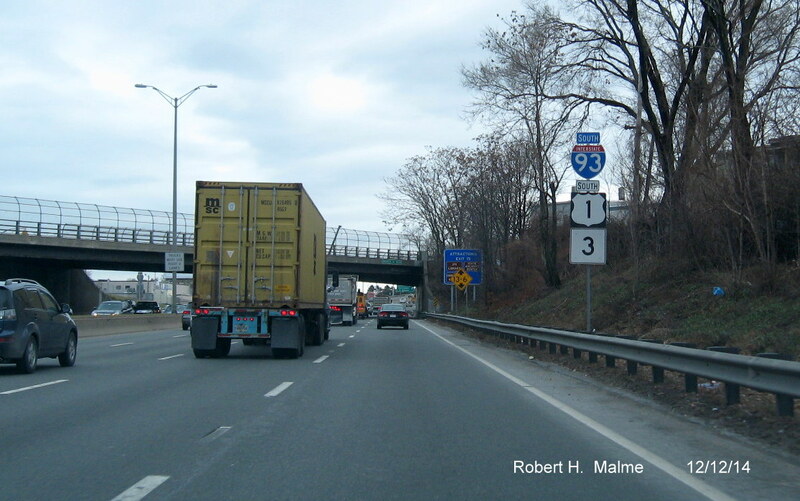 This is not for an exit sign, but for a new advisory sign indicating the I-93 Big Dig Tunnel 3 miles to the north has truck restrictions. 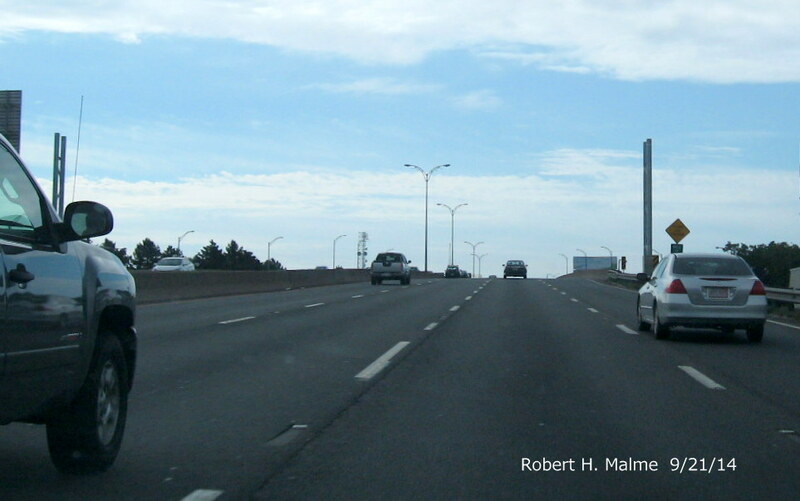 Additional work took place the night of May 22/23. 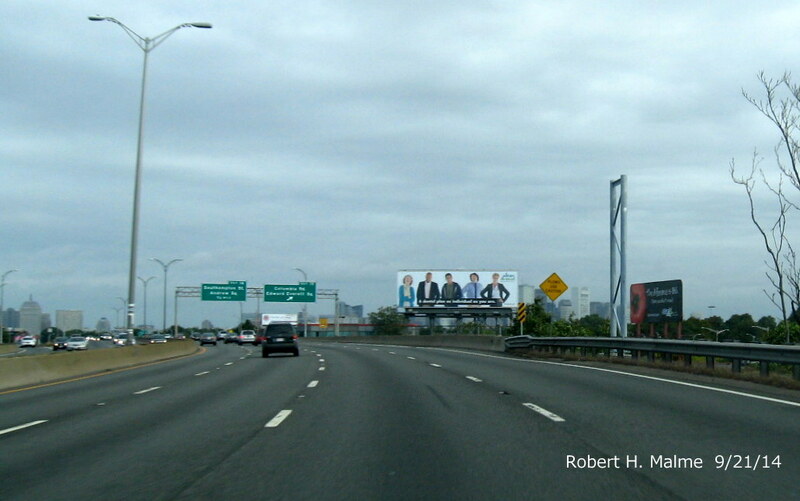 This should be the last posts installed until after the Memorial Day weekend. 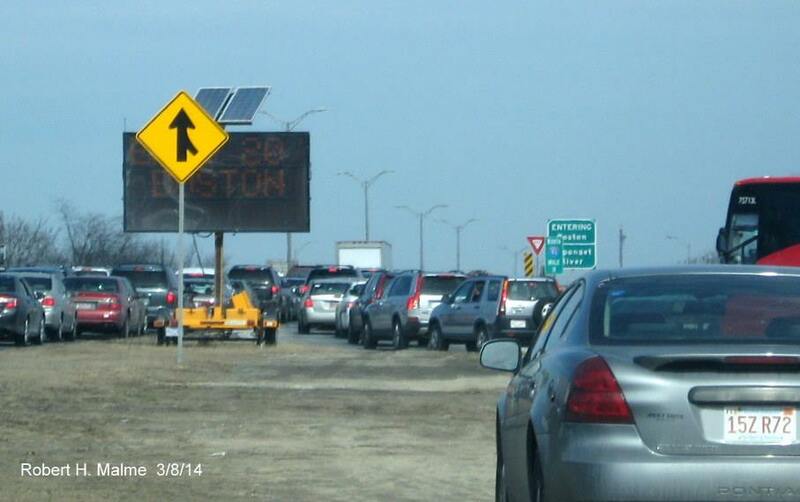 It will be interesting to see how long it takes between post installation and sign installation. 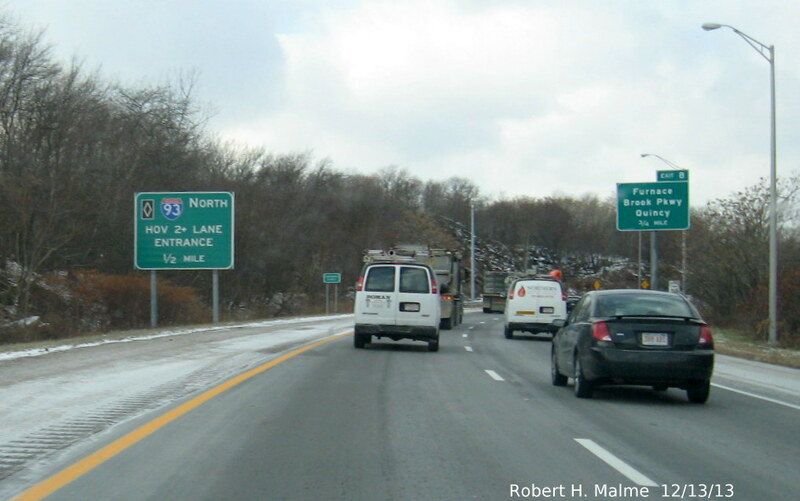 For the '128' portion of I-93 there was almost a 3 month gap. 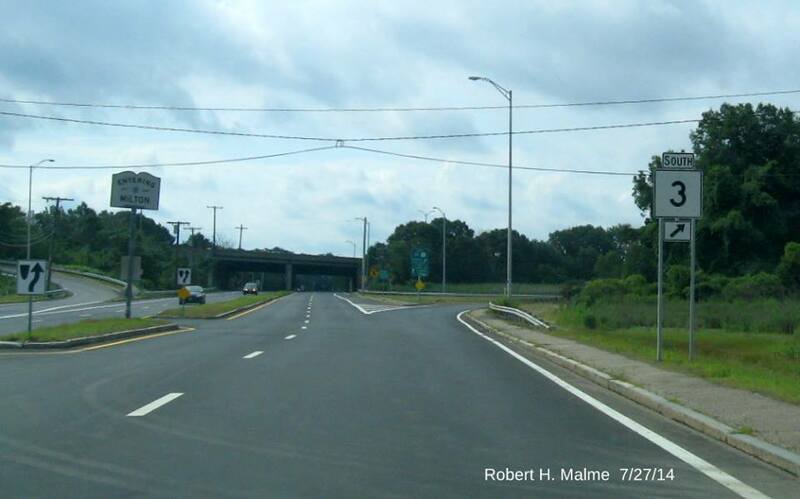 Little progress has been made over the past month or so. 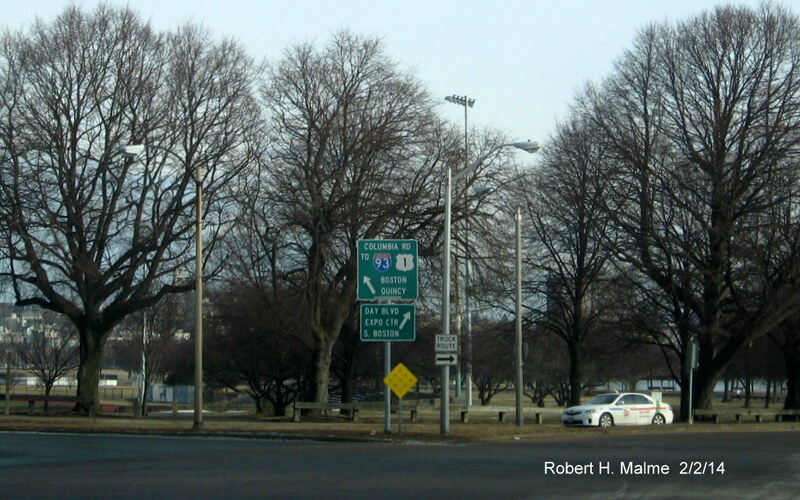 The only new signs are a couple of yellow 'No Exit 17' ground mounted auxiliary signs between the Columbia Rd and Mass Ave exits northbound and a green 'Next Exit 13' sign just across the Neponset River bridge, also northbound. 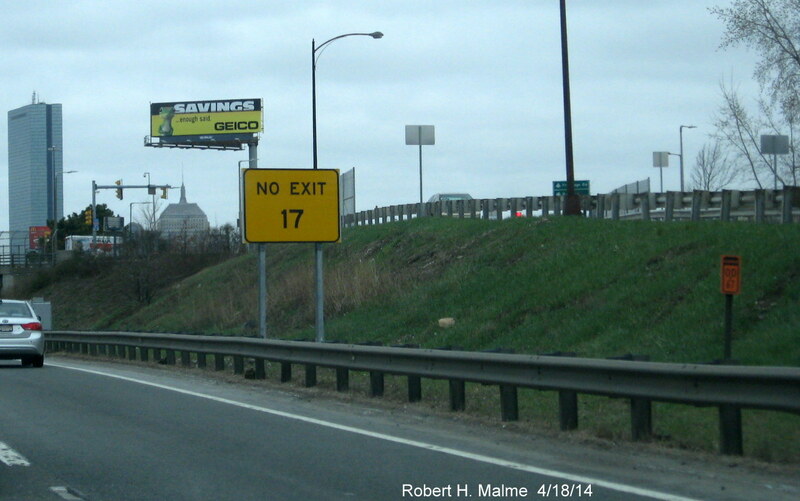 Photos of the No Exit signage are below. 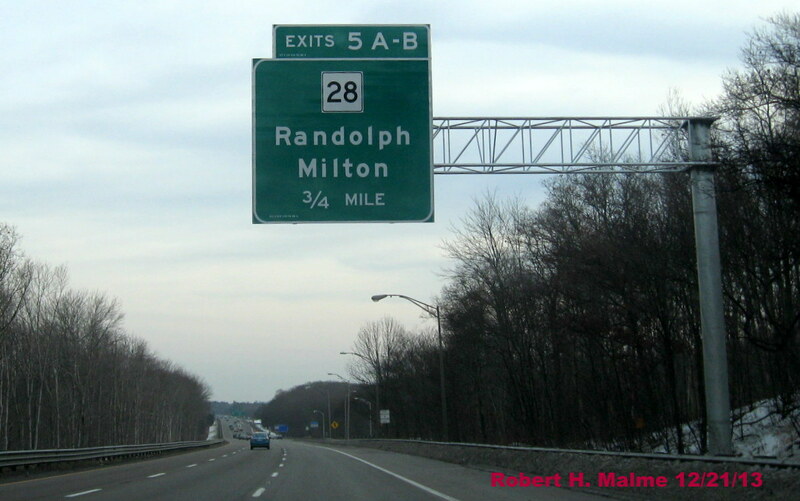 Second sign 1/4 mile away, this after the Exit 16 on-ramp. 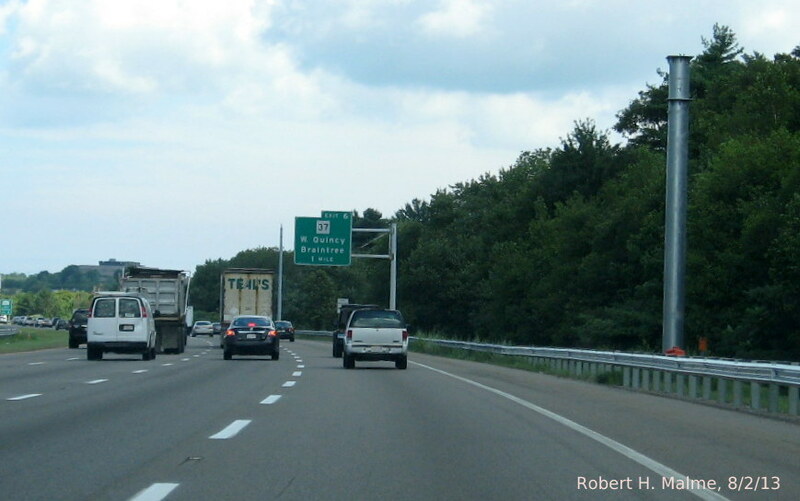 You also can see a contractor overhead sign support site indicator, for whenever they start putting up exit signage in this area. 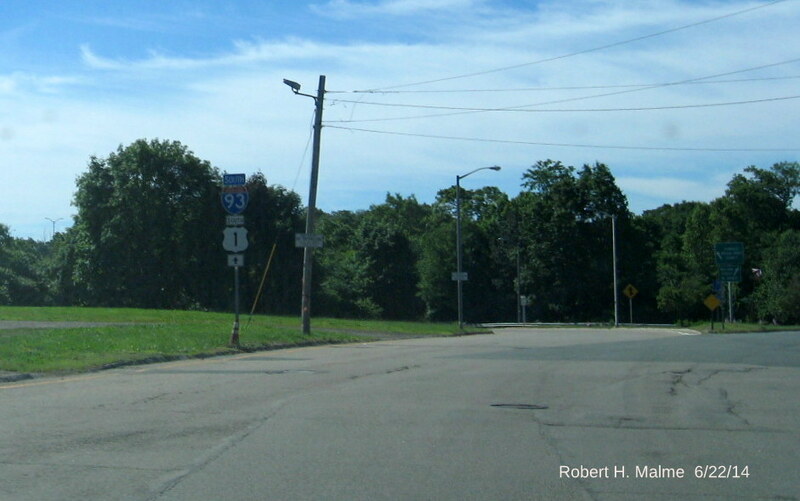 This is the first, and so far only, three shield stack reassurance marker on the SE Expressway, just beyond the on-ramp from Exit 9. 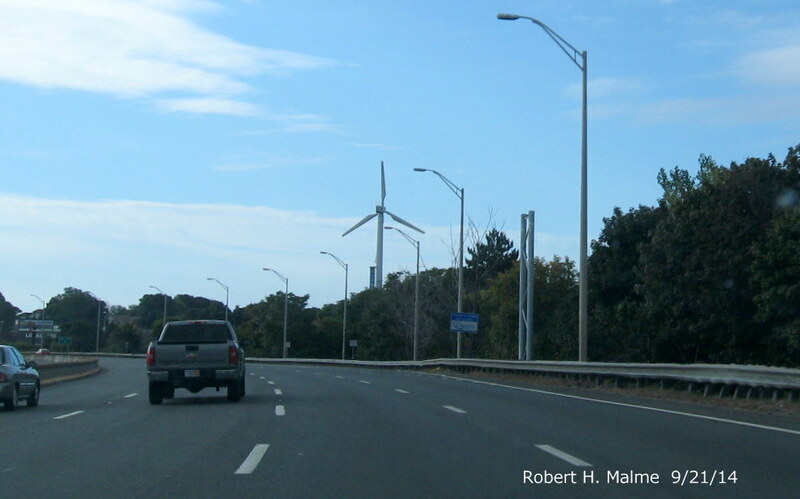 The contractor is supposed to install 4 more of these toward Boston and five southbound. 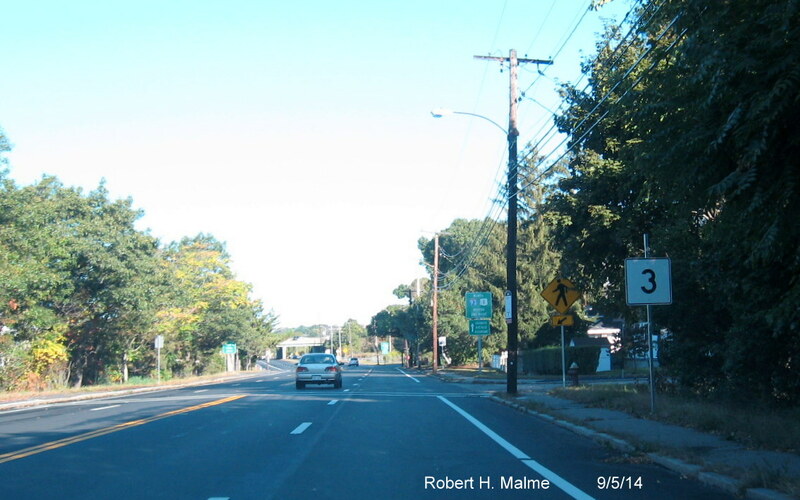 Here's a new South MA 3 trailblazer along Granite Ave in Milton, just over the Neponset River. 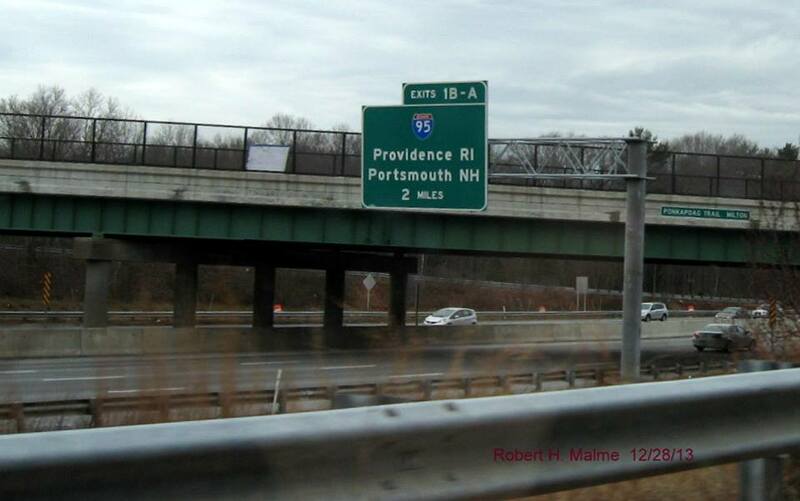 This is the only interchange so far that these MA 3 signs have been added. 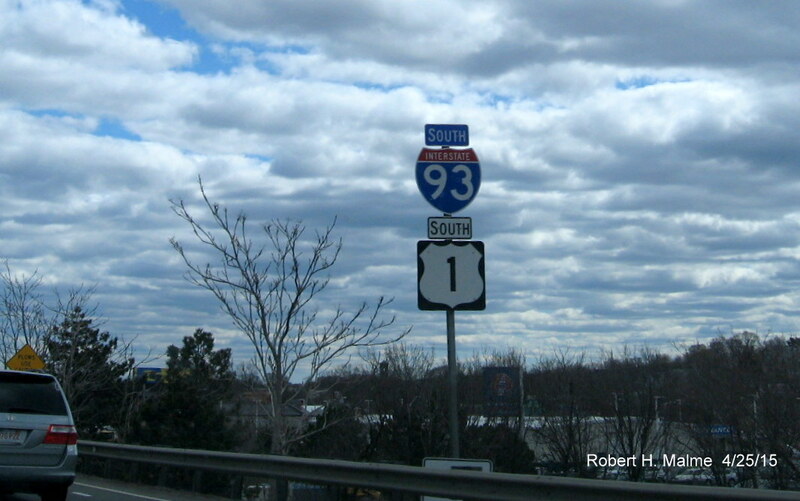 According to the plans, they are also to be used for Exits 8, 12 and 15. 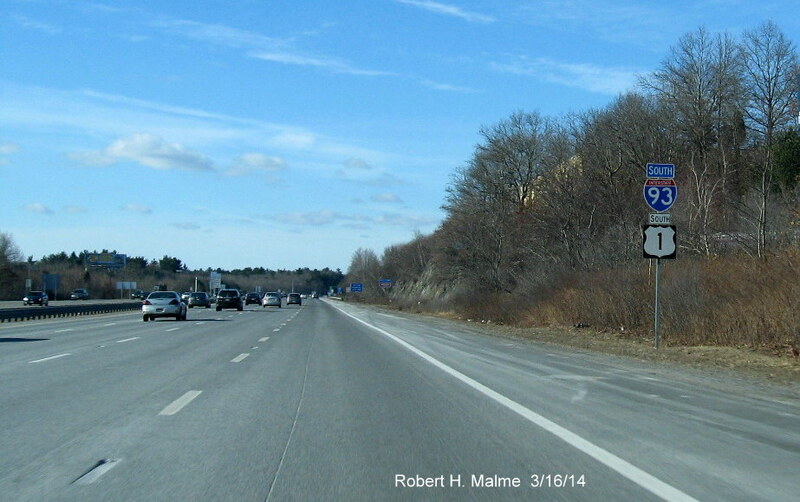 The have finished placing reassurance markers along the '128' stretch from Exits 7 to 4. 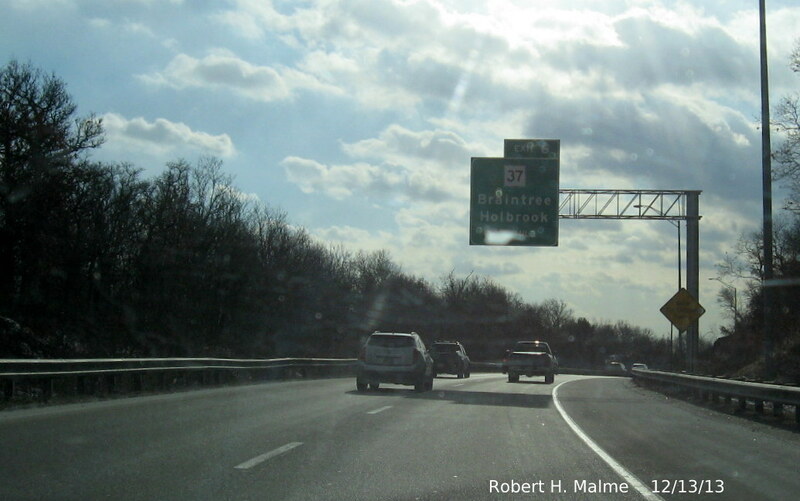 Here is the new South I-93/US 1 sign beyond the Exit 6/MA 37 exit in Braintree. 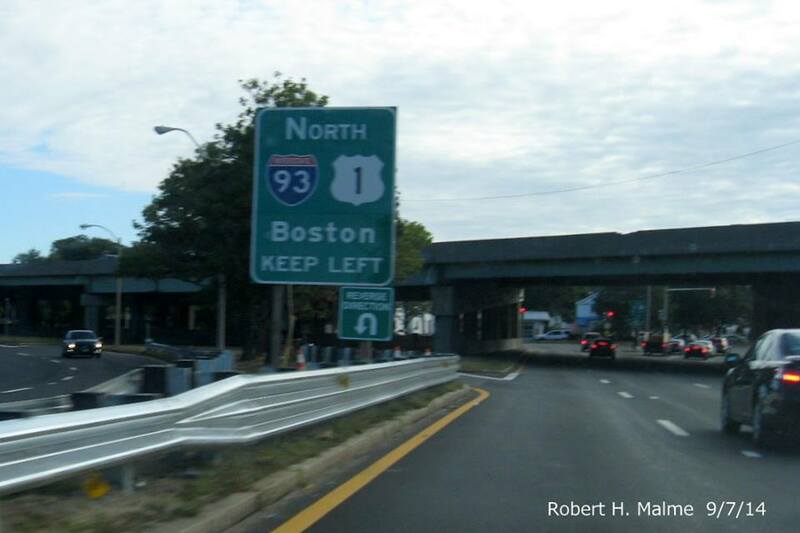 Here, in the early morning sun, is the new North I-93/US 1 signage beyond Exit 5/MA 28. 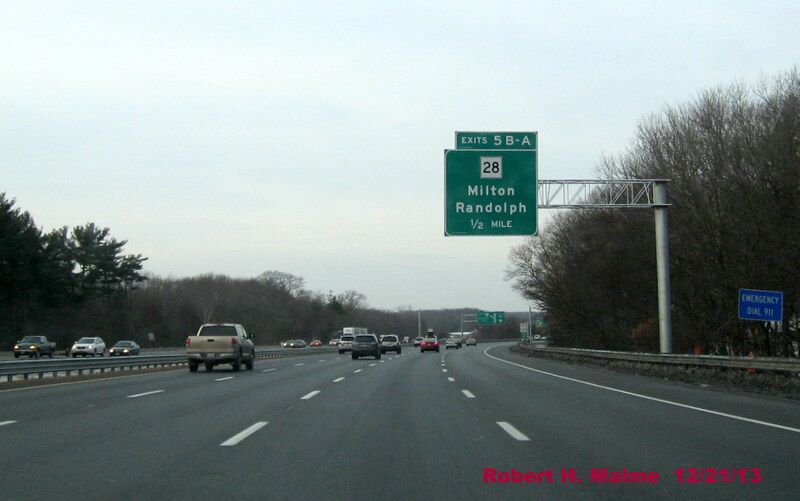 This location has not had a reassurance marker for many years, the former sign was not replaced after having been knocked down. 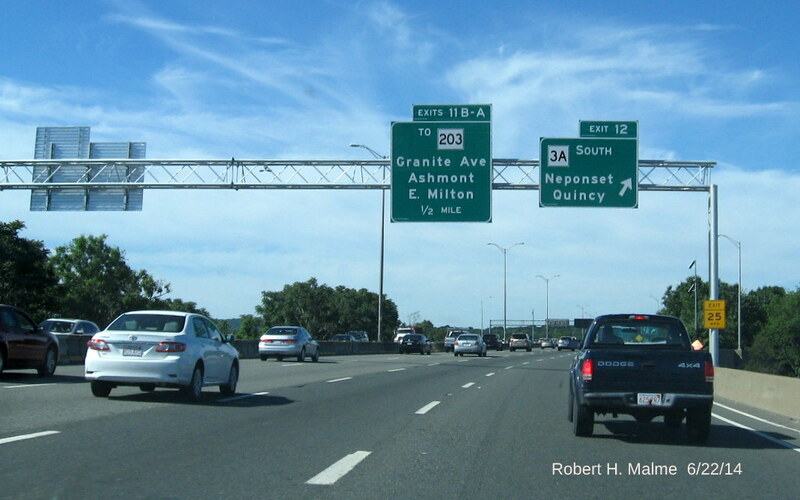 If you look closely at the bottom left, you will see one of the two new North MA 3 trailblazers posted this past week on the overhead sign supports for Exit 7/MA 3 South. 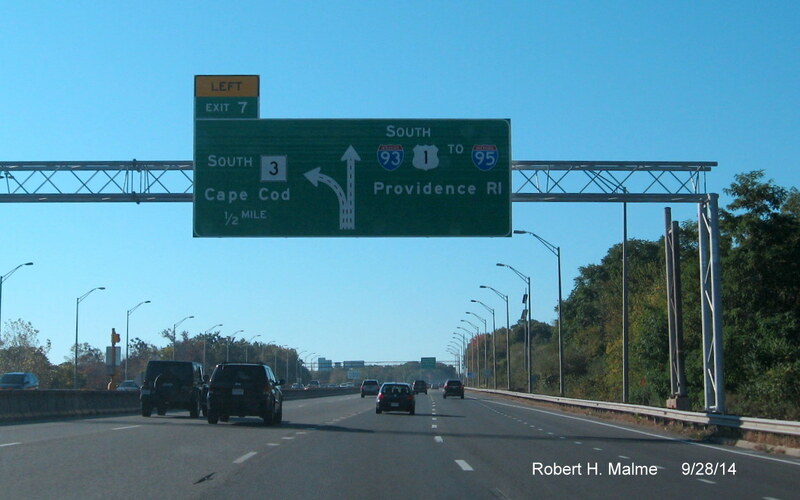 The first advance signs prior to Exit 6 still have to have one attached. 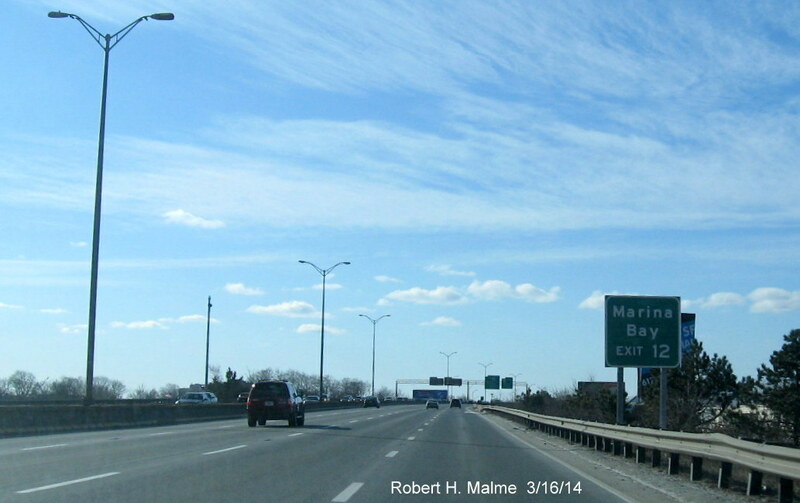 Here is the auxiliary sign for Marina Bay placed a couple weeks ago along I-93/SE Expressway southbound. 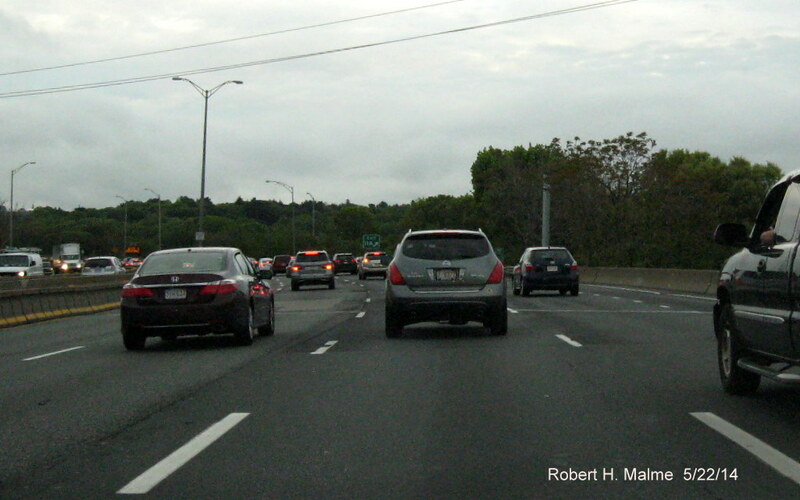 I did not have a chance to take a picture earlier. 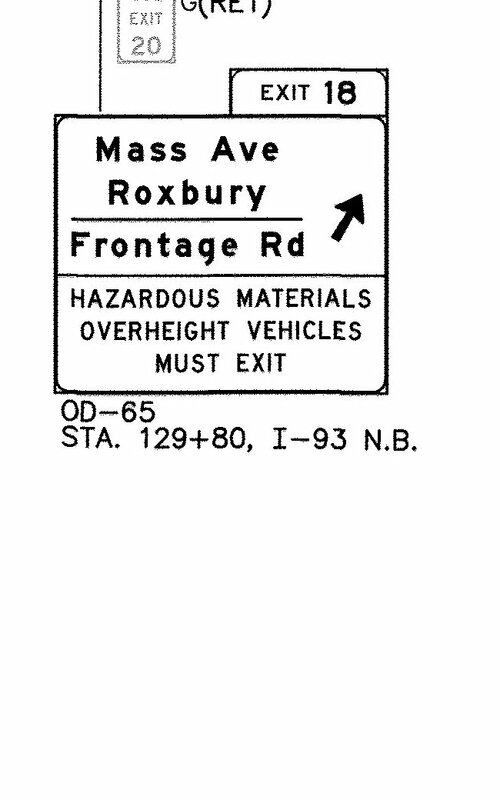 Here's a new auxiliary for Exit 20 (for now), for I-90 Mass Pike and the South Station/Seaport Area. 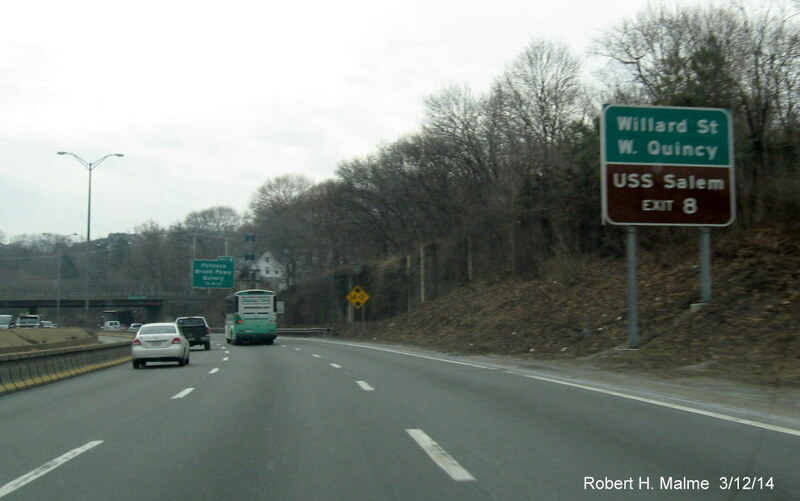 When this sign was initially put up, the older sign was left in place, leaving a cluttered area of expressway for a couple days. 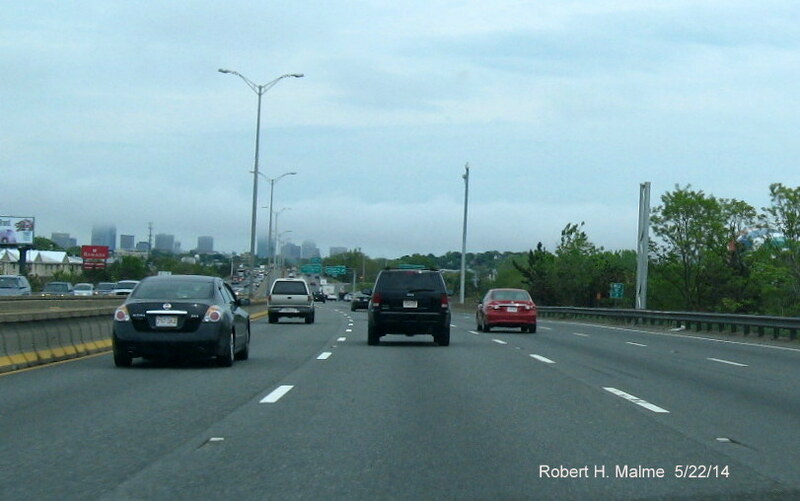 In the distance in this photo. 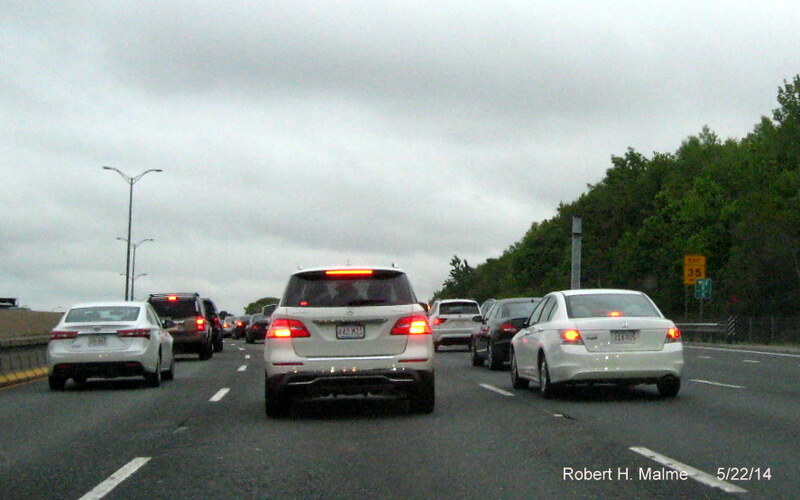 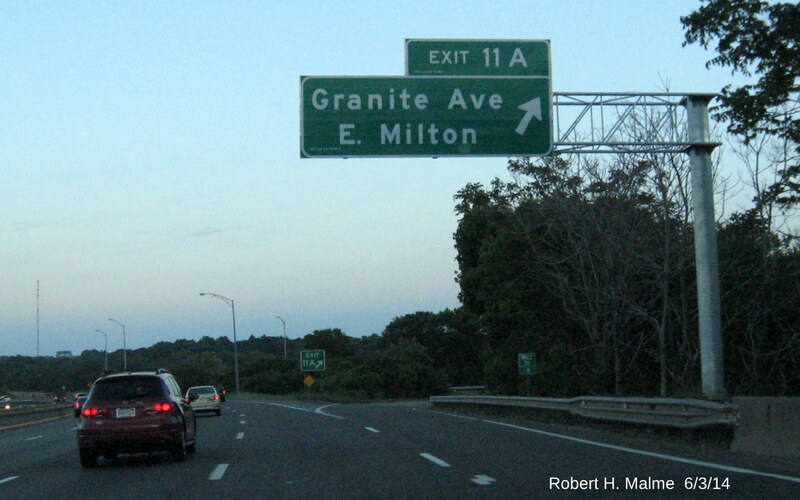 I had to get off at Exit 11 due to an accident further north near Neponset Circle. 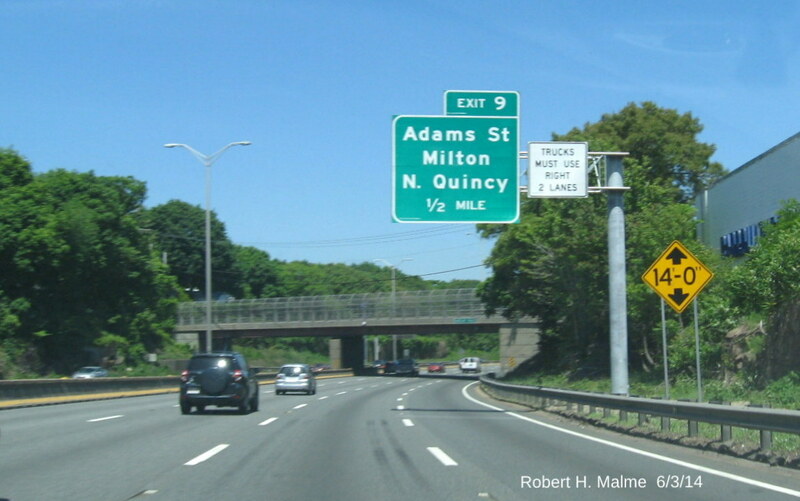 Here's a new brown auxiliary sign for people looking for the Adams historic site in Quincy, I like the addition of the MA 3 shield. 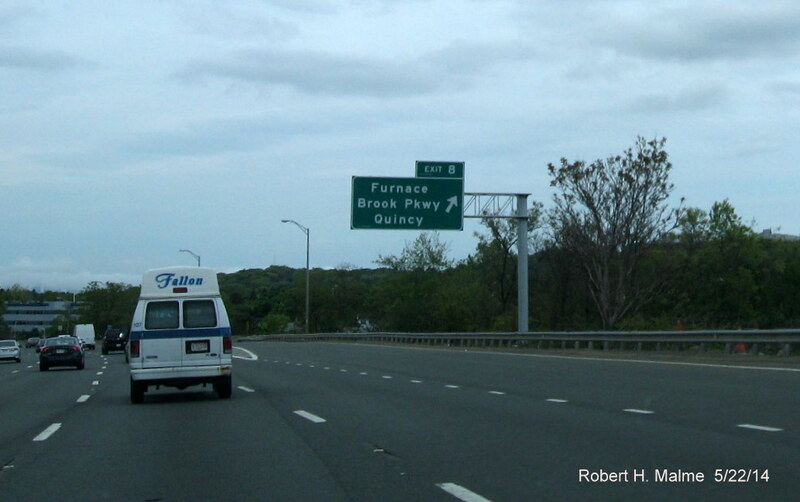 This new auxiliary sign 1/2 mile north of Furnace Brook Parkway is both green and brown. 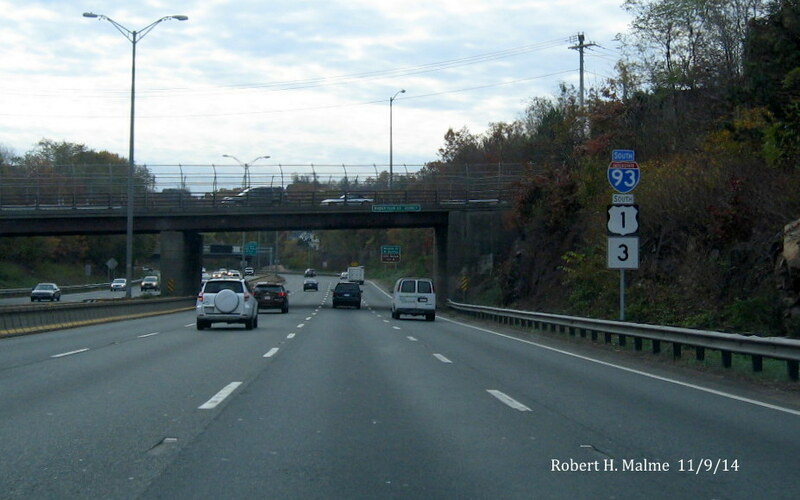 getting a new glare free photo of the overhead at the split of MA 3 and I-93/US 1. 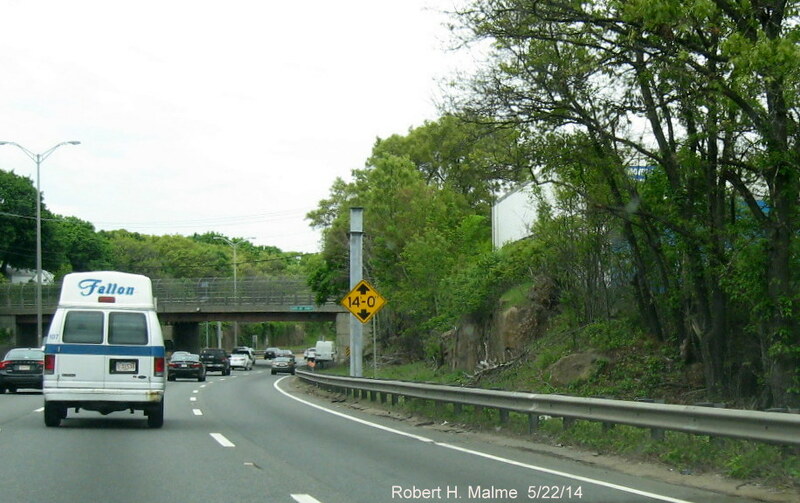 Here is the final overhead for the MA 24 Exit put up a week or so after the previous two. 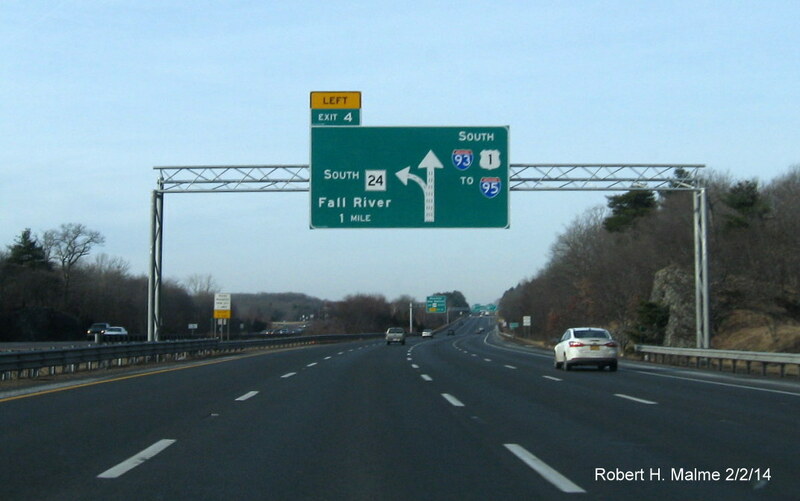 As with the others, MA 24 now has Fall River as a destination and the new I-93/US 1 sign includes a 'To I-95'. 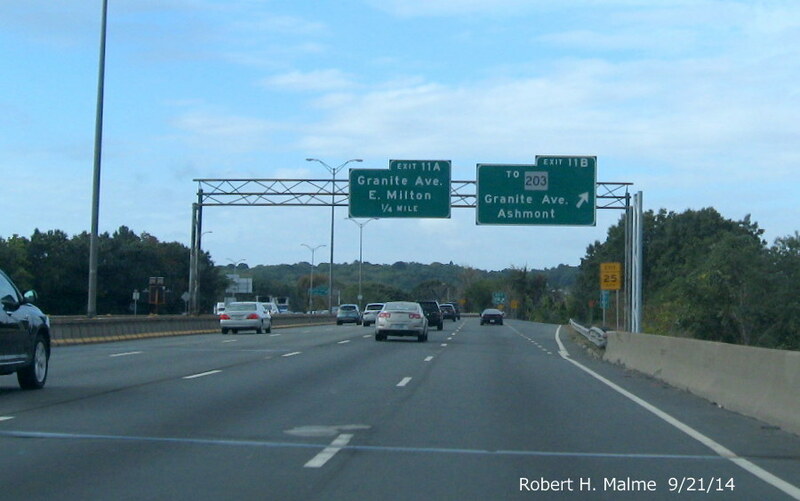 You can also see in the distance the one remaining 1990s overhead southbound between MA 3 and I-95, the 1 mile advance sign for Exit 3-Ponkapaug Trail/Houghton's Pond. 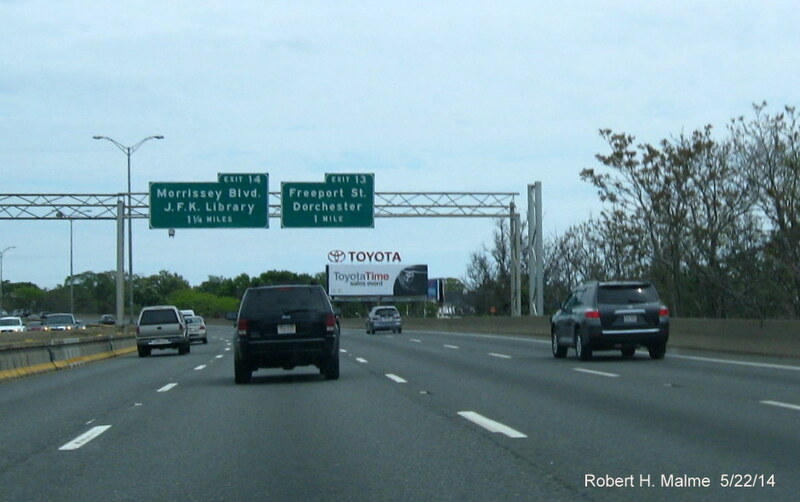 I've dubbed this one of the 'orphan' signs, since it was not replaced during the I-93 add-a-lane project which put up new signs between Exits 4 and 1, and it is not on the list of signs to be replaced under the contract upgrading signage from MA 24 northward. 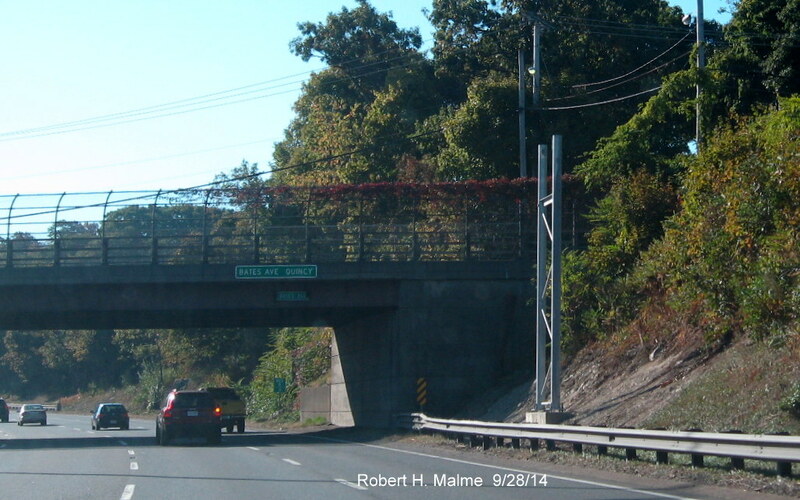 This is one of the two remaining overhead assemblies for the MA 3 exit that was replaced over the past 2 weeks. 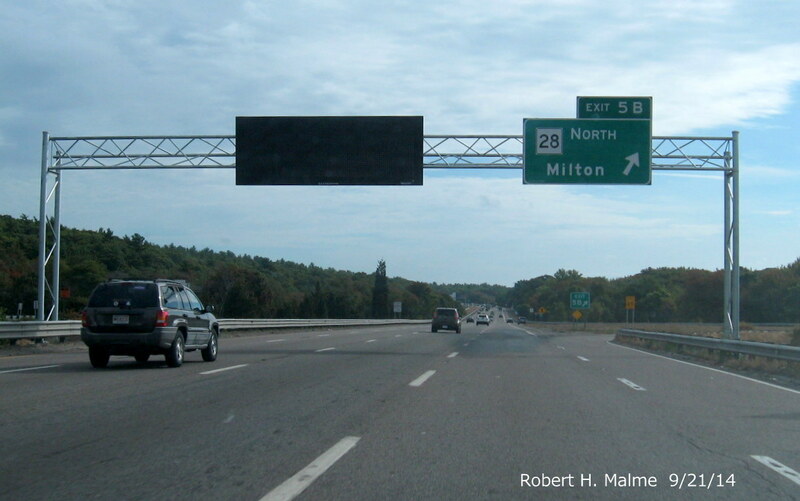 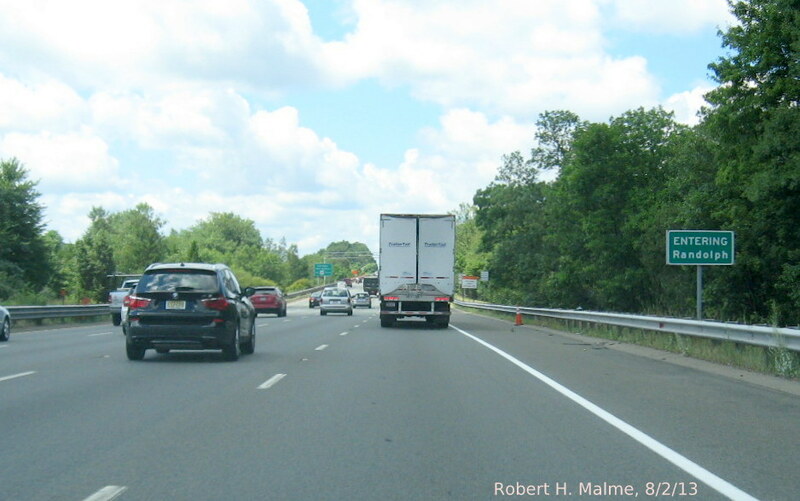 Again, the new I-93/US 1 overhead is not accompanied by a North MA 3 trailblazer as indicated in the plans. 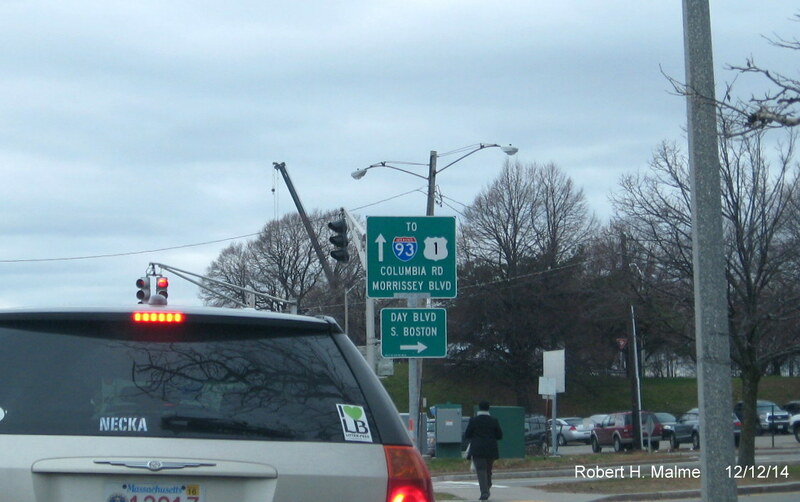 You can also see one of the new 'Best Route to Logan Airport' signs that have also gone up in this area over the past month. 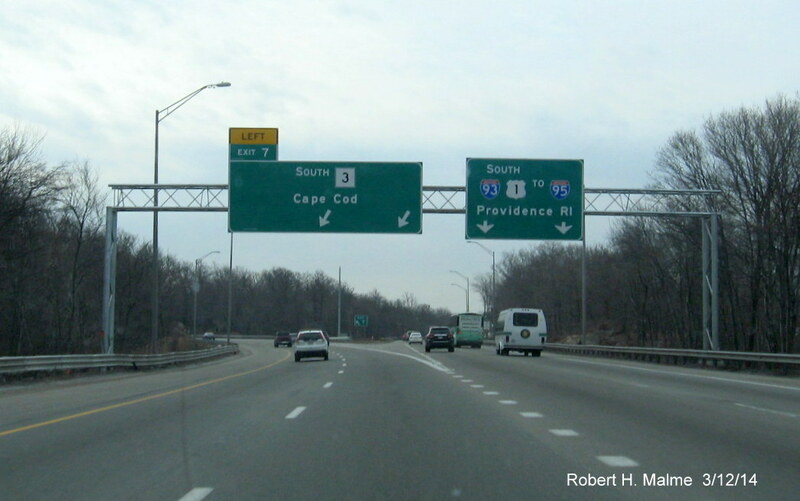 The signs both have an airplane logo and arrow that indicate either going straight, or in this case, going to the left. 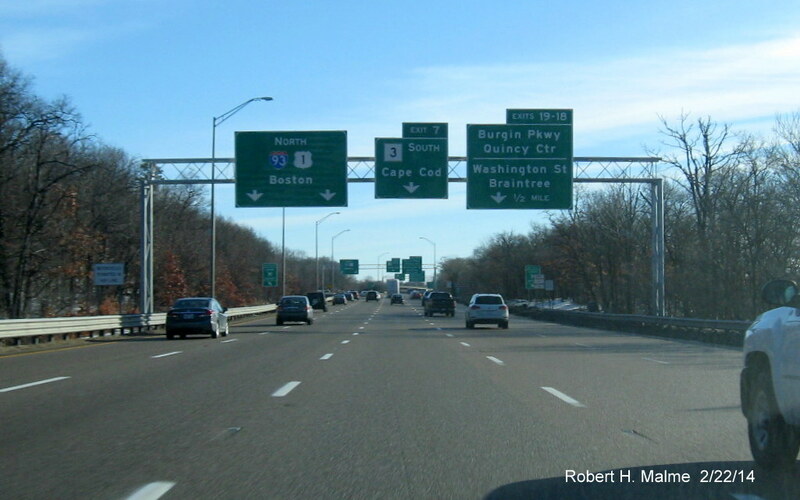 The final set of signs at the MA 3 exit heading north, the signs for Exit 19-18 on MA 3 were also replaced as well, completing the update of MA 3 signs that began in 2008. 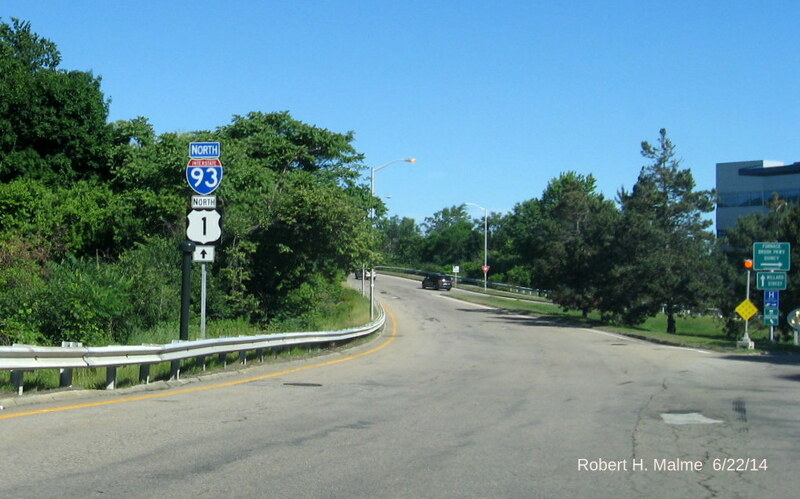 Only one sign remains to be replaced along this section of I-93/US 1 North, the ramp sign for MA 28 North in Randolph. 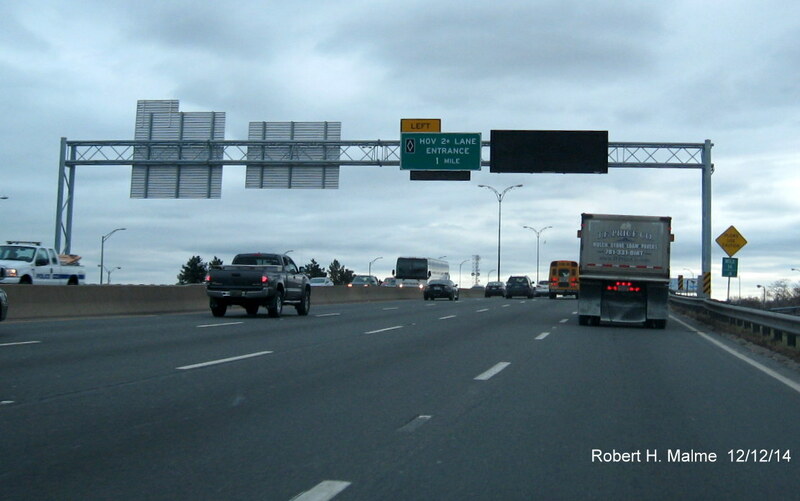 Currently a right-side cantilever, its due to be replaced by an overhead assembly that will also have a VMS display over the left lanes. 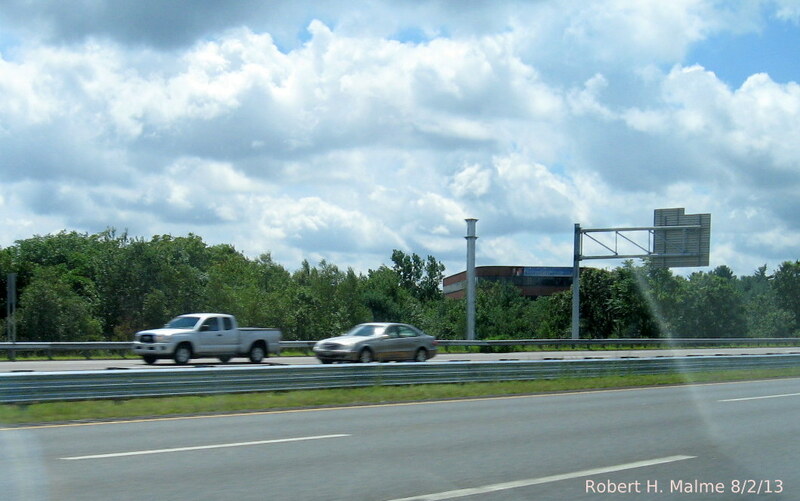 The contractor still has not put up the support poles for this structure. 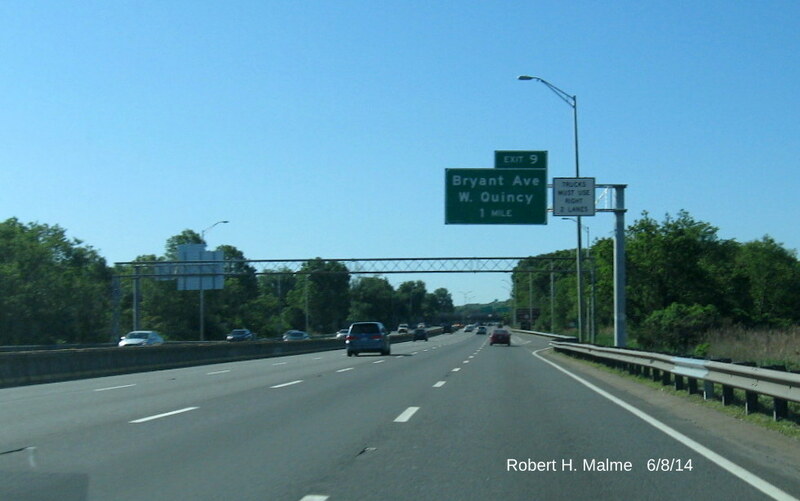 There is also an 'orphan' sign northbound, the 1 Mile advance for the MA 28 exit just beyond the ramp to MA 24. 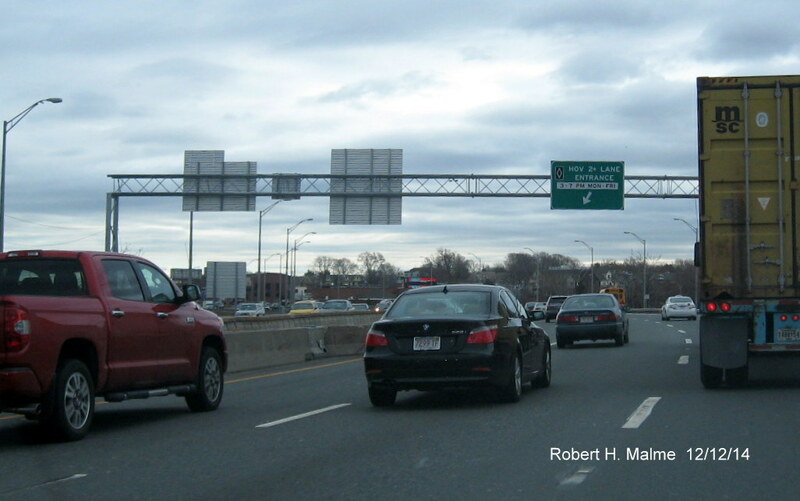 New overhead sign at split of MA 3 and I-93/US 1 Southbound. 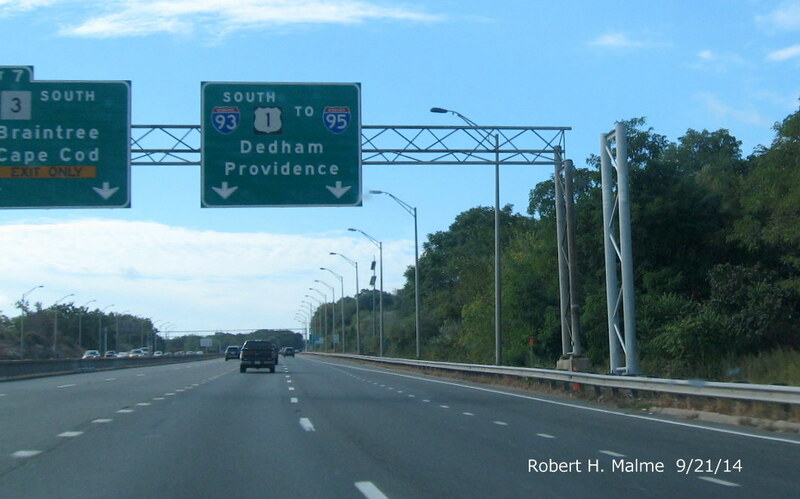 This new sign was a surprise, since there were no new posts installed ahead of time, apparently the existing support structure was in good enough shape to be re-used. 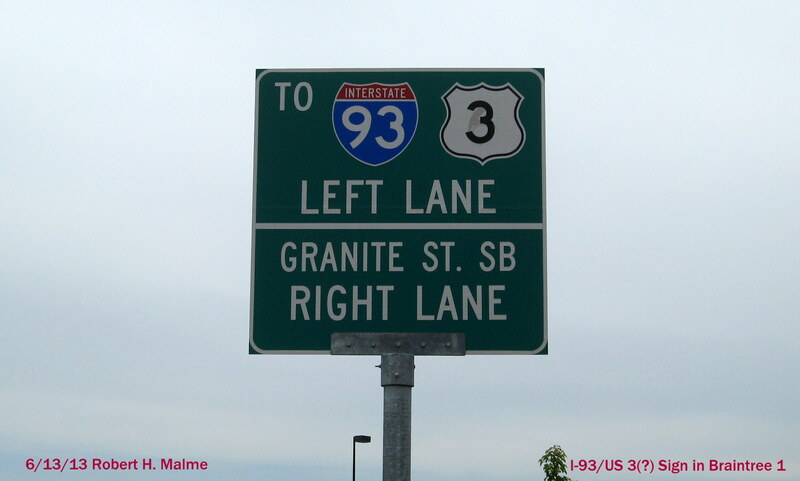 Notice the missing 3rd arrow for MA 3. 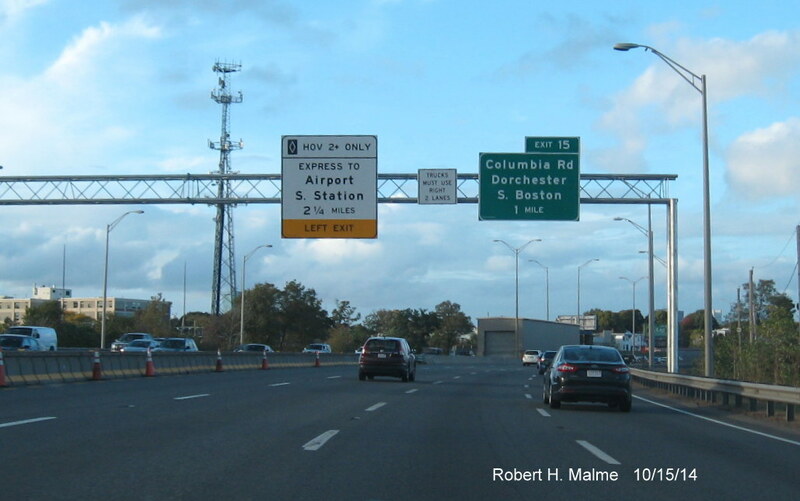 The sign was designed prior to MassDOT's reconfiguring of the interchange. 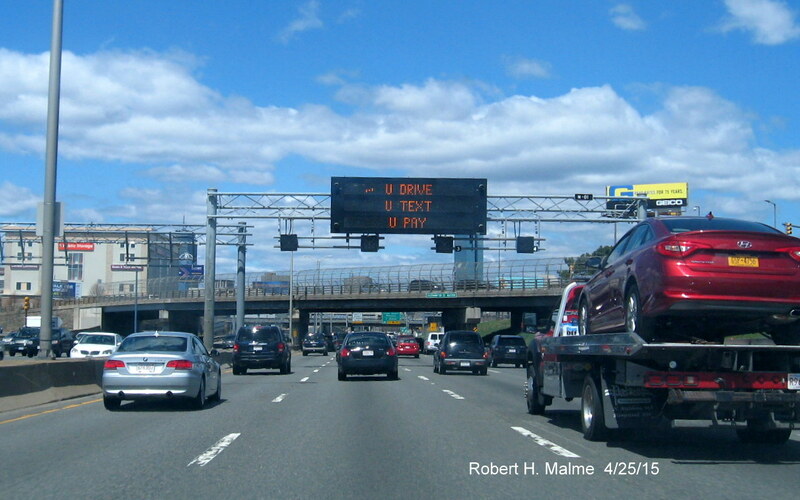 Apology for the afternoon sun and snow-related glare. 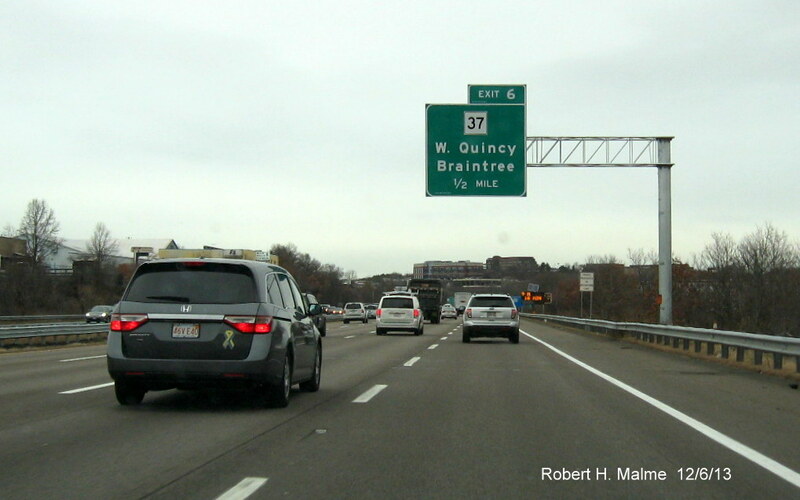 The other new overhead signs installed this week were the first advance signage for Exit 7 MA 3 at the ramp for Exit 6. 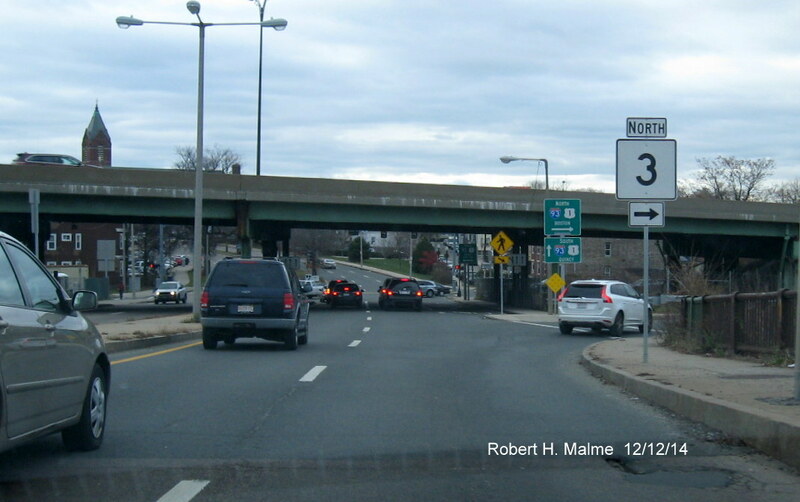 Plans indicate there should be an additional MA 3 trailblazer on the left sign support since that route was removed from the overhead sign. 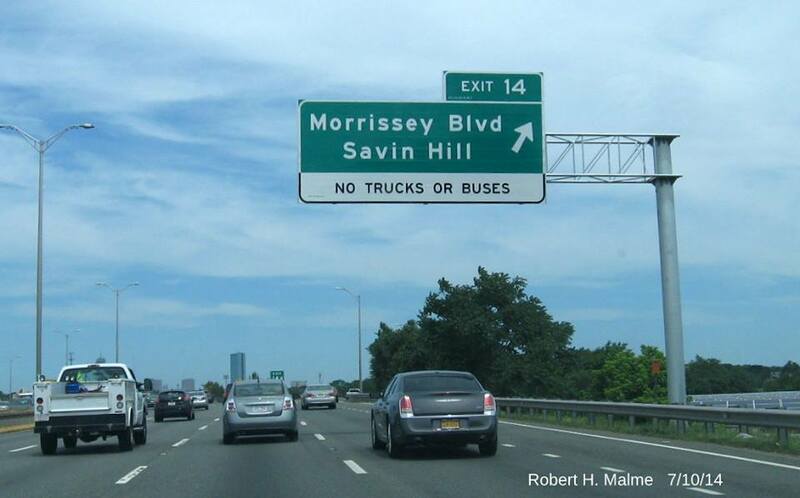 Presumably this will be added later. 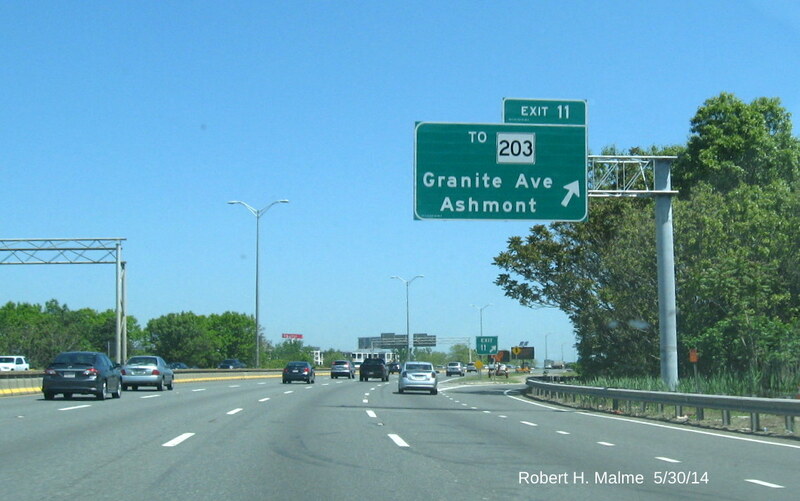 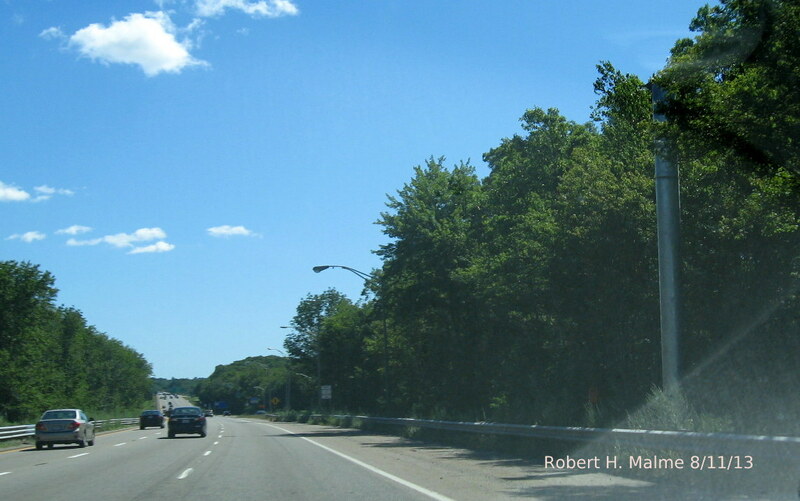 The subsequent MA 28 North sign still needs to be replaced. 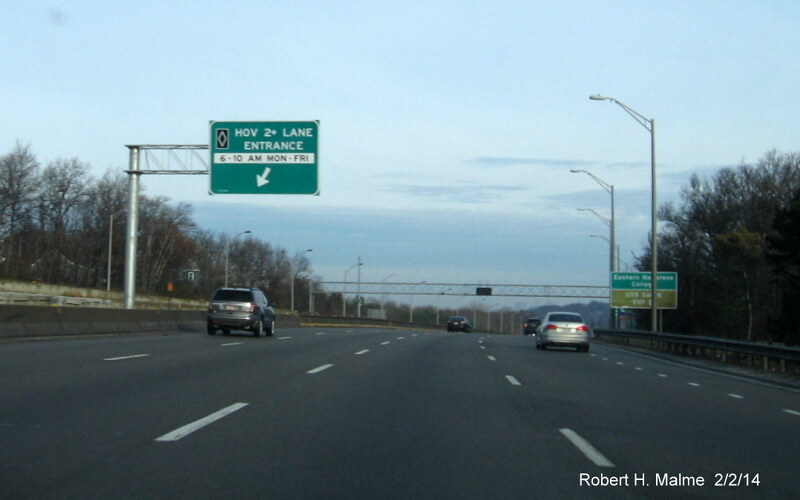 Plans show it is to be paired with a VMS sign over the left-hand lanes. 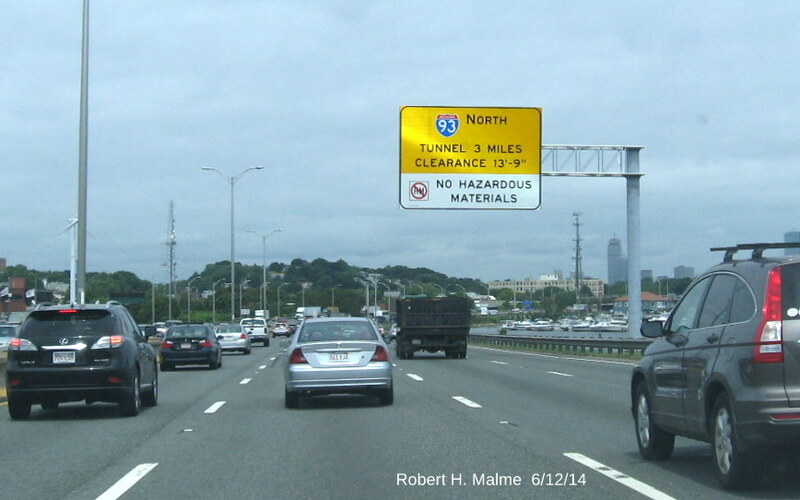 New advance 1-Mile diagrammatic cantilever features an added To I-95 from previous sign, and new Fall River text. 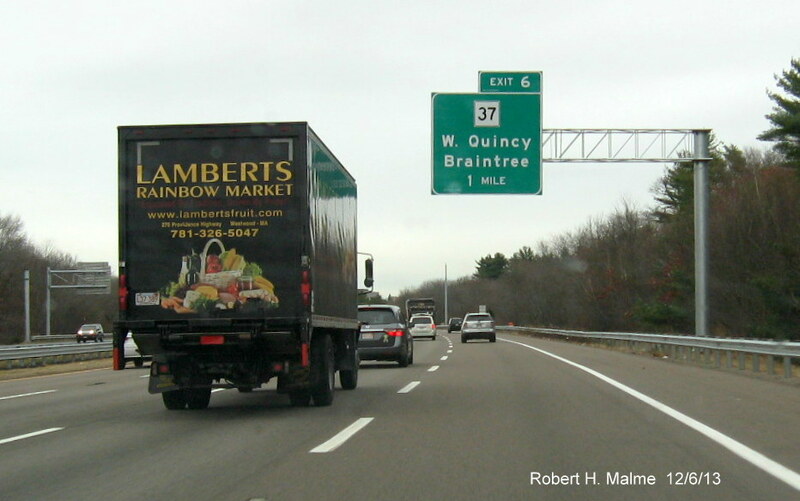 Heading 1/4 mile further south to the new overhead signage at the MA 28 interchange. 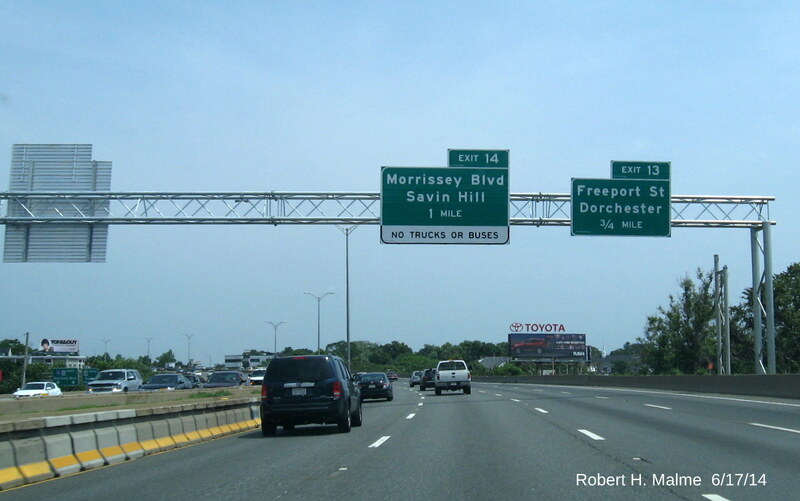 Similar signage was also installed northbound, but the sun angle didn't create the best time for a photograph. 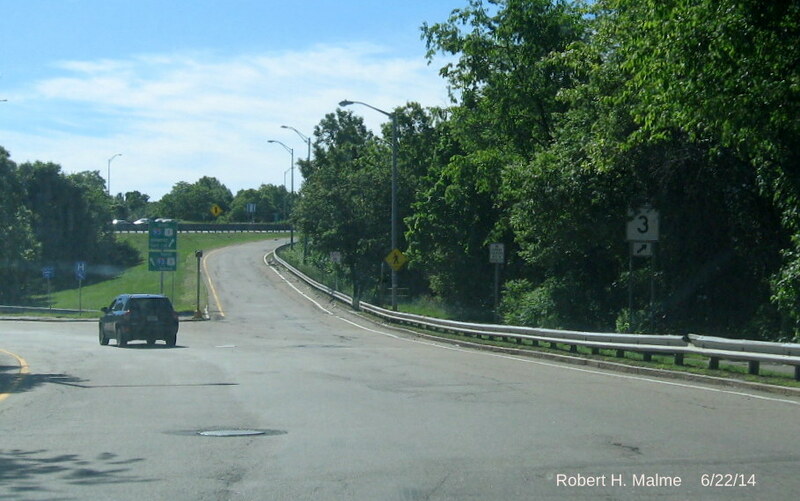 The contractors also placed a new 1/2 mile advance diagrammatic sign for the MA 24 exit, the signs in the distance, at the exit ramp itself, have not been replaced. 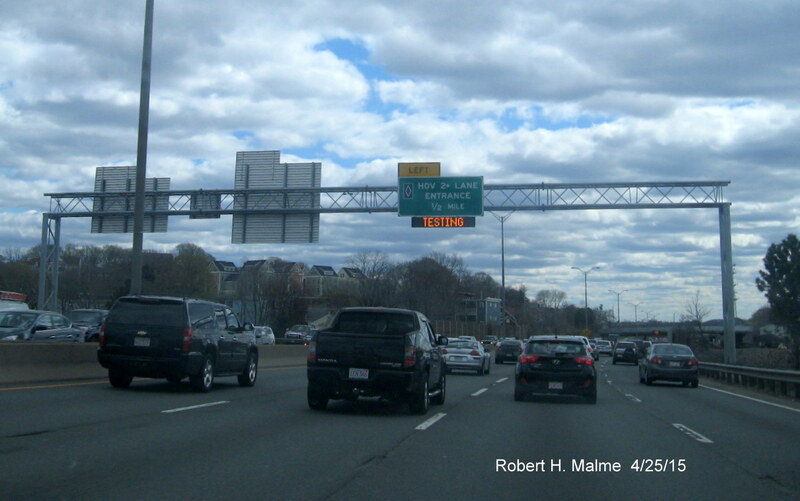 Installed earlier in January was the new overhead sign for the HOV Lane just beyond the merge with MA 3 North at the beginning of the Southeast Expressway. 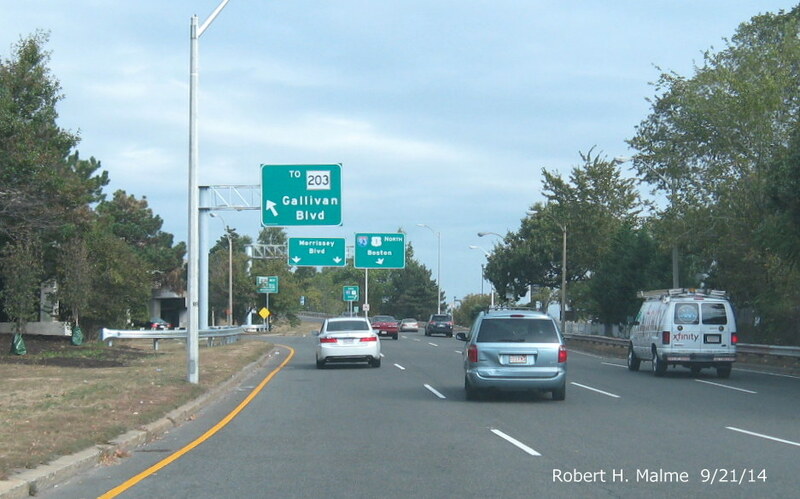 New MUTCD guidance now calls for green advance signage, the previous sign (see photo below) was all white. 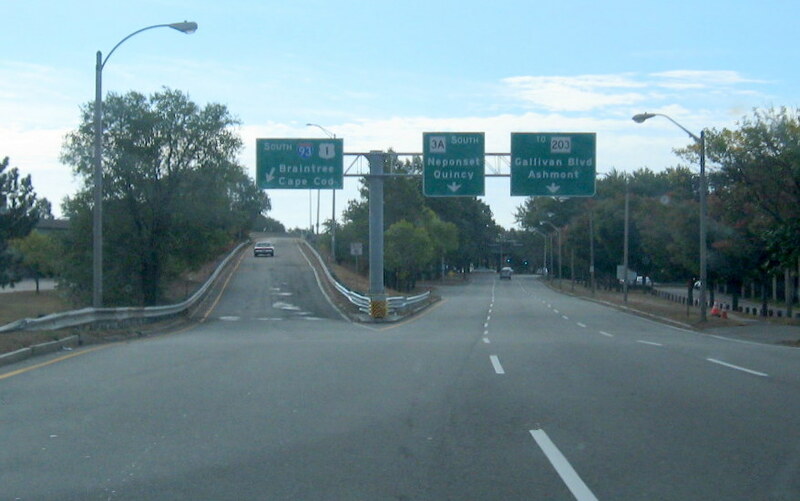 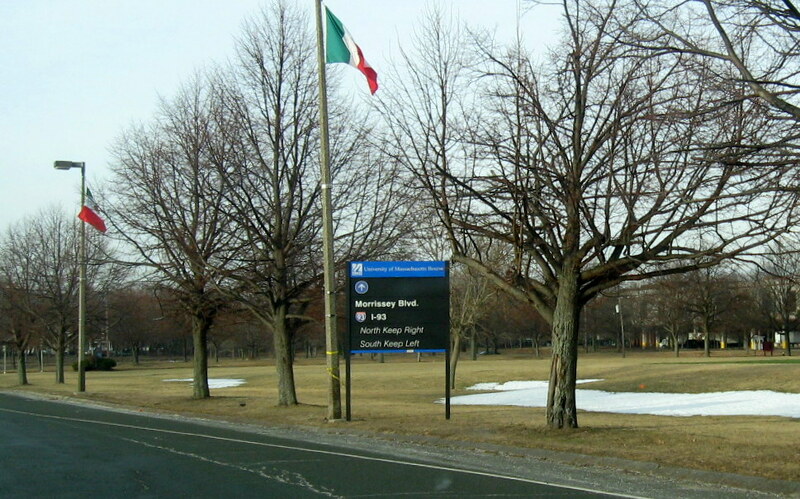 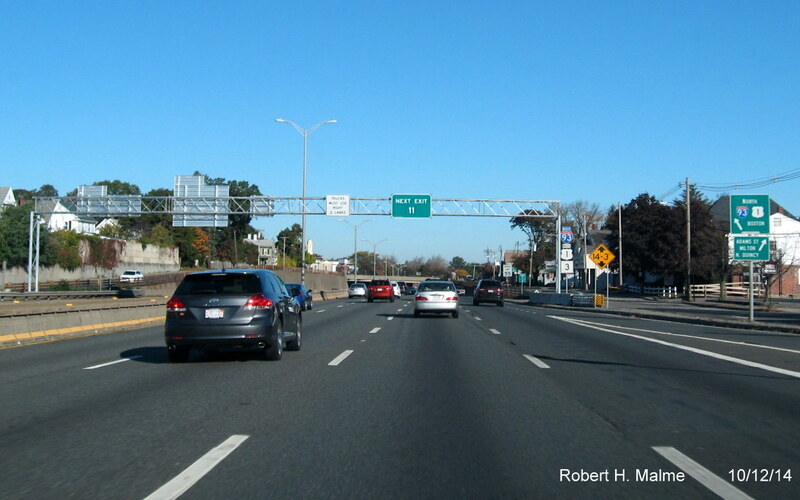 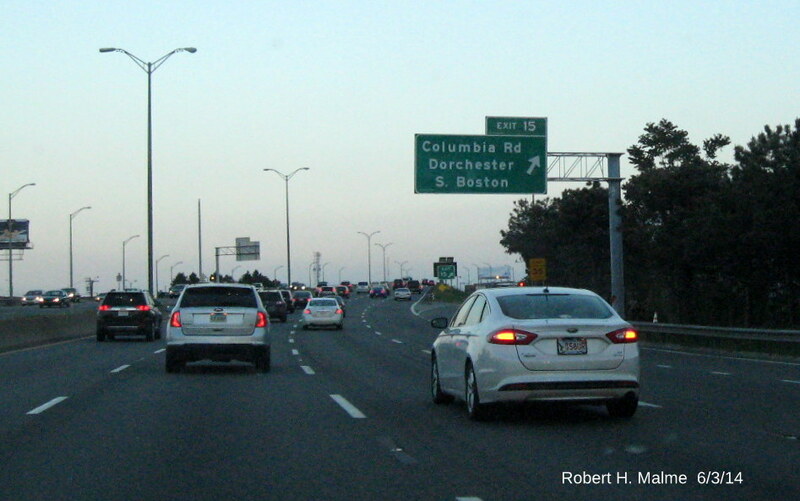 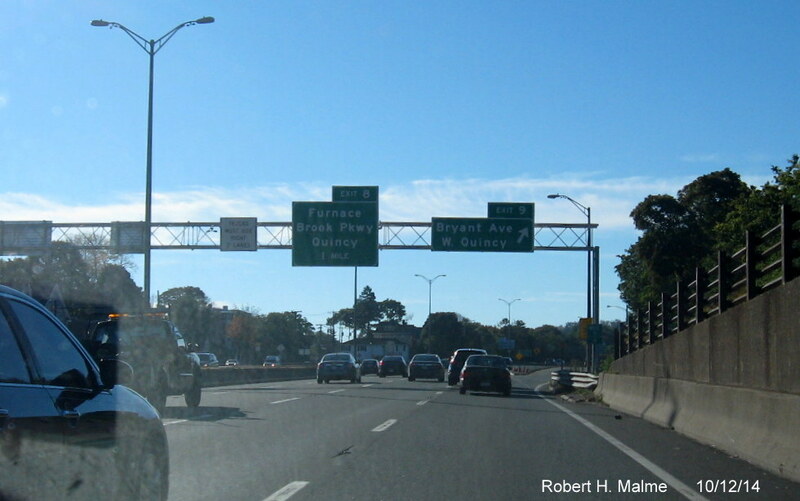 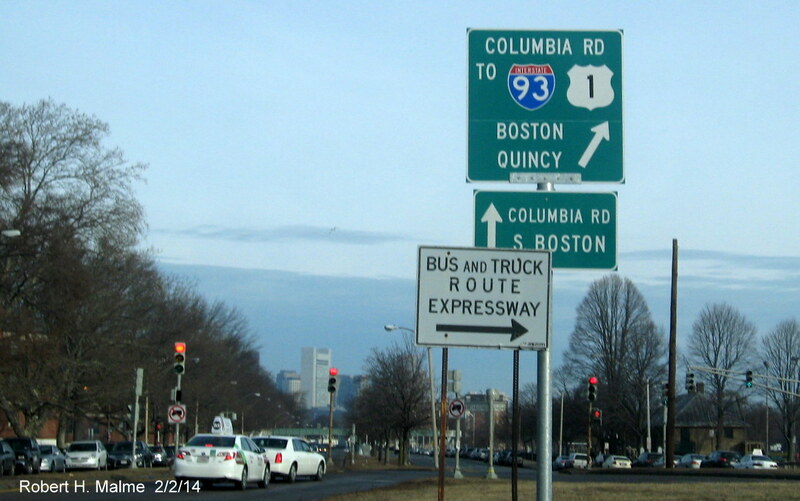 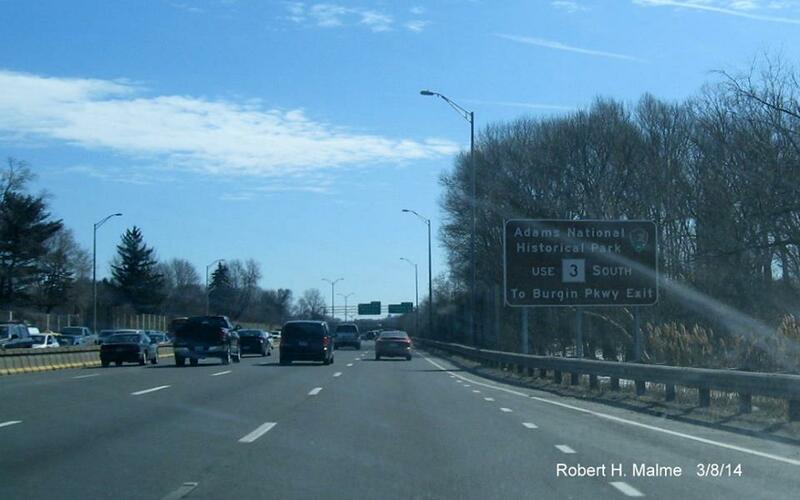 A new I-93/US 1 sign within the Columbia Rd/Morrissey Blvd/Day Blvd Rotary in South Boston put up in January 2014. 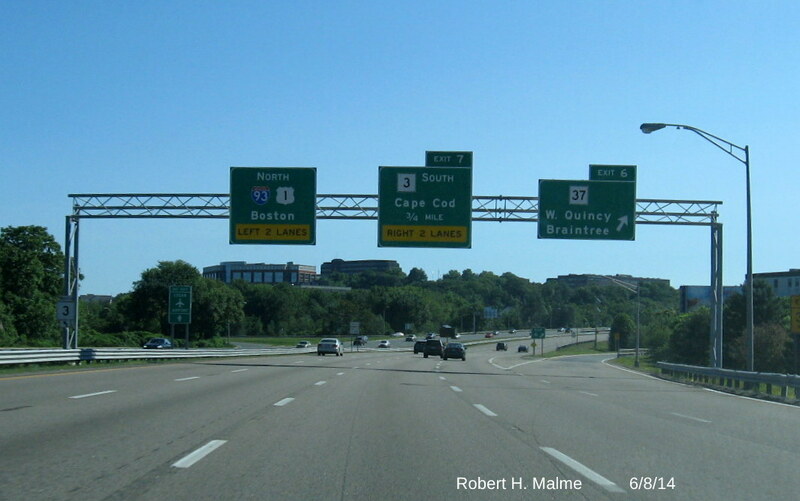 The sign above replaced on of the few remaining MA 3 only paddle signs put up in the early 1970s. 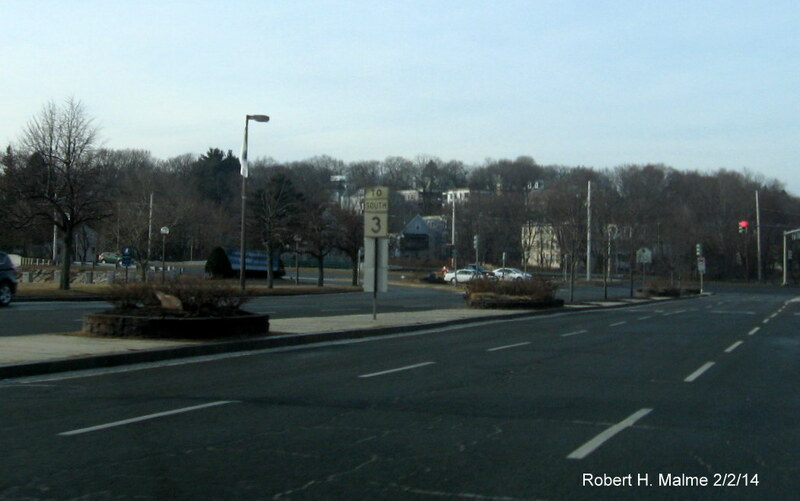 The other one at the rotary entrance was removed. 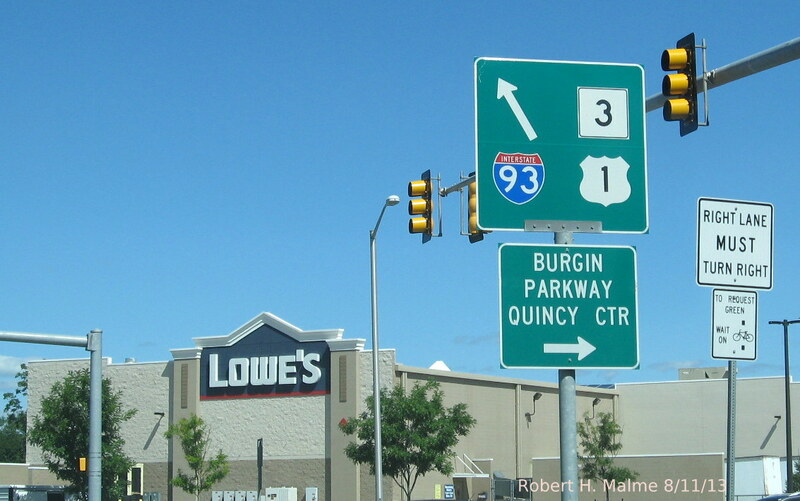 Another new sign along the rotary heading toward the Columbia Road interchange. 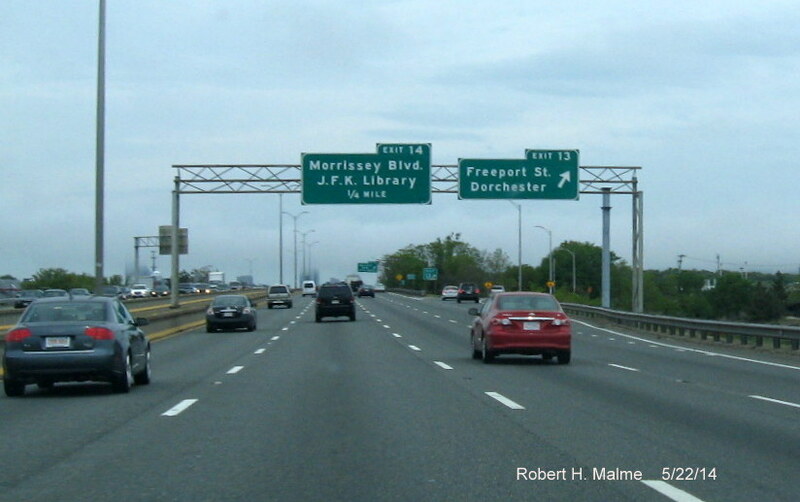 New guide signs were installed as well along Morrissey Blvd with its intersection with Freeport St, but not as of yet at the ramp from Freeport St to I-93/SE Expressway South. 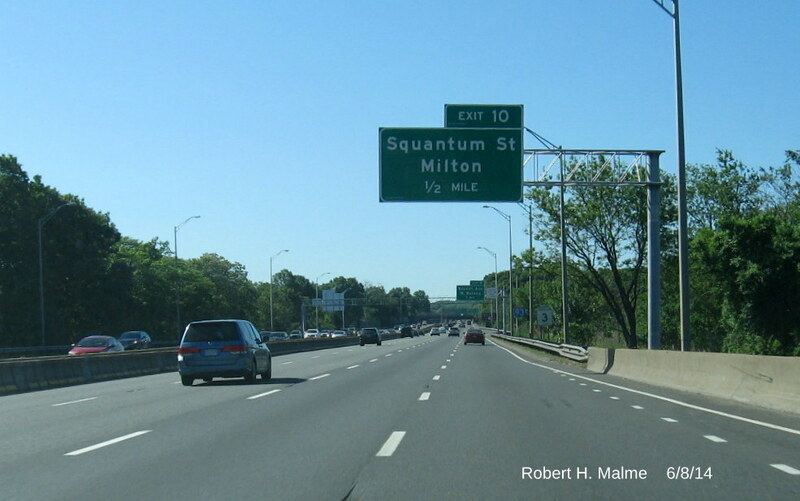 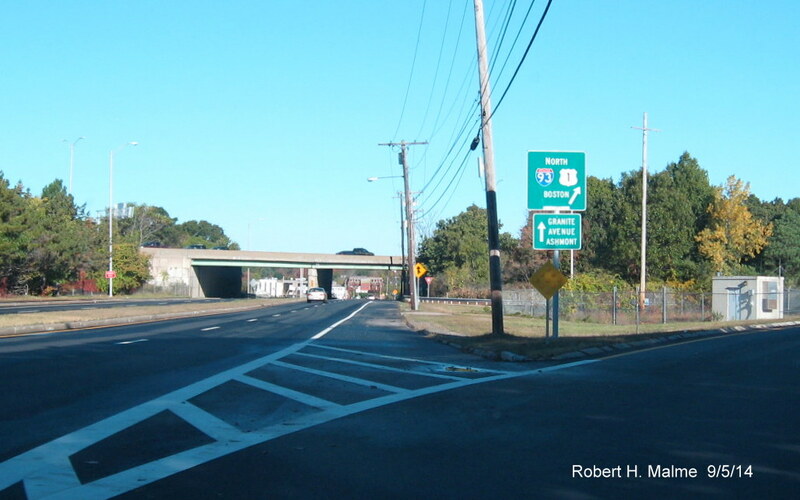 That and a I-93/MA 3 paddle sign along Southampton Street are the only remaining ones in need of replacement according to the contract plans. 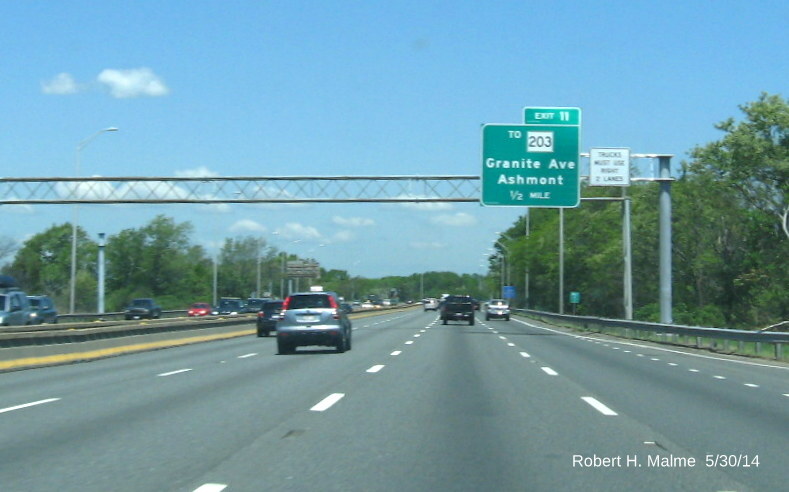 Newly installed cantilever overhead 1/2 Mile Advance sign for MA 28 Exit Southbound (1 Mile Advance also installed, photo to come). 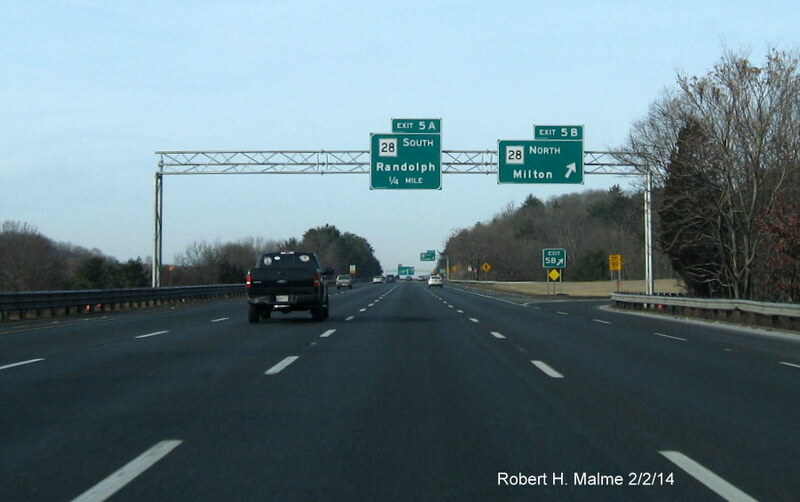 Placed about the same time, but photo taken a couple weeks later, is the 3/4 Mile Advance sign on I-93/US 21 North just before the merge of MA 3 and the start of the Southeast Expressway. 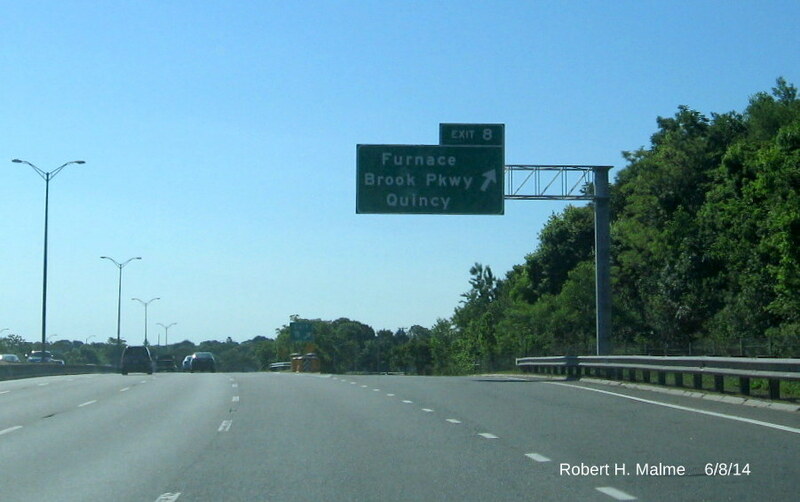 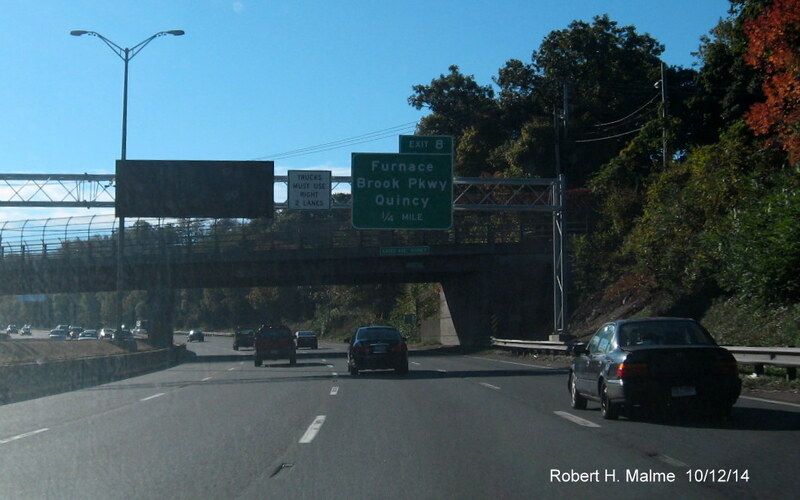 Recently installed ground mounted auxiliary sign for I-93 HOV lanes is 1/10 mile south of preexisting center-mounted 'new style' exit sign for Furnace Brook Parkway, put up under the MA 3 Sign Replacement Project in 2009. 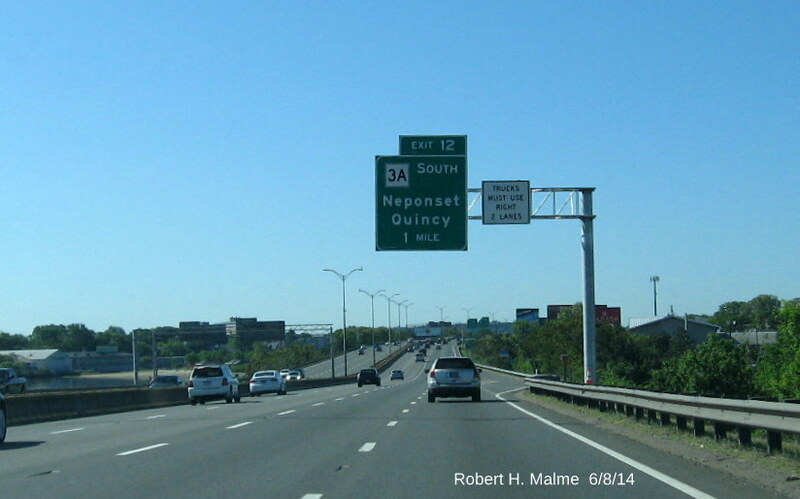 Newly installed Auxiliary sign, replacing ground mounted version for MA 24 Exit on I-93/US 1 South in Randolph. 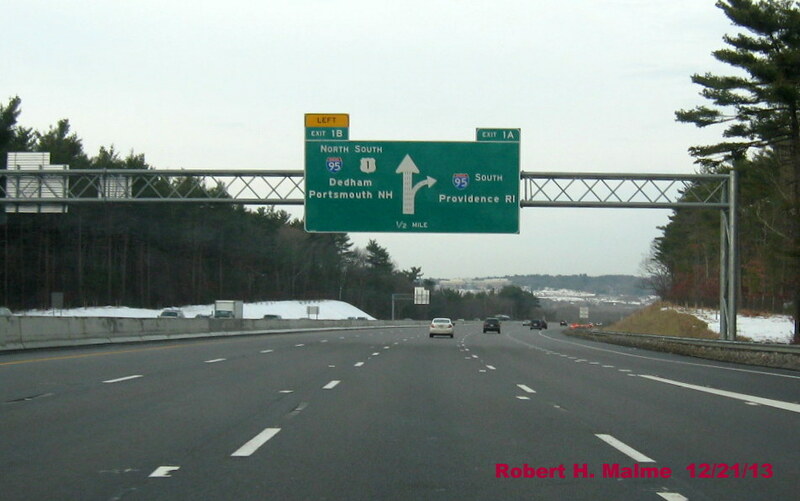 First of two advance overhead signs for MA 37 Exit Placed on I-93/US 1 North the night of December 5-6. 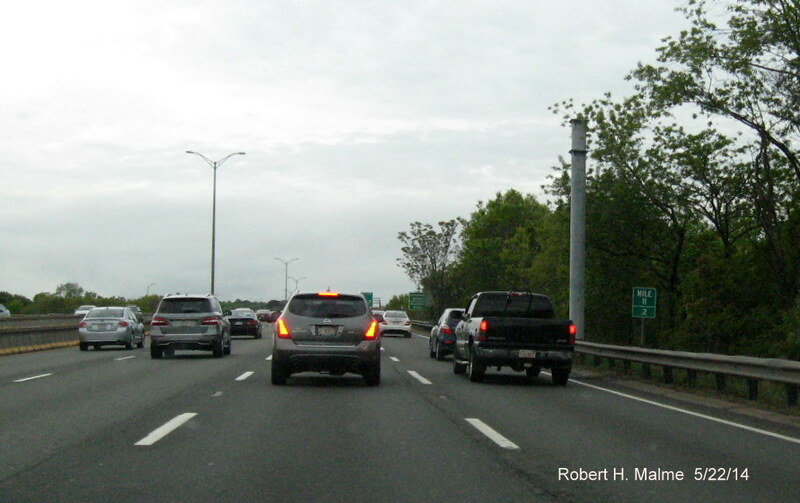 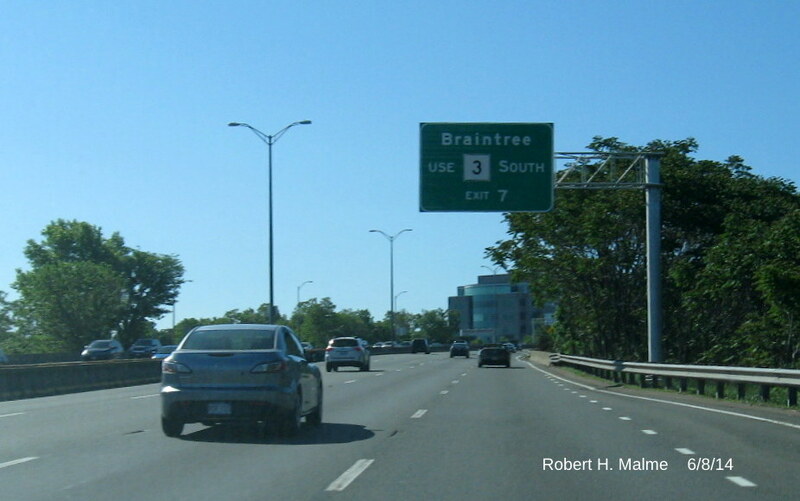 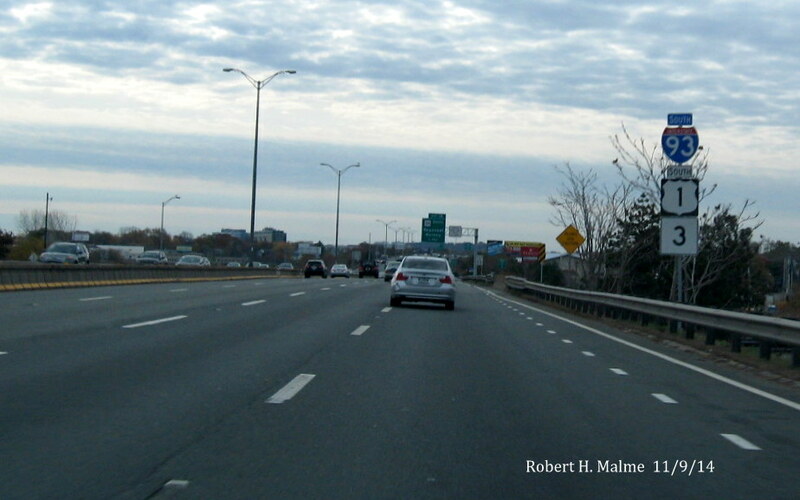 Photo across the highway of support post for new overhead sign for MA 37 exit on I-93/US 1 South in Braintree. 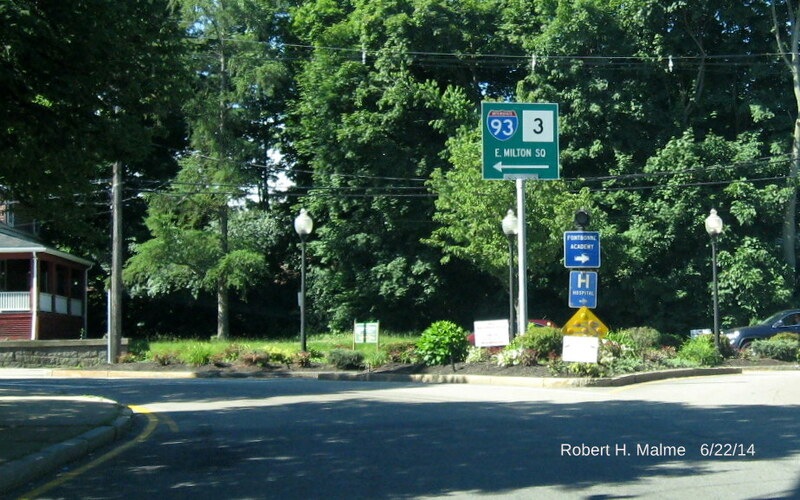 These were placed during the night of August 1-2, 2013. 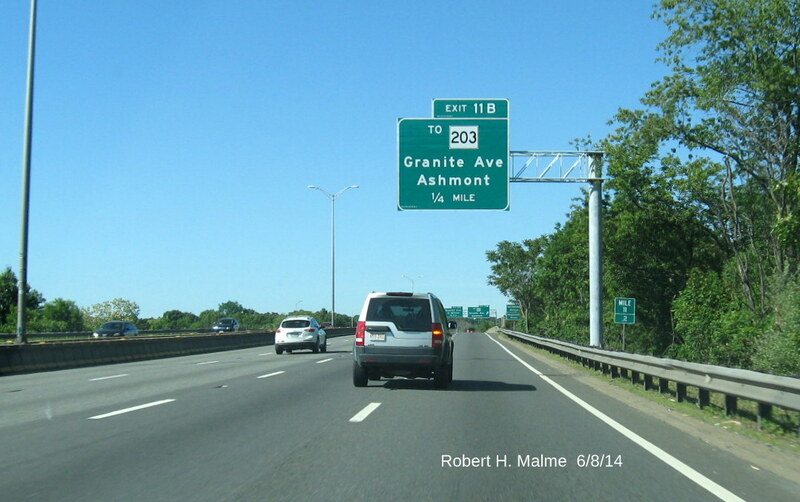 The new 1/2 mile advance sign on I-93/US 1 North though will be behind the existing cantilever sign. 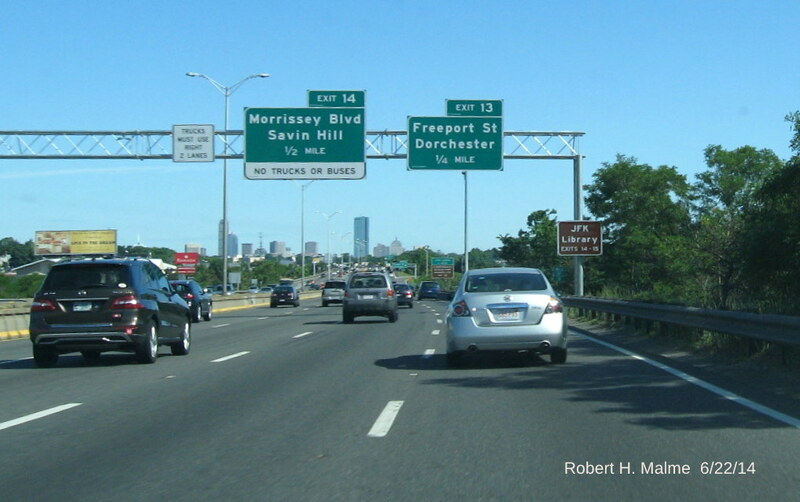 This new ground-mounted sign does not have the T logo, unlike the current sign seen on the right beyond the on-ramp, which is apparently prohibited under current signing guidelines. 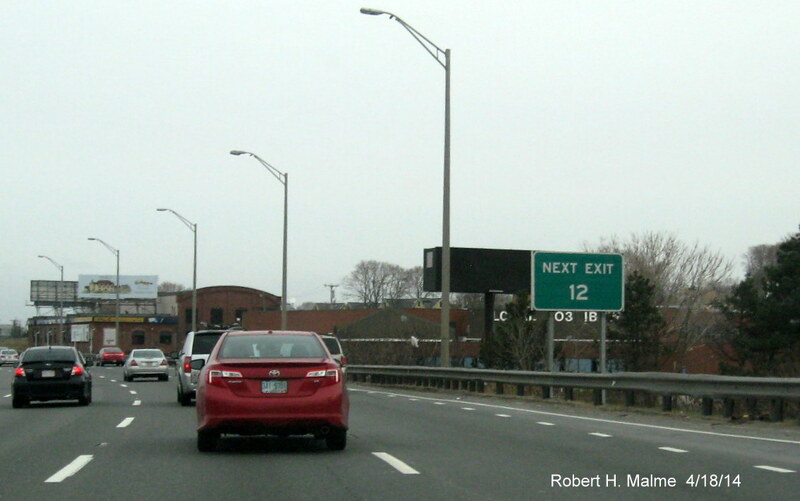 Also notice no exit number on the sign so to prevent confusion between I-93 and MA 3 exit numbers (The exit for the T is Exit 19 on MA 3). 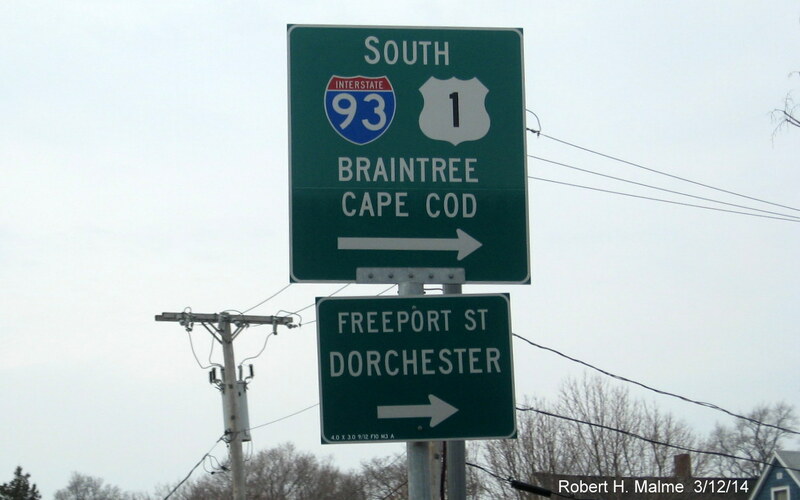 The contractor also has started installing signs noting town boundaries which are larger than previous MassDOT versions (yet are supported by 1 pole, the previous one used two). 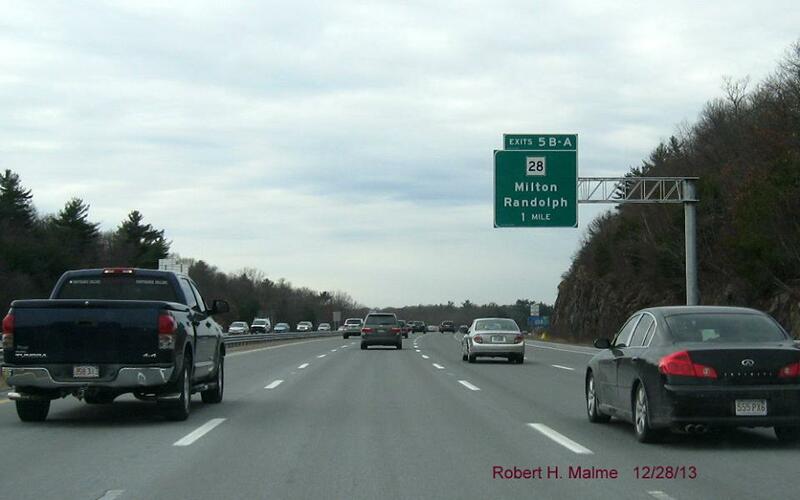 This is one of the newly installed on-ramp signs from MA 28 in Randolph for I-93/US 1. 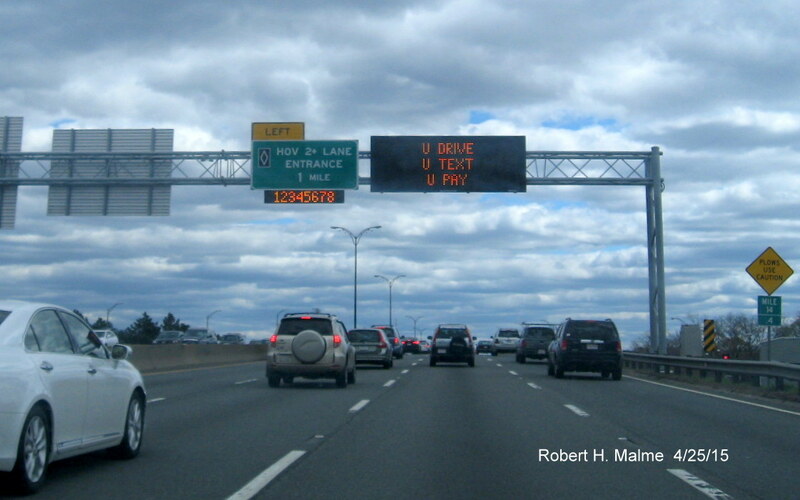 This one on MA 28 South. 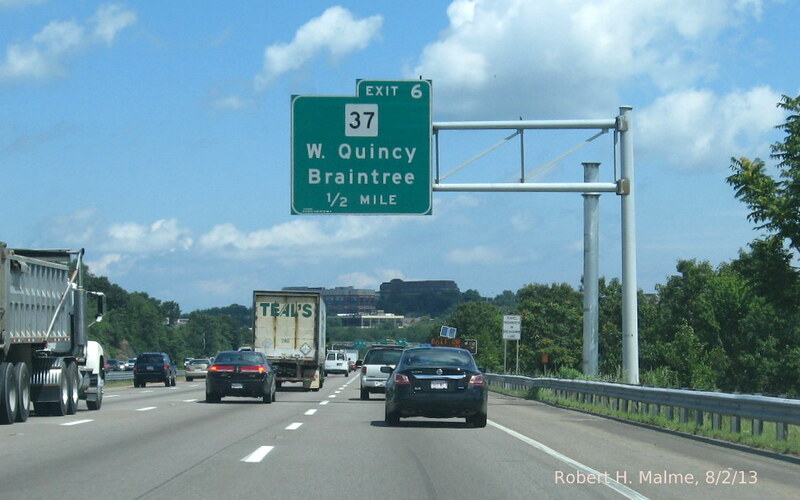 This one is from MA 28 North, notice the two control cities going this direction, apparently those heading south do not need to go to Braintree. 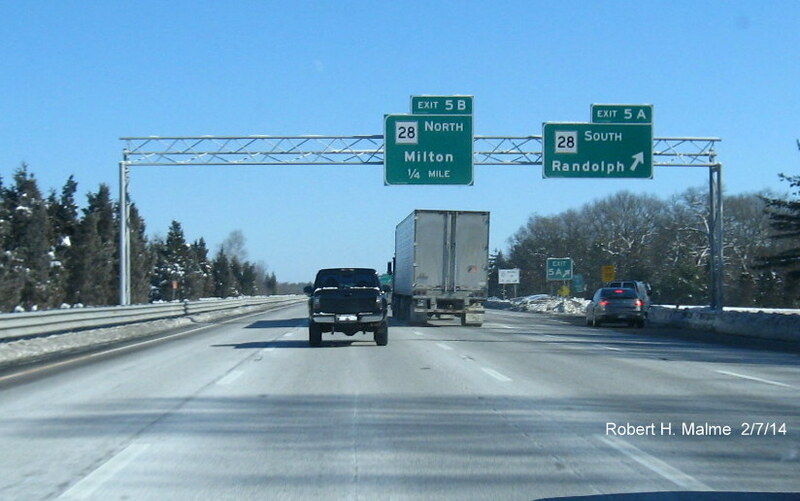 MassDOT revised the exit signage for the I-95 interchange at the end of I-93 in Canton in mid-December adding suffixes for both directions of I-95, shown on the 2 mile advance sign on the Ponkapoag Trail Bridge in Milton. 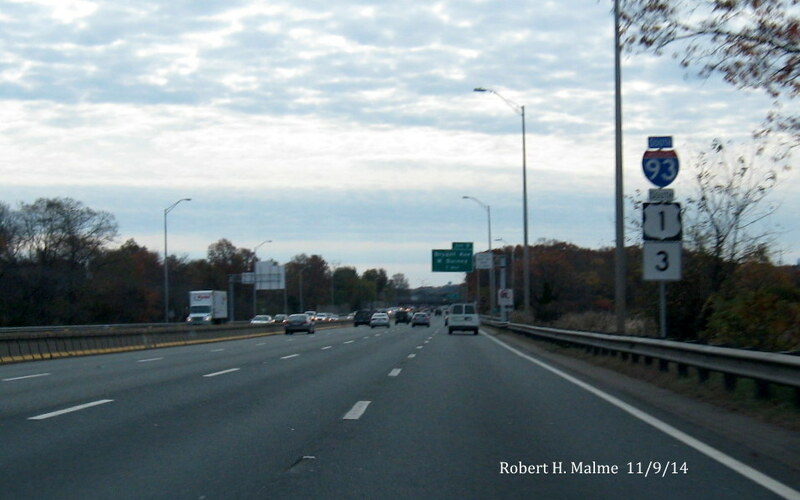 Here is the changed overhead signage put up in 2012 for I-93/I-95 Add-A-Lane Project now with new Left hand Exit tab and number with 1 1/4 mile distance needed due to location of MA 138 Exit signage. 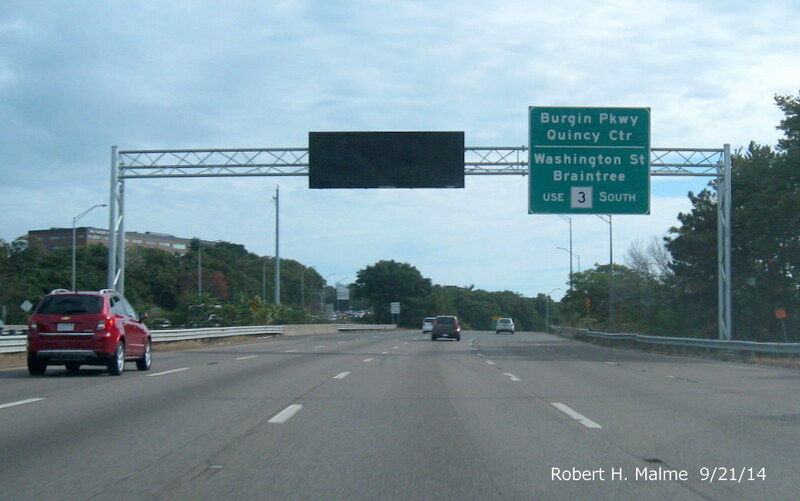 Left-hand Exit 1B Tab placed upon preexisting diagrammatic overhead 1/2 mile before I-95 interchange on I-93/US 1 South in Canton. 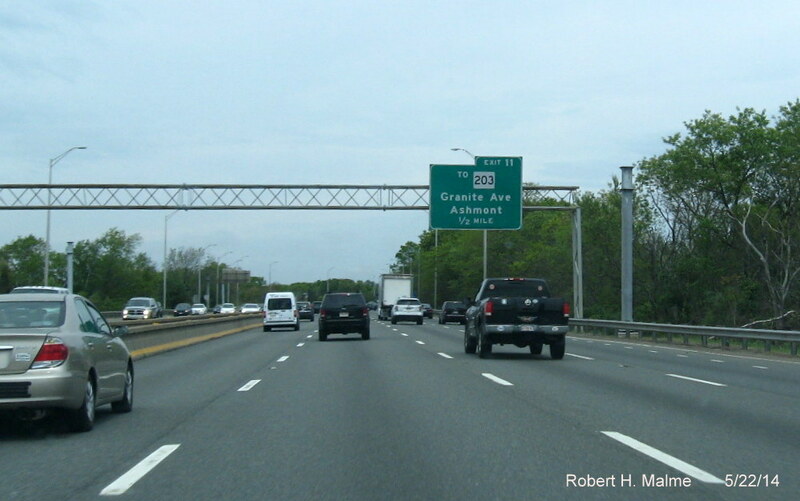 New left Hand Exit 1B Tab placed upon preexisting I-95 North/US 1 South overhead sign at I-95 South Off-Ramp in Canton (also Gore Sign now reads Exit 1A). 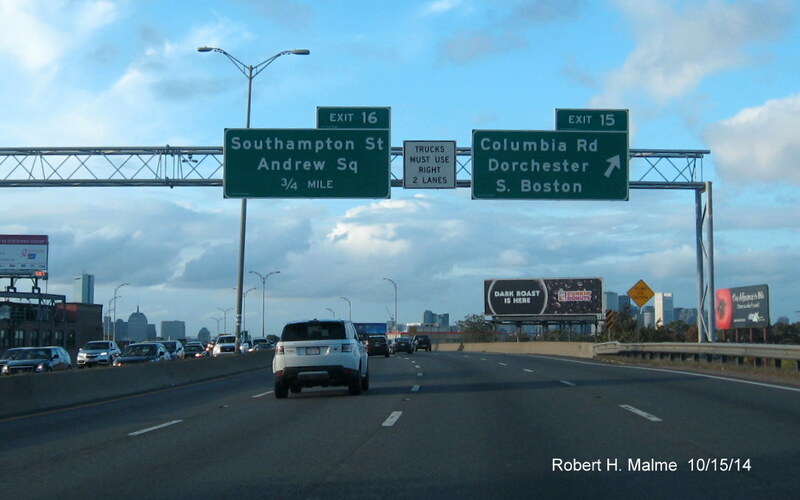 Photo of implied I-90/I-93 concurrency from overhead sign near South Station in downtown Boston. 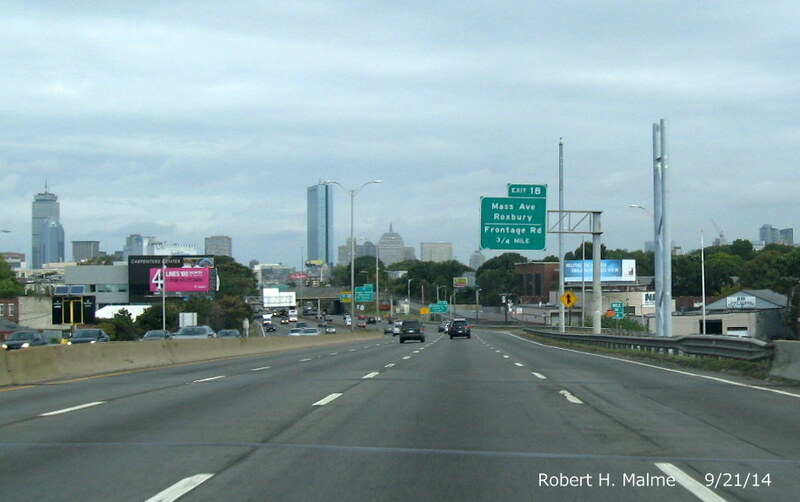 Photo of Mass. 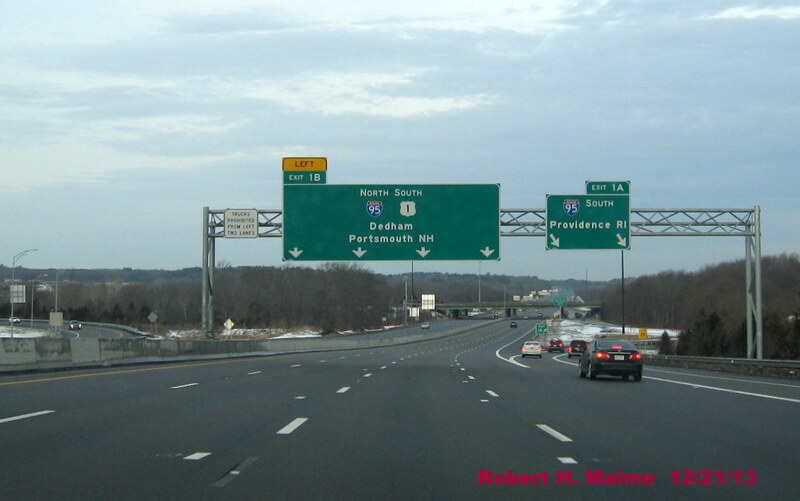 Guide Sign indicating route to 'I-93/US 3' on Forbes Road in Braintree. 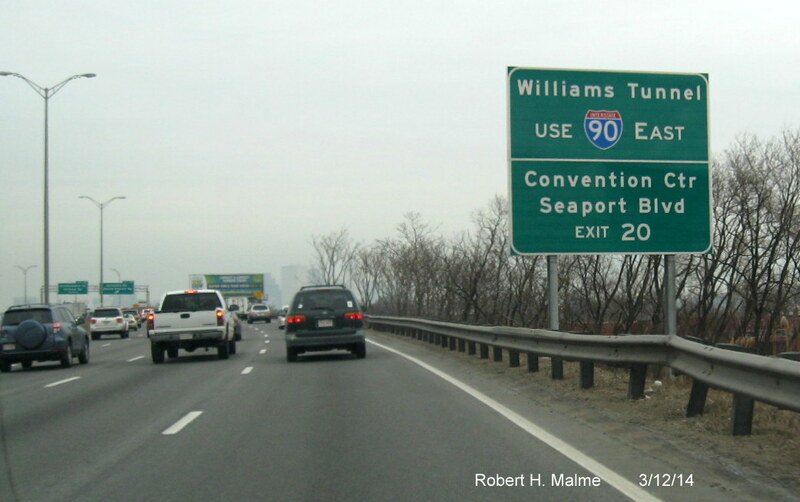 According to text on reverse, sign was installed in October 2012. 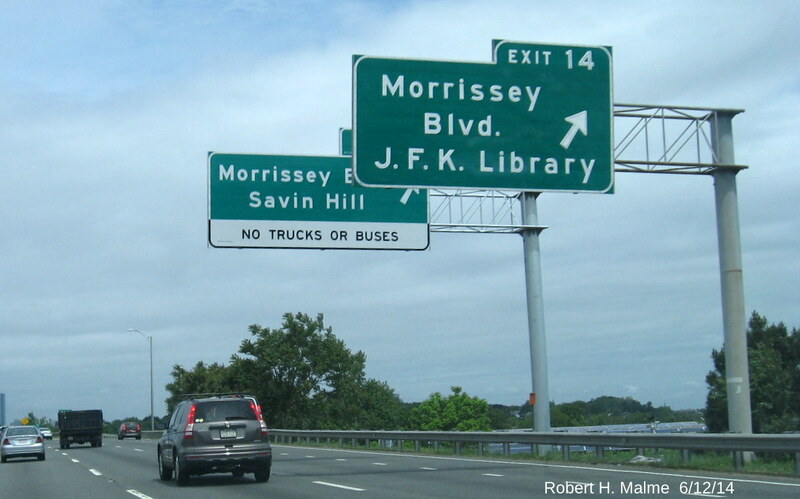 Will mistake be corrected any time soon? 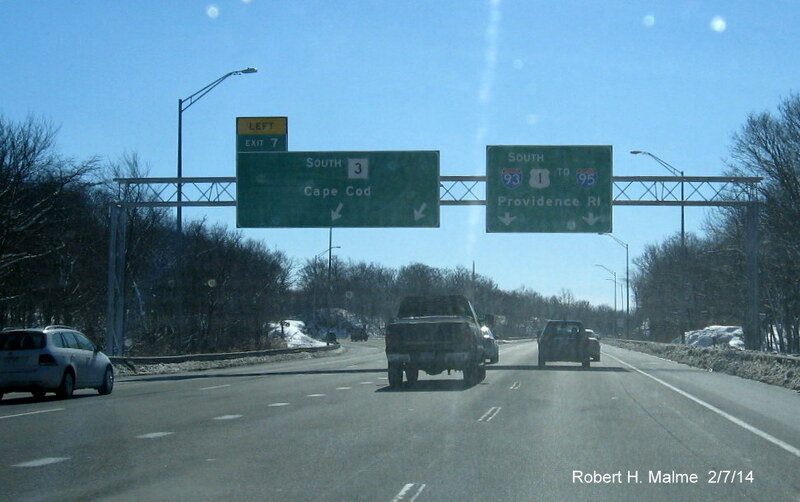 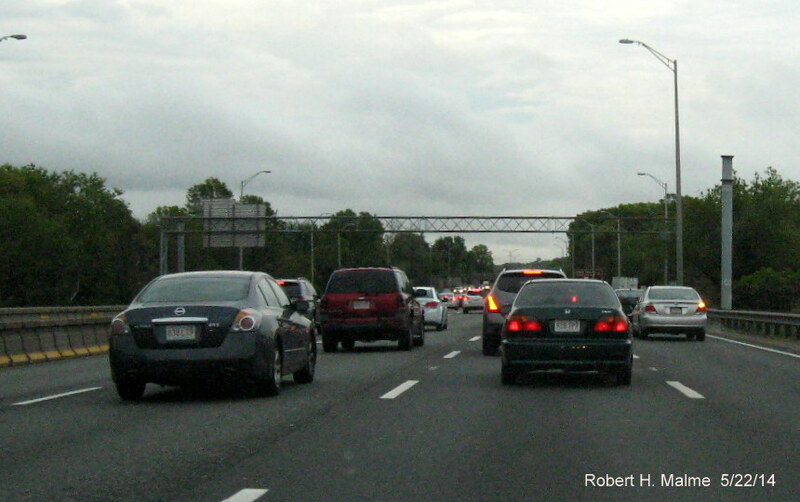 Photo of overhead signage for I-93 North on I-95 North in Canton. 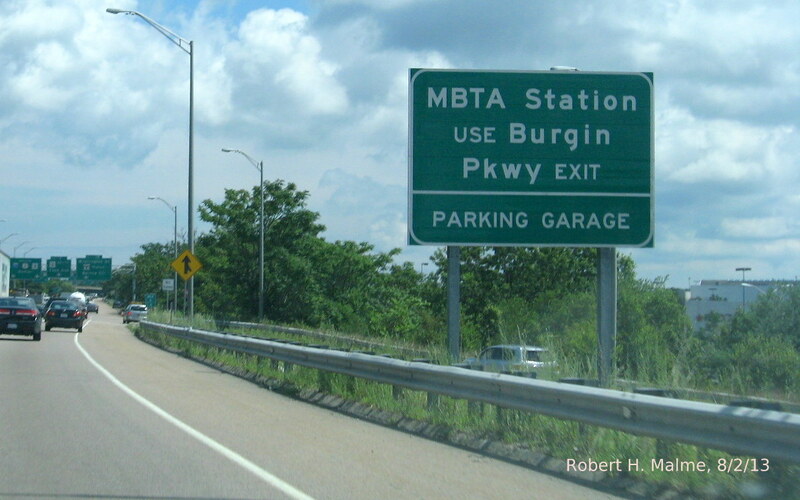 Signage put up in late 1990's. 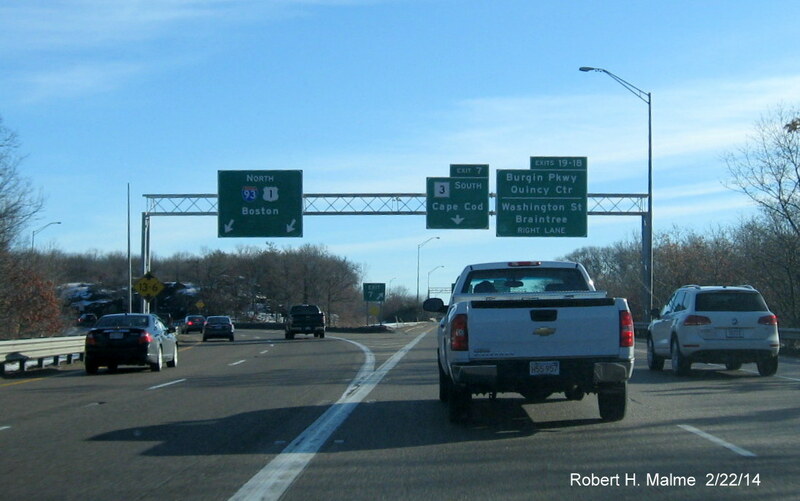 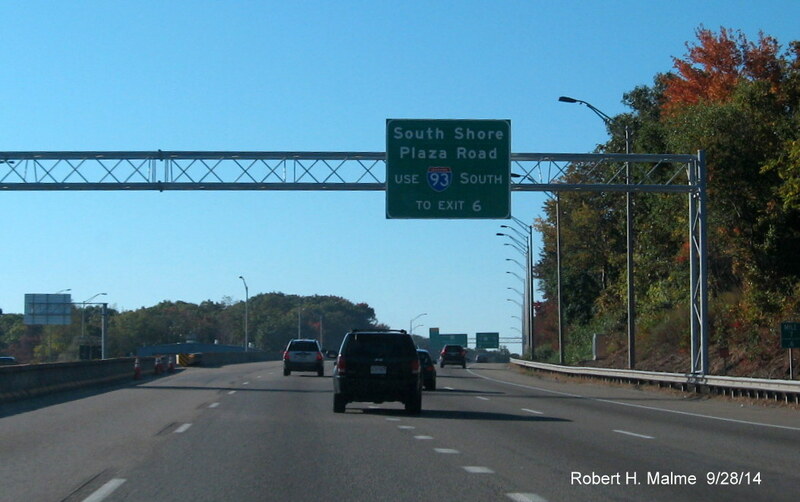 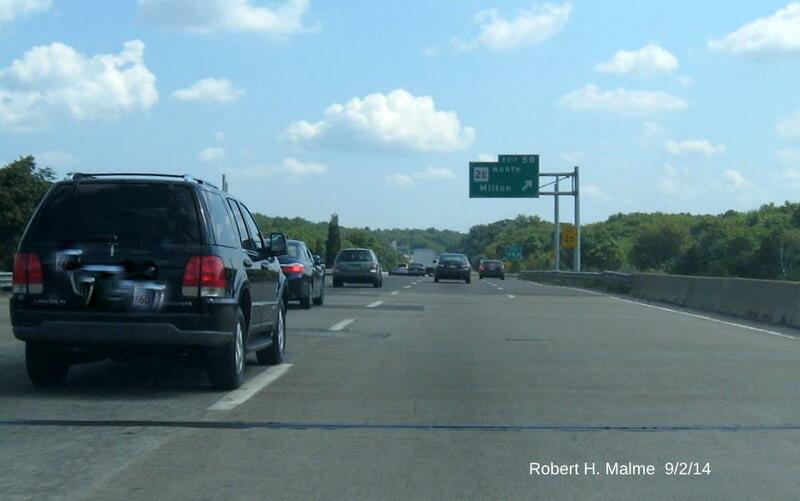 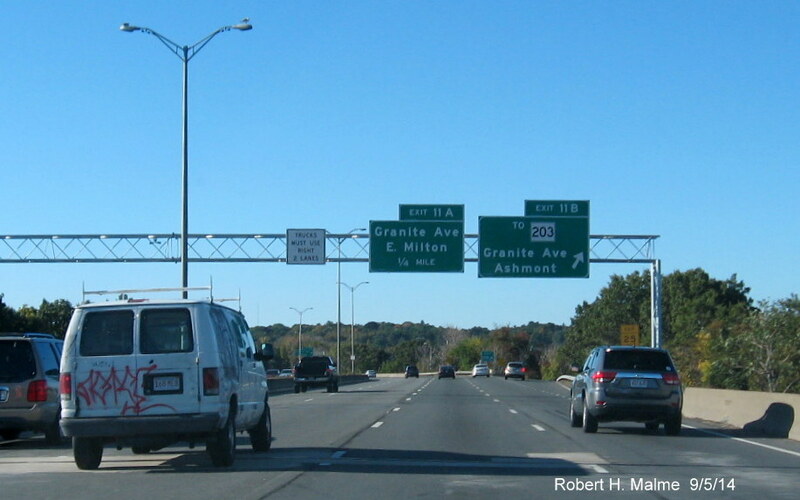 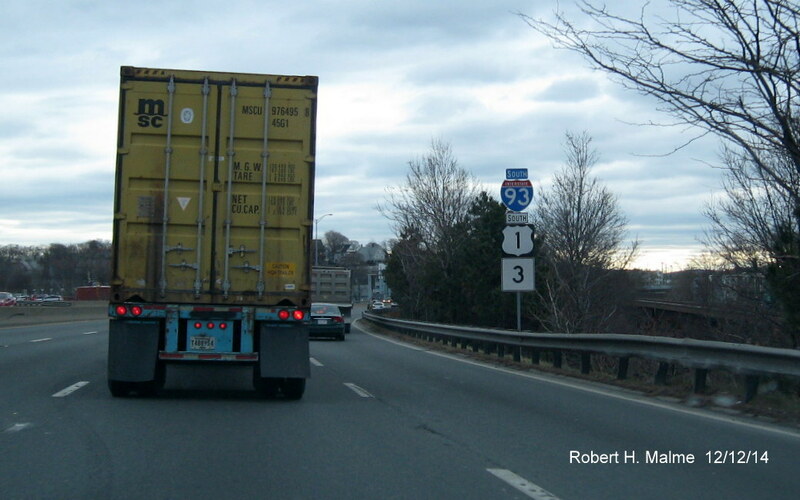 Visit the I-93 Exit List page to check out possible future exit numbers along that route.